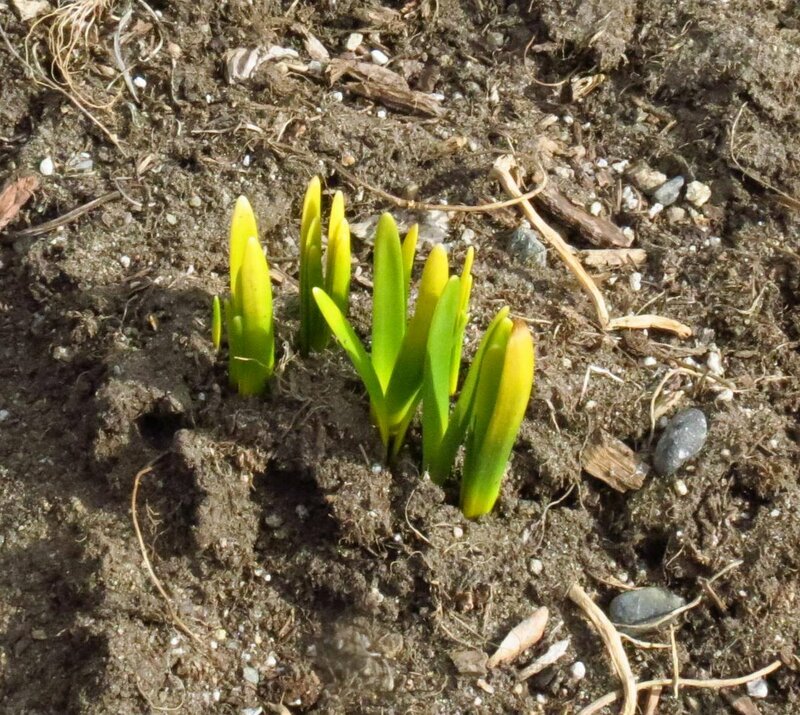 Spring is happening, but ever so slowly this year. April showers have come along right on schedule and though they’ll take care of the remaining snow they’ll also enhance mud season, which has already been a bear. 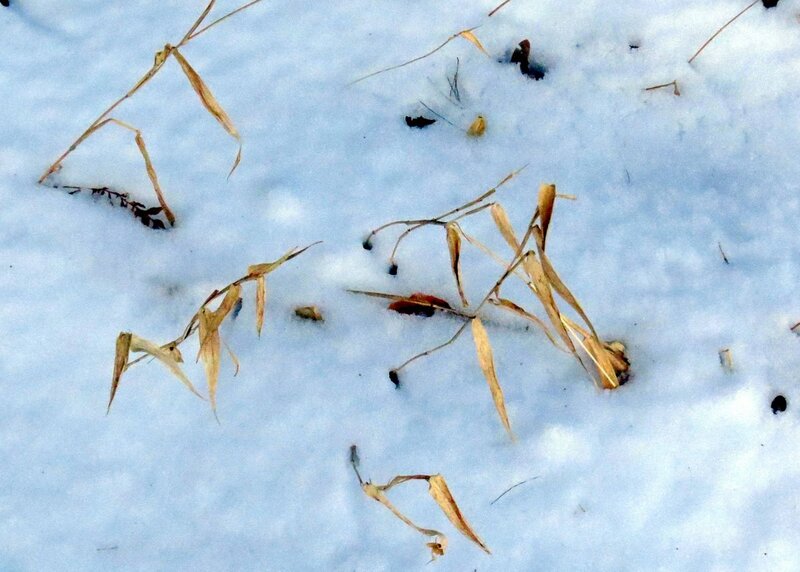 The ground froze deeply this year and the deeper the freeze the worse the mud. 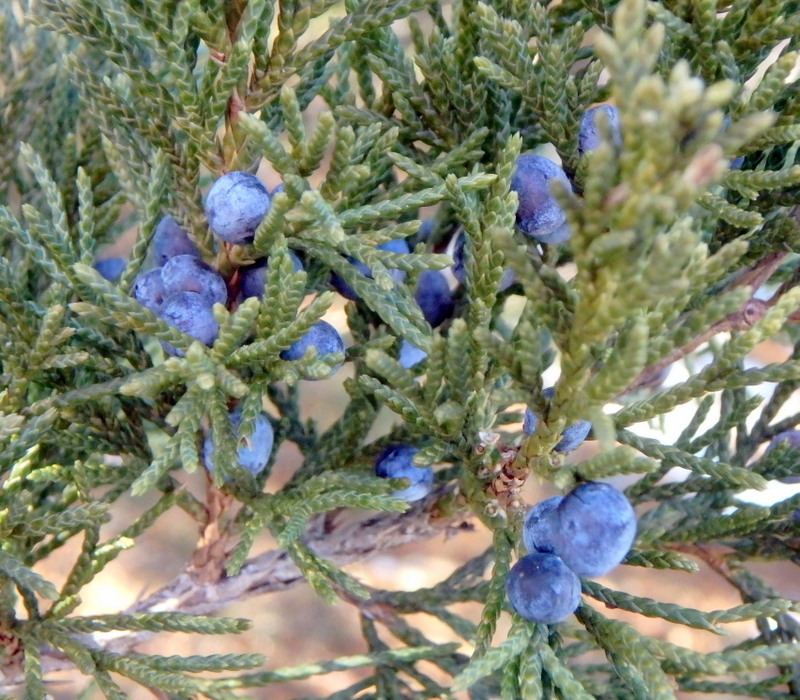 None of this has anything to do with the above photo of juniper berries but I love their color and I was surprised that the birds hadn’t eaten them yet. From a distance I saw what looked like a patch of small yellow flowers. 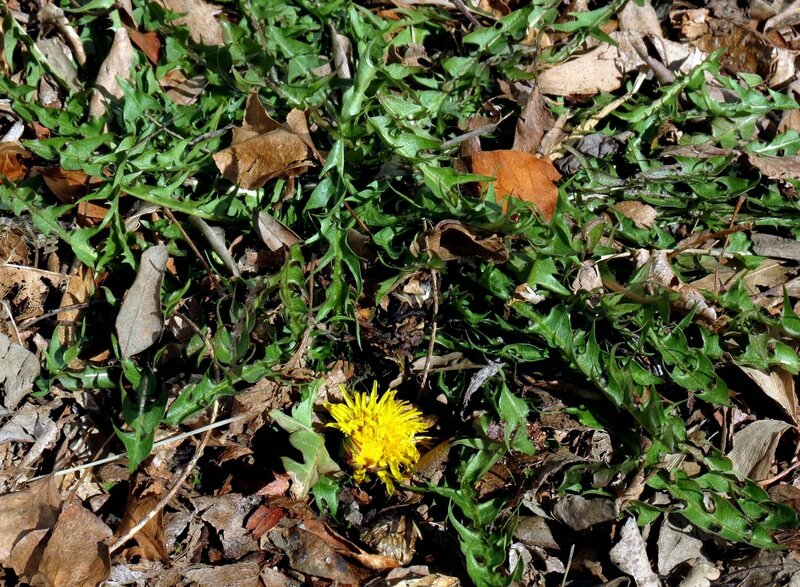 I couldn’t even guess what yellow flowers besides maybe coltsfoot or dandelions, would be blooming in March. But they weren’t flowers at all. 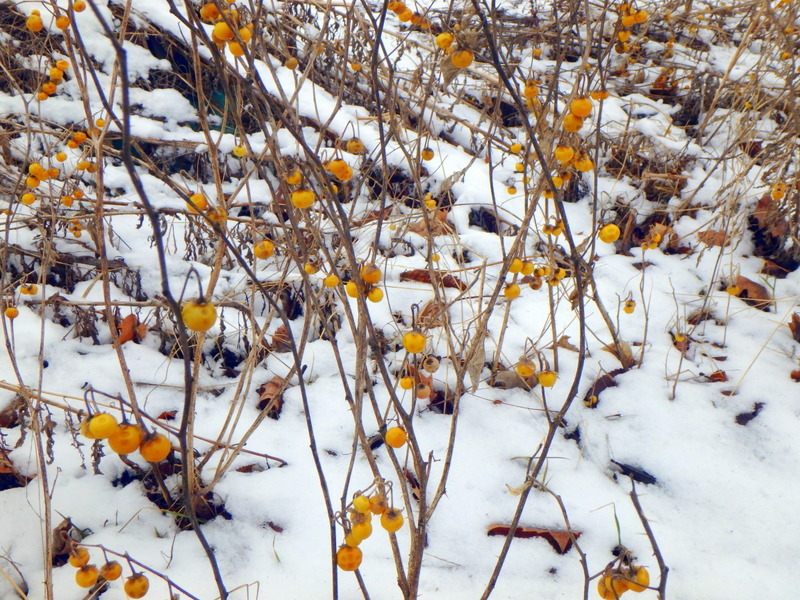 They were the fruit of horse nettle plants, hundreds of them. 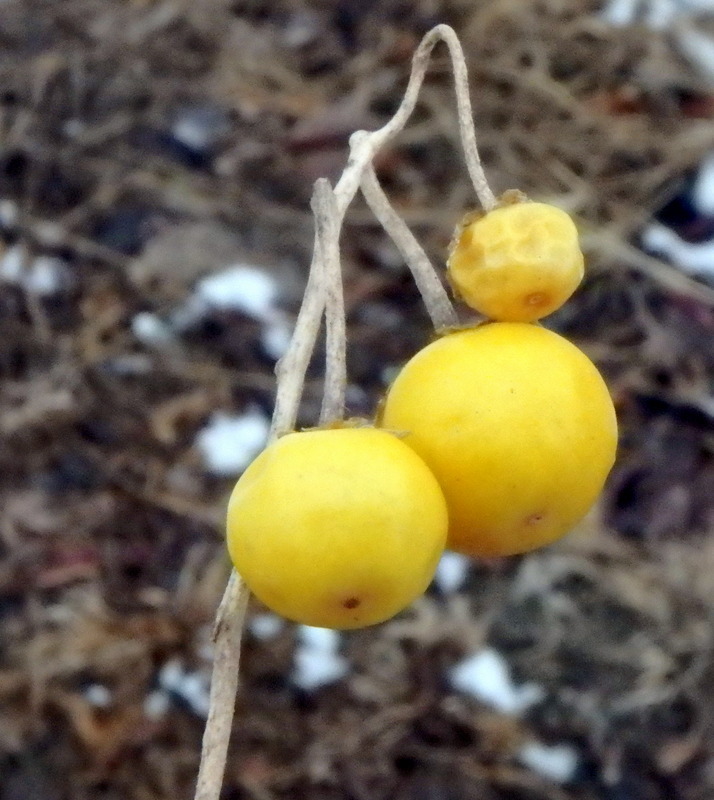 Carolina horse nettle (Solanum carolinense) isn’t a true nettle but instead is in the nightshade family, along with tomatoes and potatoes and many toxic plants. This plant is also toxic, enough so to be named devil’s tomato. It contains alkaloids that can make you very sick and which have caused death. There are also spines on the leaves which can break off and embed themselves in the skin. 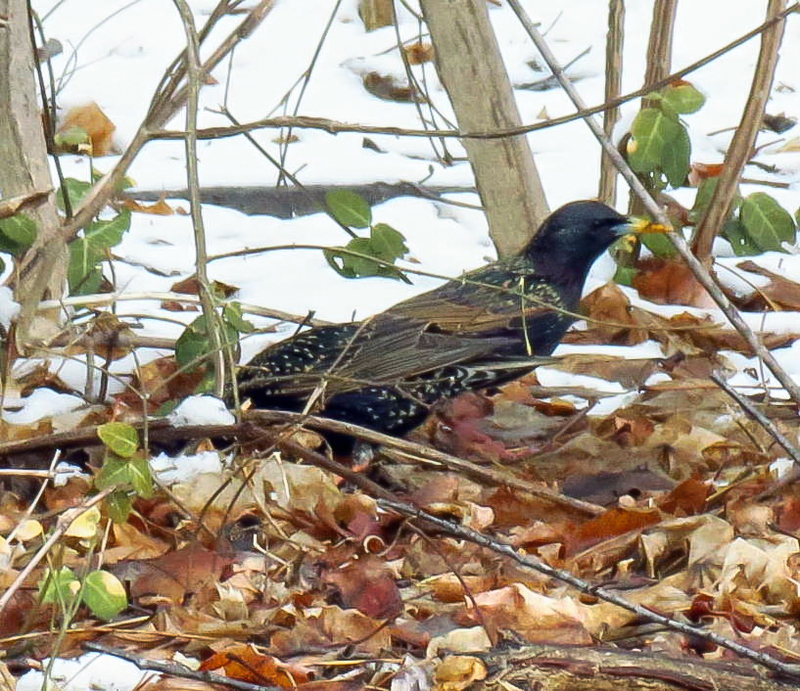 Skunks, pheasant, and turkeys are said to eat the fruit but it didn’t look to me like a single one had been touched. Nothing seems to eat the stems or foliage. 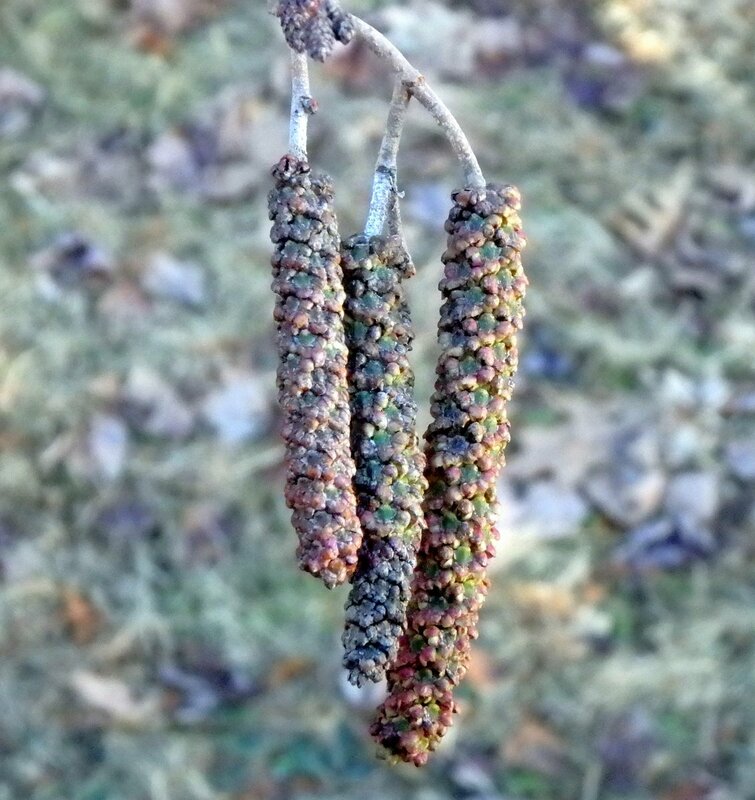 I saw these pretty buds on a small ornamental tree in a local park. It had a weeping habit and couldn’t have been more than six feet tall with many weeping branches. 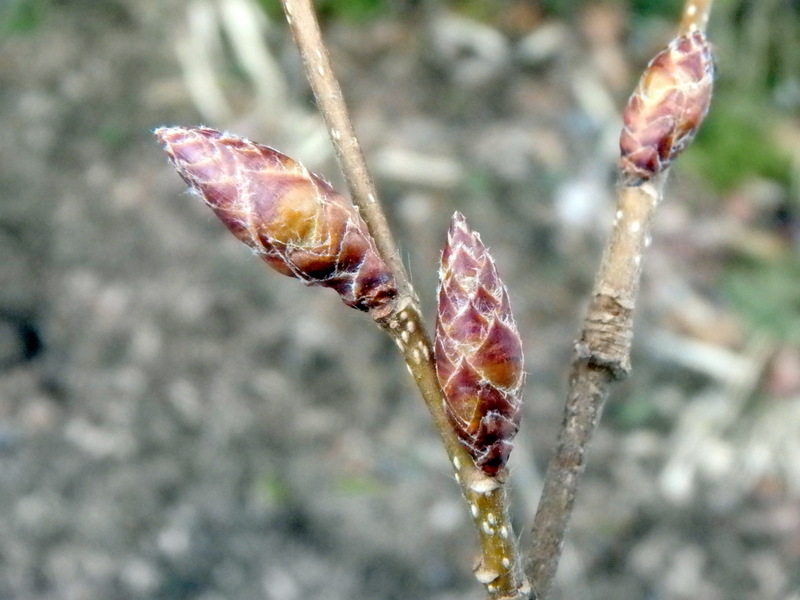 I thought it might be some type of elm but elm buds are flattened, not round, so in the end I’m not sure what they were. 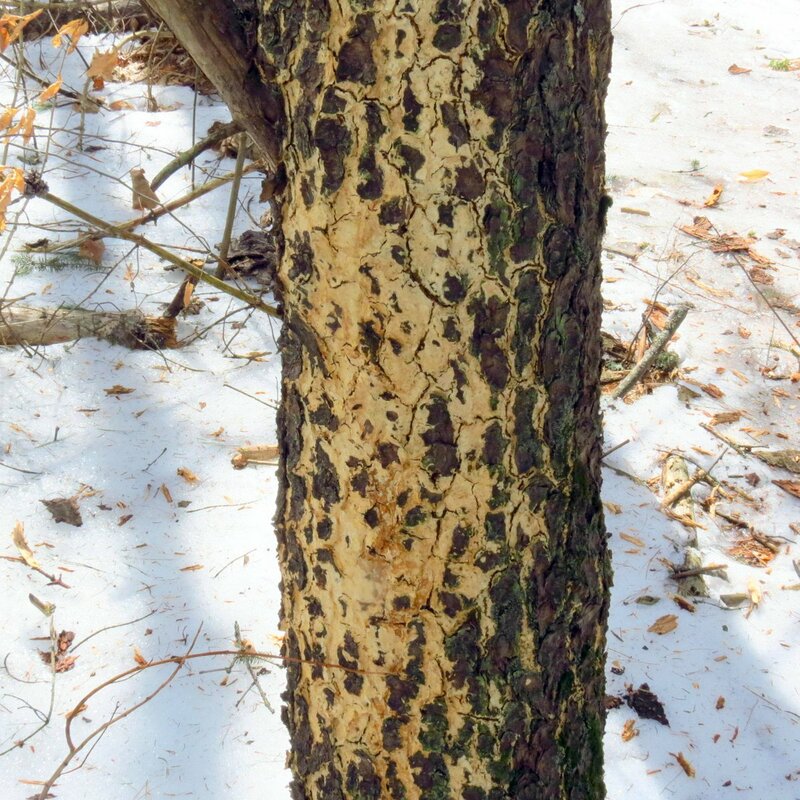 This shows what happens when a sap spigot, actually called a spile, isn’t removed from the tree after sap season. The tree has almost grown completely over this one and has squeezed what should be round into a teardrop shape. The crushing power of the wood must be incredible. 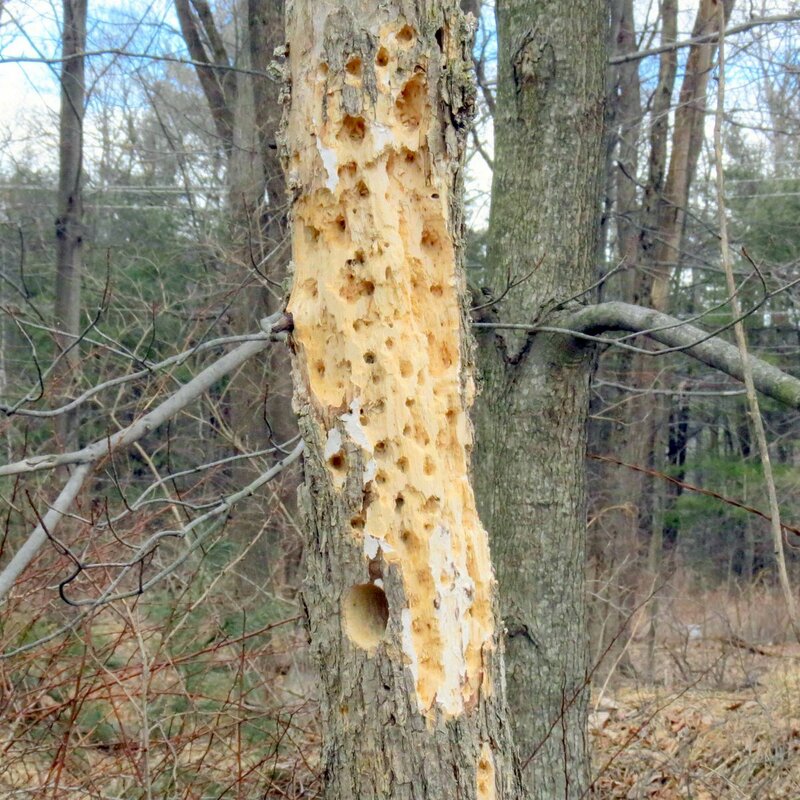 This photo that appeared in a previous blog post shows what a spile looks like when the tree hasn’t grown over it. Things like this inside trees are a woodcutter’s nightmare. Spiles started out as simple wooden pegs which were hammered into a hole in the tree to direct the sap into the buckets which were hung from them but these days they are made from galvanized steel. I found this mullein plant (Verbascum thapsus) growing up through the pavement in an old abandoned parking area. It’s in the process of shedding its large old, outer leaves from last year to make room for the its new leaves. 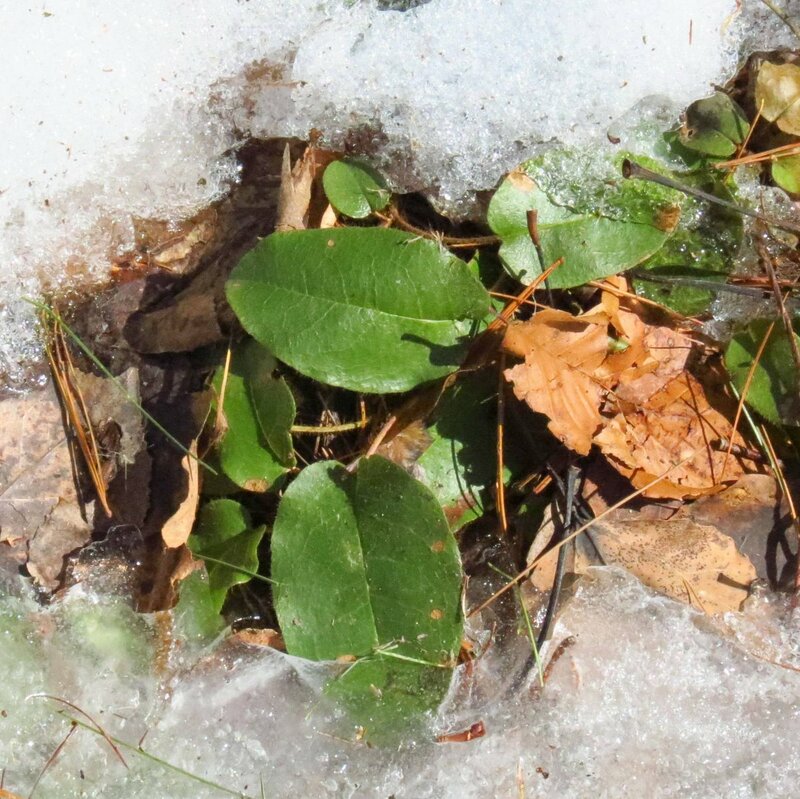 This plant stays green all winter long under the snow and starts growing quickly in spring as soon as it melts. Another name for this plant is flannel leaf because of its large soft, fuzzy leaves. Pliny the elder of ancient Rome used the warmed leaves as poultices for arthritis and Roman legionnaires dipped the long stalks in tallow and used them as torches. 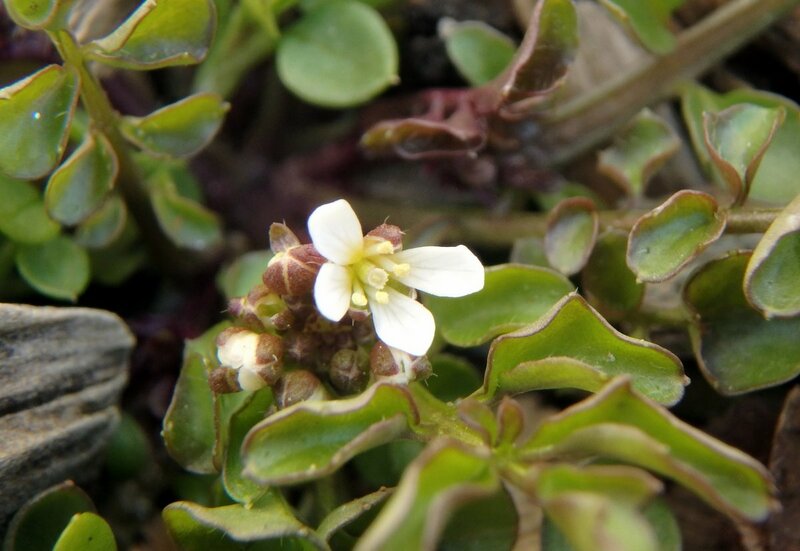 The plant is originally from Europe and is considered invasive. 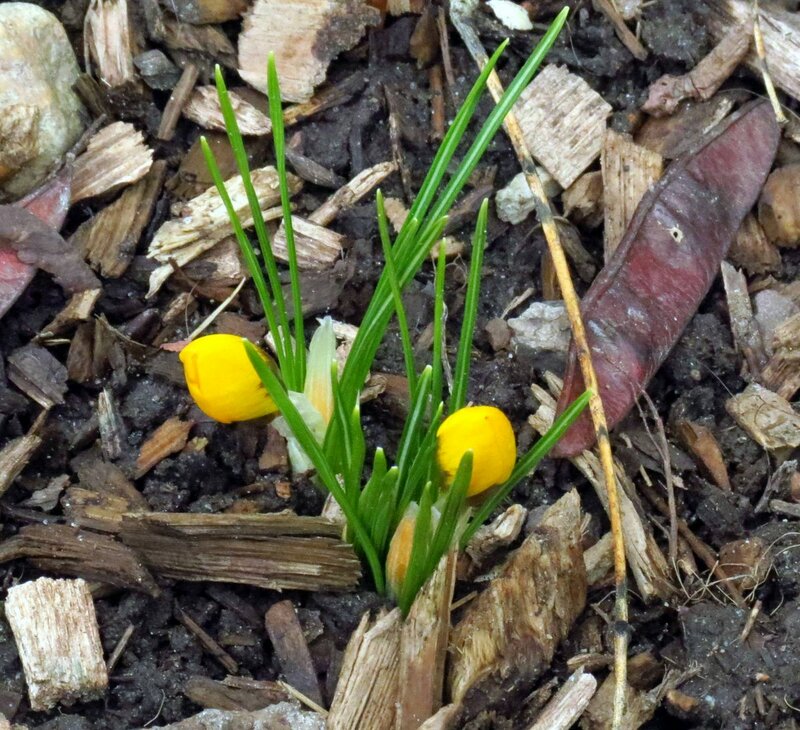 I see this plant in a flower bed every time I go looking for spring bulbs blooming at the local college, but I’ve never seen it bloom. 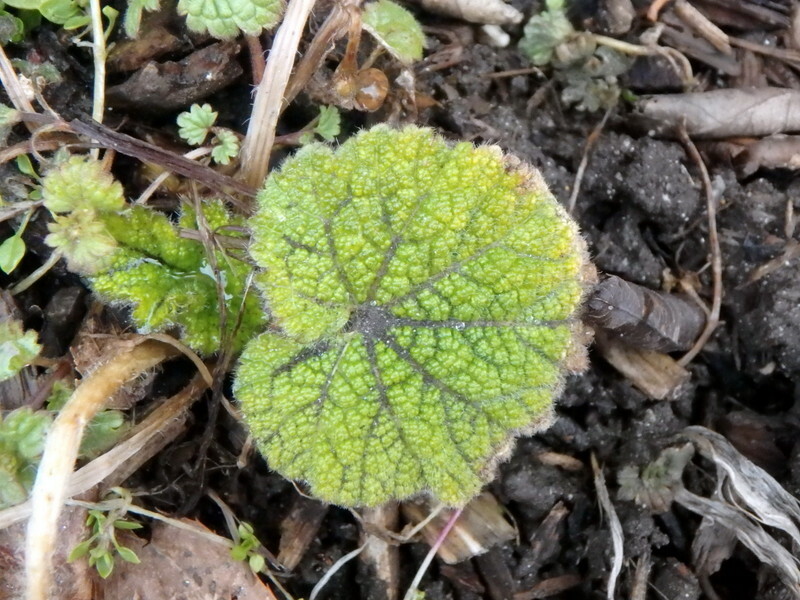 I think it’s a hollyhock but I’m not sure, whatever it is it’s very tough and stays green all winter long. I like the pebbly texture of its leaves. 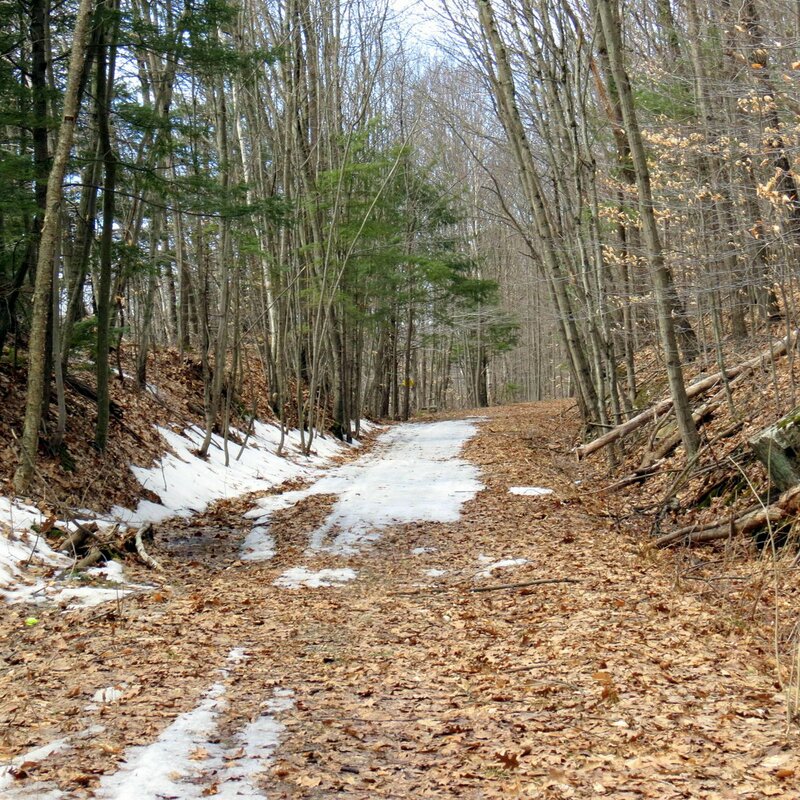 I’ve written about Edgewood Forest in past posts. 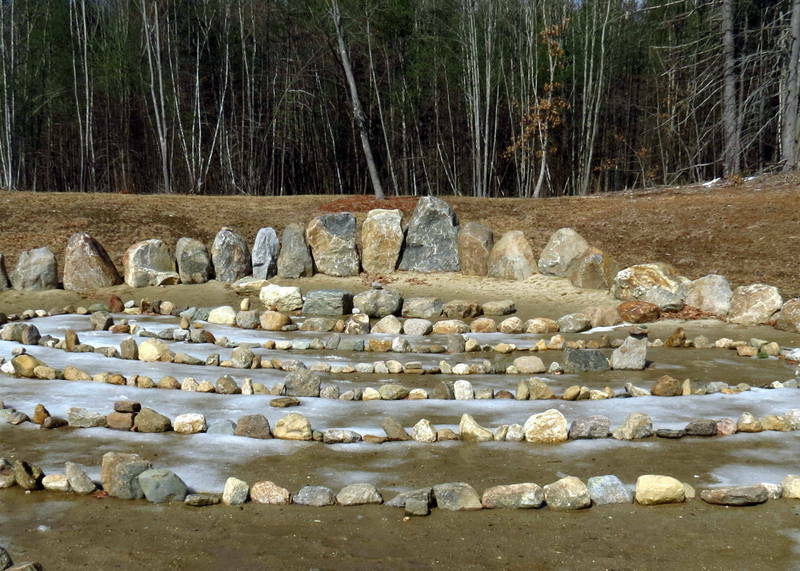 It lies near the Keene airport and there always seems to be a controversy boiling over the trees there. 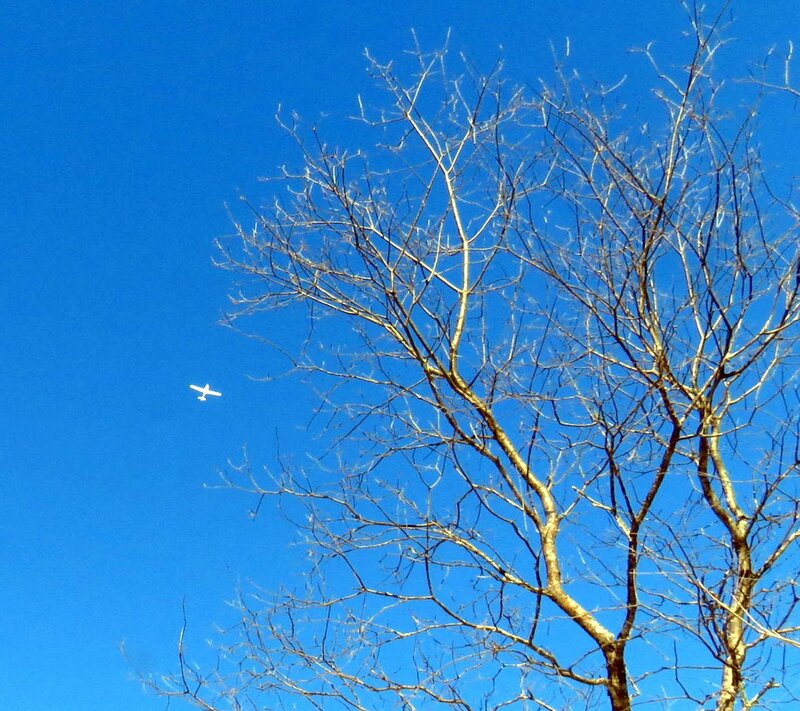 The Federal Aviation Administration says the trees are tall enough to pose a hazard to planes, but the original documents that deeded the land to the city says that the land should be left as is, with no cutting of trees. 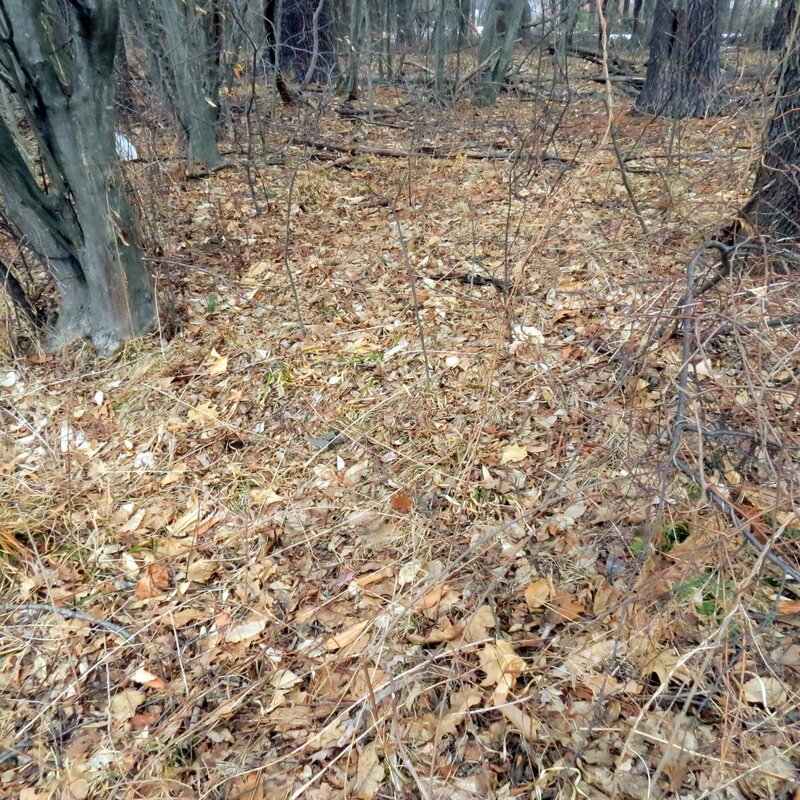 What this has amounted to is trees being cut all around the deeded parcel called Edgewood Forest, leaving it a kind of forested island. 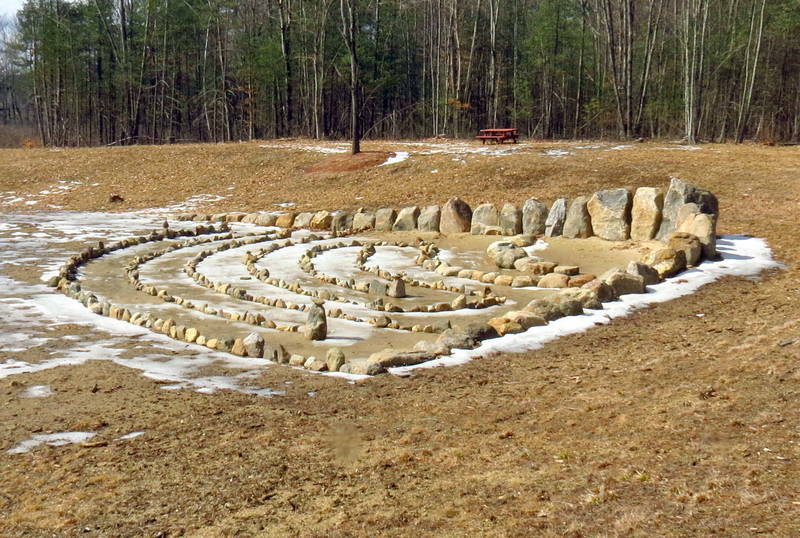 The place shown in the above photo was forested until not too long ago but then all the trees were cut, all the stumps pulled and this-whatever it is- was built. Picnic tables were placed here and there. Apparently the higher powers thought that people would flock there and love it enough to even want to picnic there, but I’ve been by it hundreds of times and have never seen a soul there, picnicking or otherwise. Since there are hundreds of trees that are taller very nearby this seems like a total waste of effort and money to me. This kind of thing is happening all over and town governments can’t seem to get the fact that people go to these places to enjoy nature. They stand and scratch their heads, wondering why the people don’t still flock to the same places after they’ve been “improved” like this one. Instead of attracting people they are driving them away, and I’m sure the income from tourist dollars is going to start reflecting that, if it hasn’t already. Meanwhile we’ll have monuments like this one to shake our heads at as we pass by in search of places that are more open and welcoming to nature lovers. 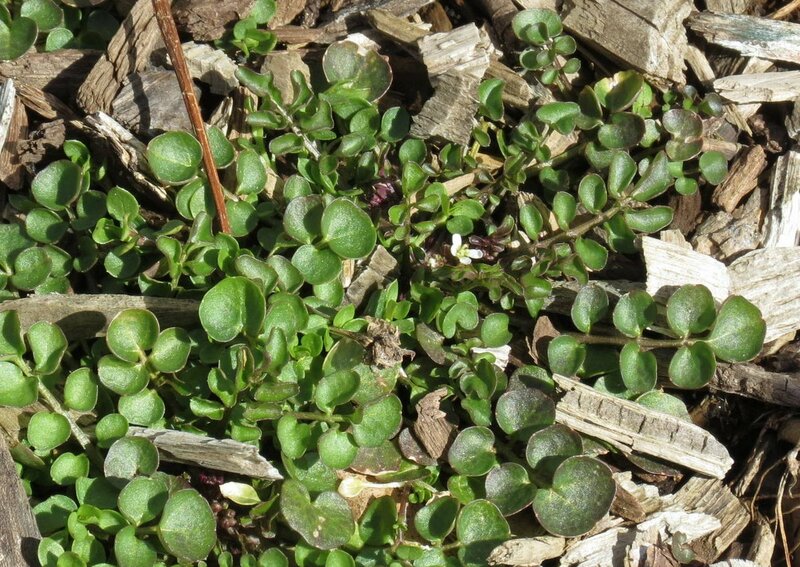 Goldthread (Coptis trifolia) is one of the plants that grew in that forest before it was turned into a lawn. Luckily I know where there are more of them. 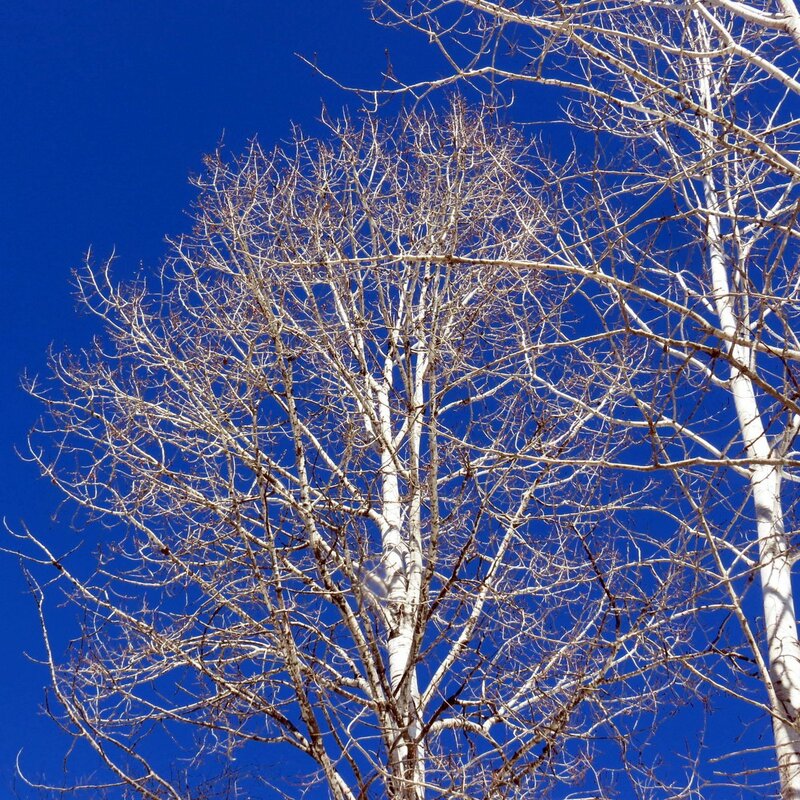 Native Americans showed the early settlers how to use goldthread to relieve the pain of canker sores and it became an extremely popular medicine. At one point in the 1800s more of it was sold on the docks of Boston than any other plant and that meant that it was severely over collected. Now, 200 years or so later It has made a good comeback and it will always be with us if we stop turning forests into lawns. 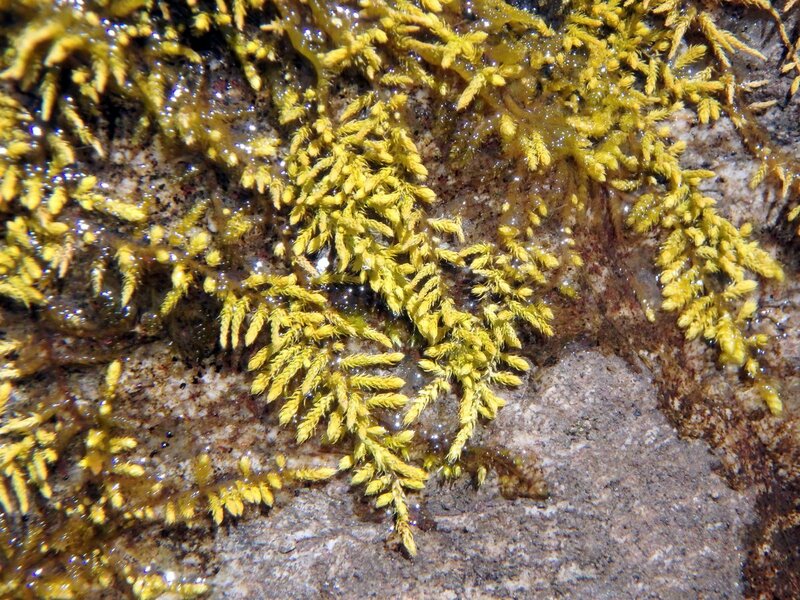 It gets its common name from its bright yellow, thread like roots. It will bloom in late April with a pretty little white flower. I love its leaves, which look like they were hammered out of sheet metal. When a sunbeam picks out something specific in nature I usually pay close attention, thinking that maybe I’m supposed to see that thing for whatever reason. 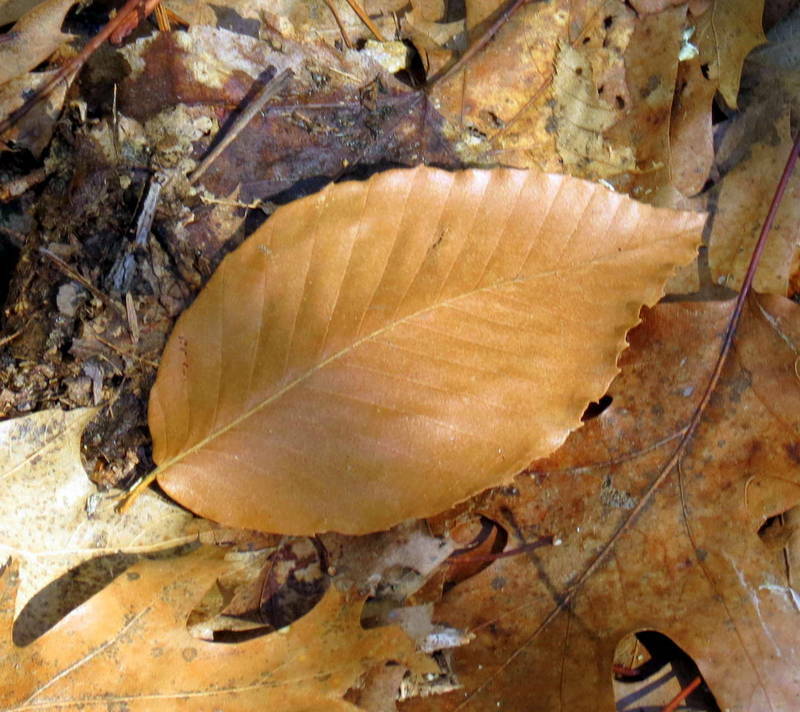 On this day a sunbeam picked out this beech leaf, which was perfect and unblemished. It was a beautiful thing, as the things picked out by sunbeams almost always are. A sunbeam showed me how incredibly beautiful a red clover blossom was once and completely changed my opinion of what I always considered an ugly, unwanted weed. 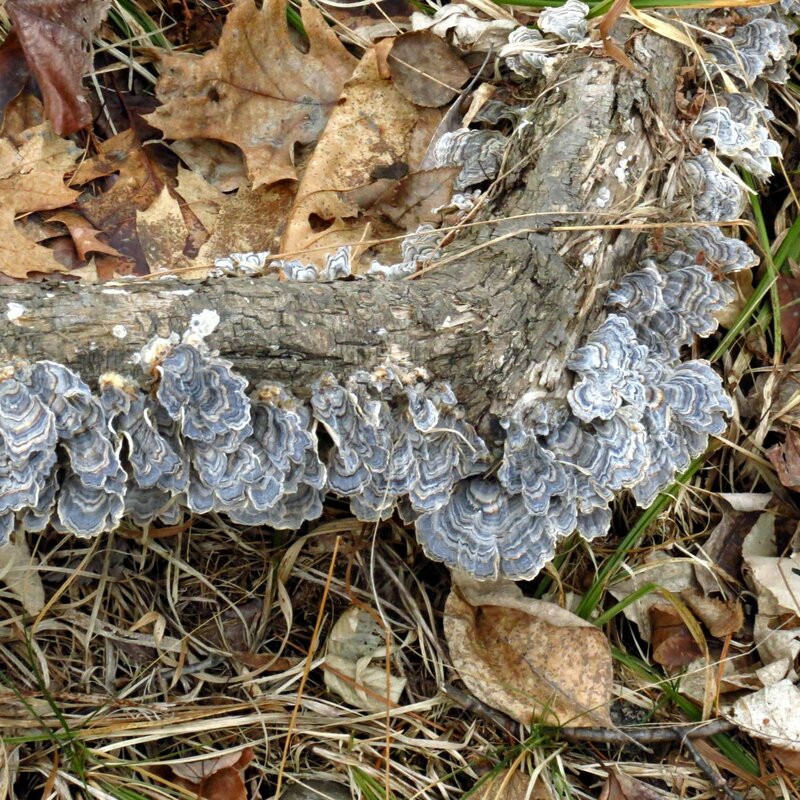 A sunbeam also fell on this single turkey tail fungus (Trametes versicolor) and its dominant blue color just happened to be my favorite. 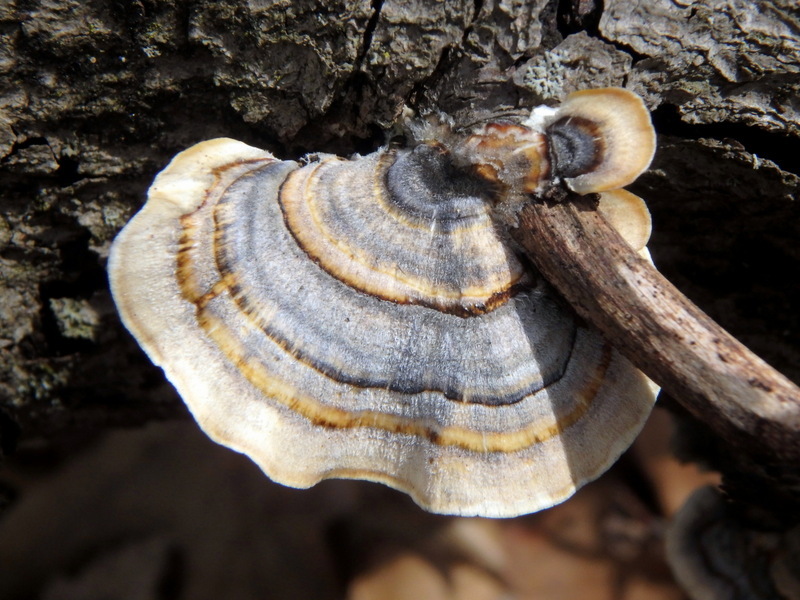 Turkey tails can vary greatly in color and I think I’ve seen them wearing just about every shade this year. I’m hoping this is the last of this winter’s ice I’ll have to show here. Both day and nighttime temperatures are rising and ever so slowly the white is disappearing. 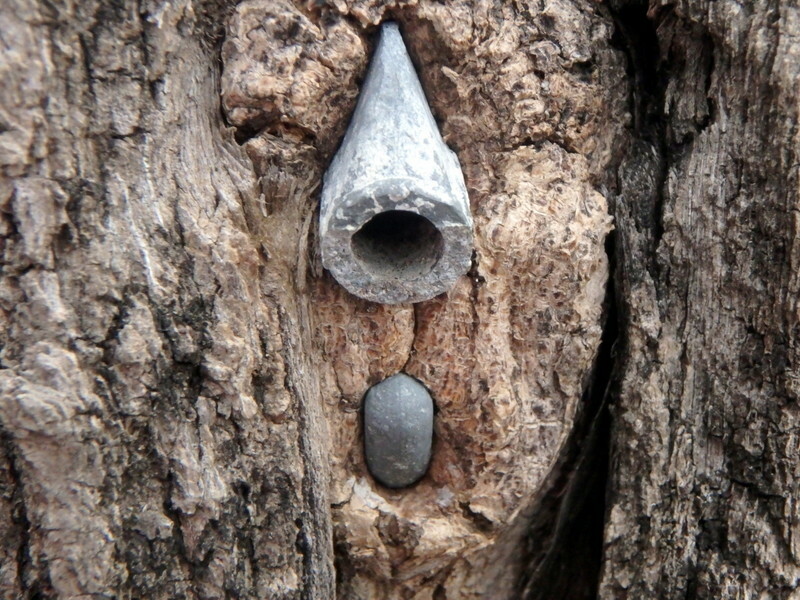 If you’ve never looked through a knothole this photo is for you. 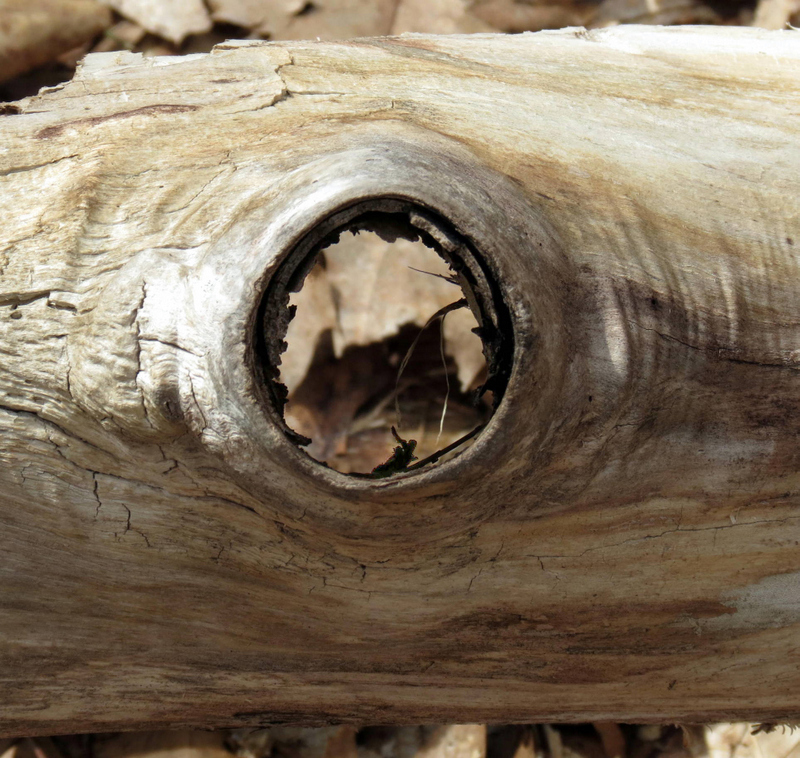 Knotholes like these happen when branches die and their wood shrinks faster than the surrounding wood of the tree. 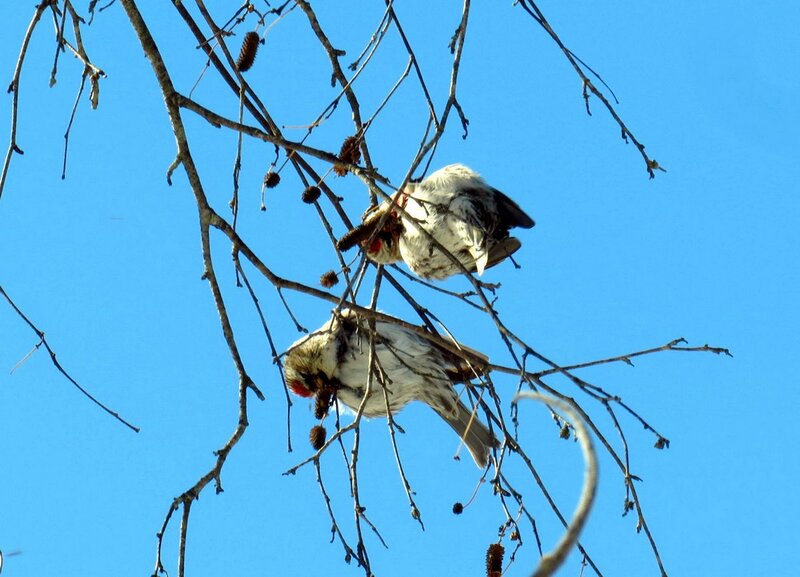 Eventually they fall off the tree, leaving a hole behind. 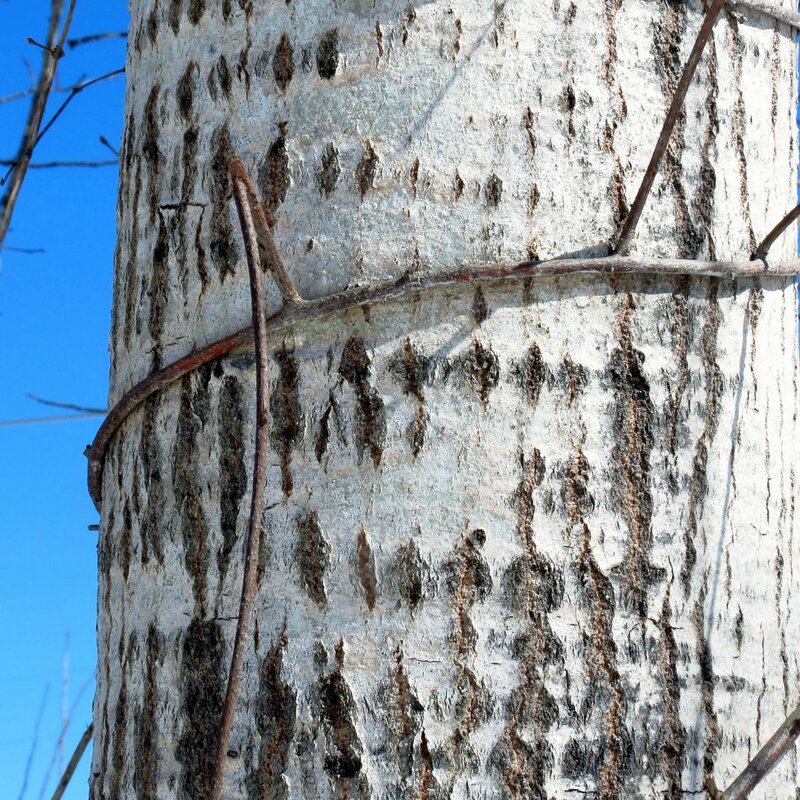 The part of the tree that protrudes and surrounds the branch is called the branch collar and it should always be left intact when pruning. As can be seen, the tree leaves it behind naturally. Other “improvements” I’ve seen lately involved cutting all the alders and other native shrubs from the banks of a small local pond, but since this pond is used as a water source in case of fire I can understand the thinking behind wanting to keep the brush cut back. I thought this stump, cause by two young alders growing together, looked like the face of an owl. I had the face of this barred owl to compare the stump to. A few years ago I met a barred owl sitting in the middle of a trail. It just sat there, staring directly into my eyes while I walked to within 5 feet of it. I stood for several minutes, feeling as if I was being drawn into those big brown eyes that were much like my own, until I finally turned and left. The last time I saw that owl it still sat on the ground, which is a very odd thing for an owl to be doing. It was a strange experience and seeing this owl reminded me of it. 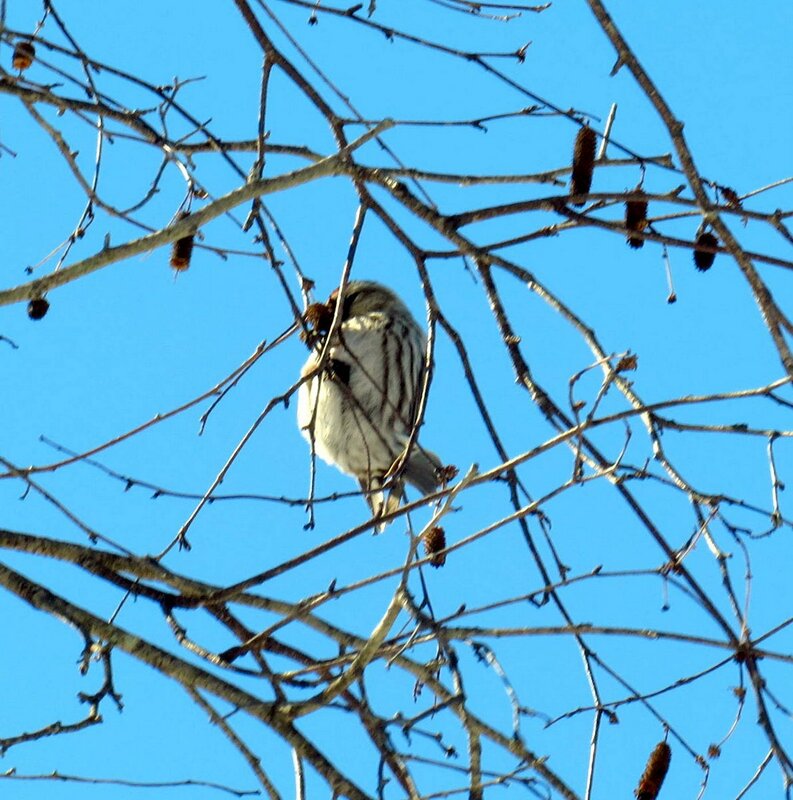 This owl was much bigger than that one but sat quietly in the same way, letting me take as many photos as I wanted. The photos would have been much better had it been a sunny day but you can’t have everything, and being able to look into the eyes of an owl should be enough. If you’d like to see what it’s like to stare into the eyes of an owl, look at the beautiful photo of a saw-whet owl that Montucky recently posted on his blog. You can see it by clicking on the word HERE. 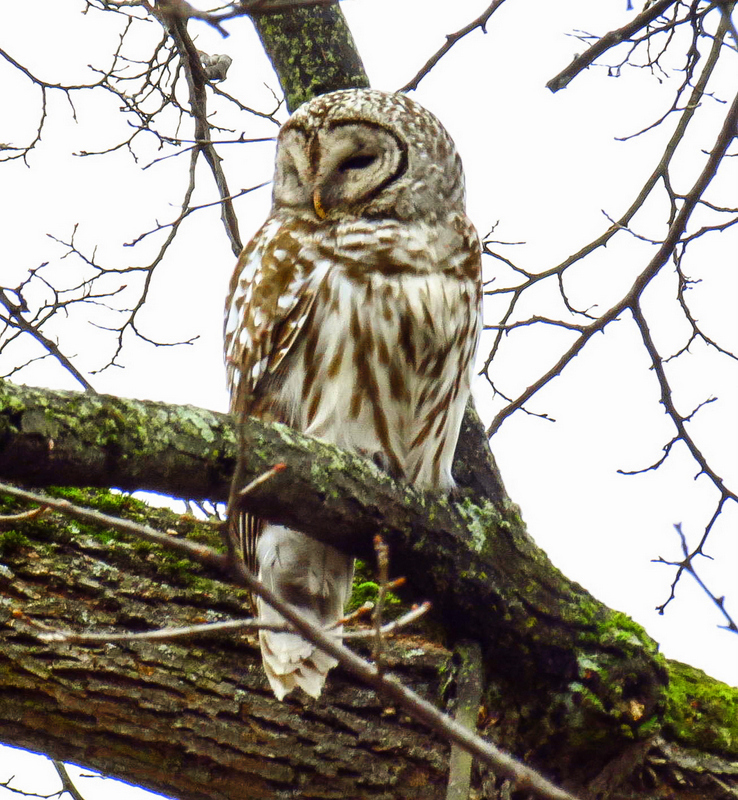 Its eyes are yellow instead of brown like a barred owl, but the effect is the same. Just a note: This post is the first I’ve done on my new computer and I’m having trouble getting photos to look right on the new monitor, so if things look a little stranger than usual that might be why. It’s a nice big monitor that’s easy to see but it’s also very bright so photos look like they were overexposed. I hope you’ll bear with me. 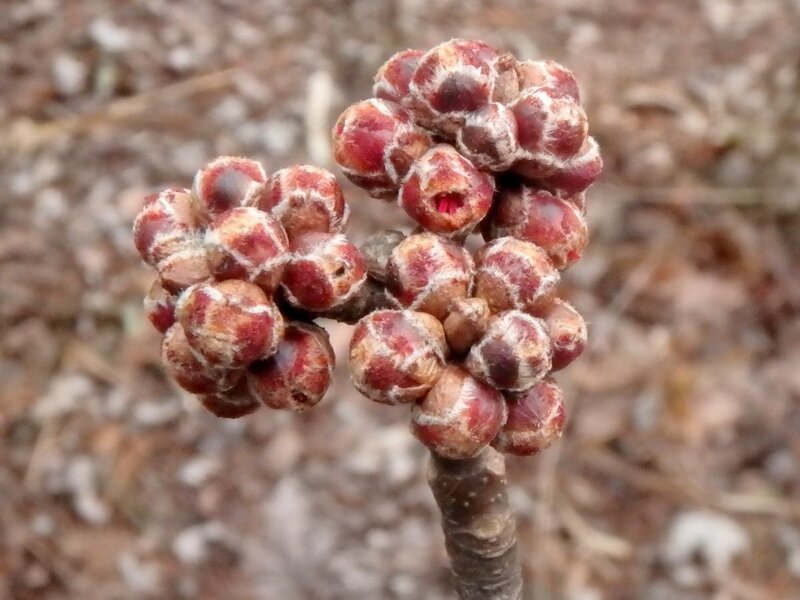 Last year I found a blue cohosh plant on the rail trail out in Westmoreland and I’ve gotten to see the flowers and fruit but I’ve never seen the spring shoots. 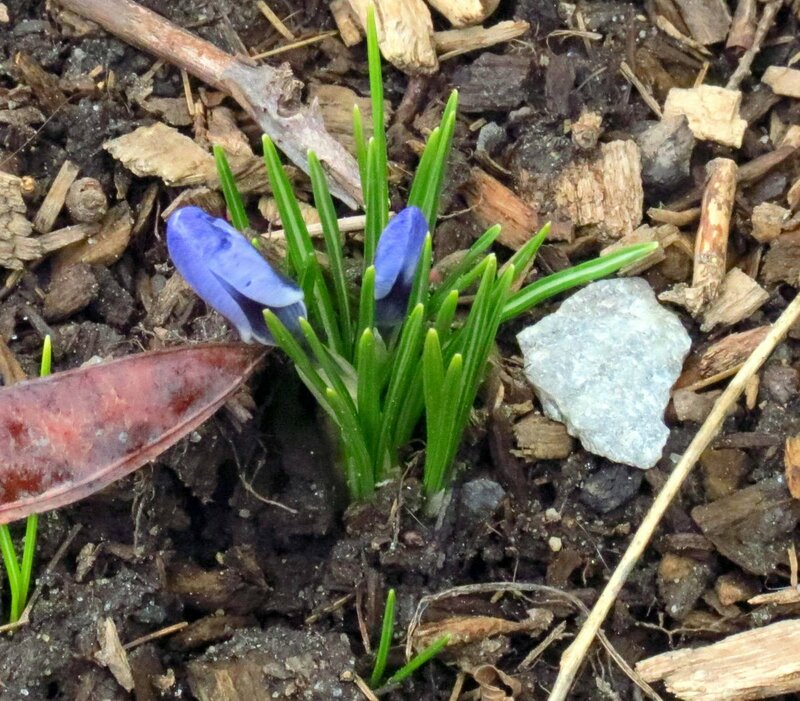 From what I’ve seen in photos they’re very beautiful things, like little dark blue hands coming up out of the soil, so last Sunday off I went with a pocket full of hope. 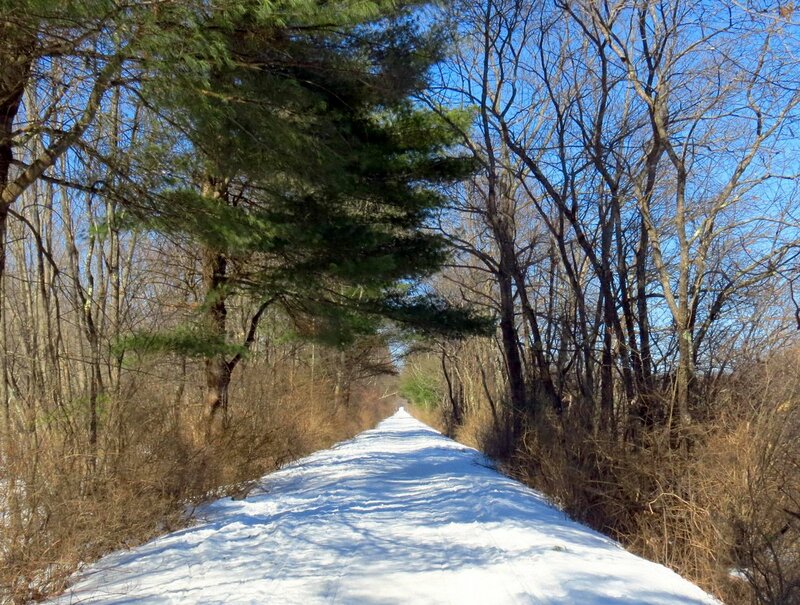 There was a little ice on the start of the trail but after that it was ice free. 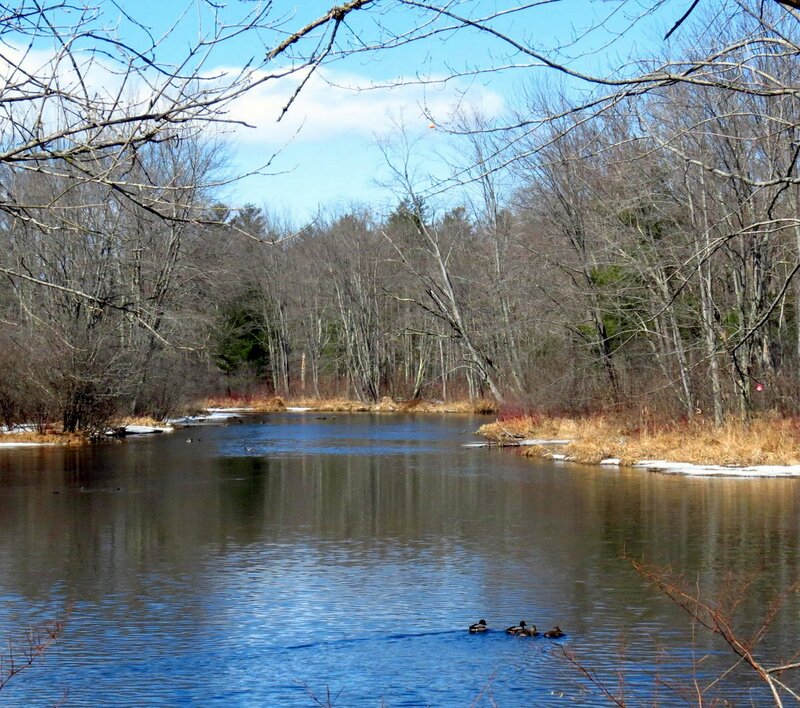 It was a beautiful early spring day with the trees full of bird song and a temperature of almost 60 degrees F. It’s amazing how much snow one warm day can melt. If we had a week of days like this it would all be gone. 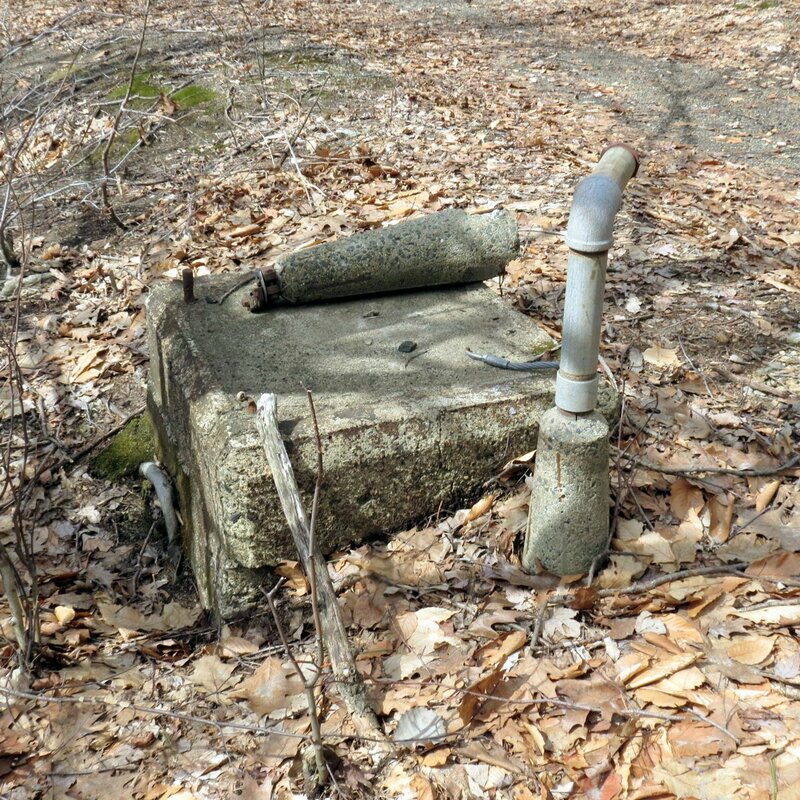 There are plenty of reminders of the history of this place, like this signal base. 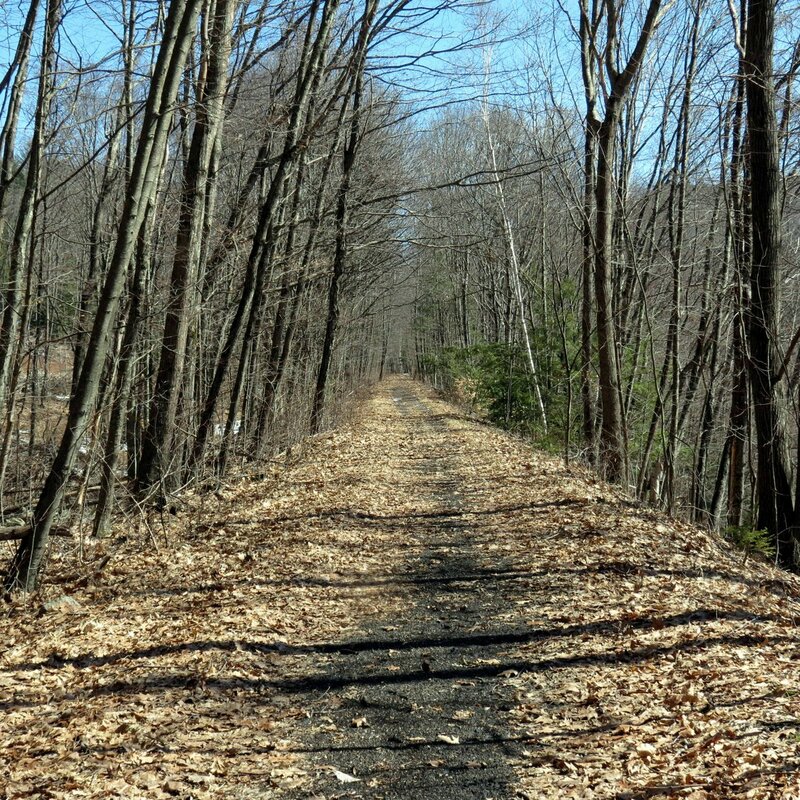 The Boston and Maine Railroad ran through here for many years. 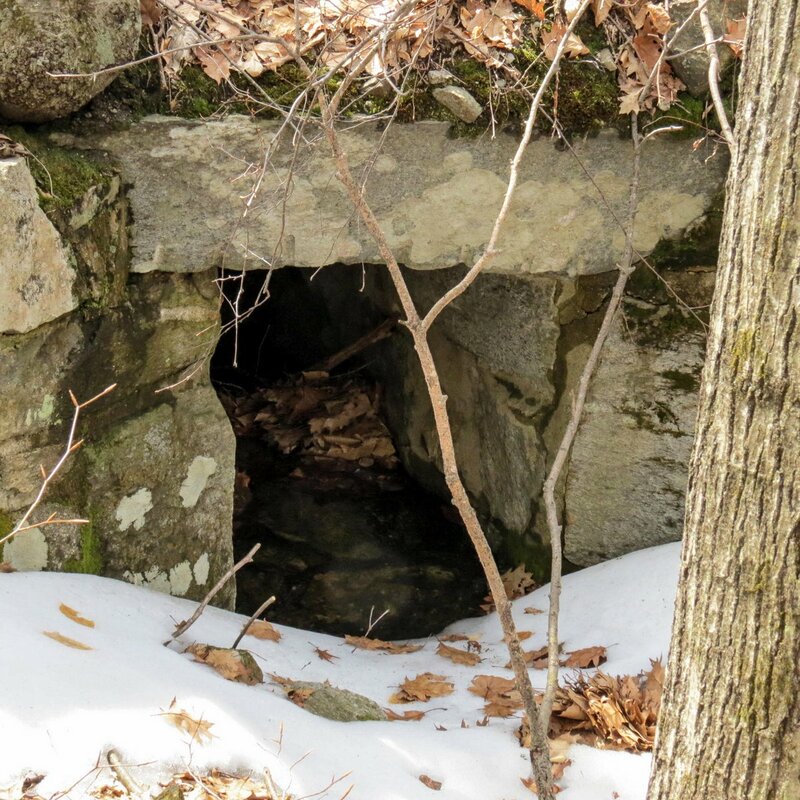 There are some nice old stone box culverts out here, still working fine after 150 years. The stream that runs through this one must be off and on because there was no water here on this day. 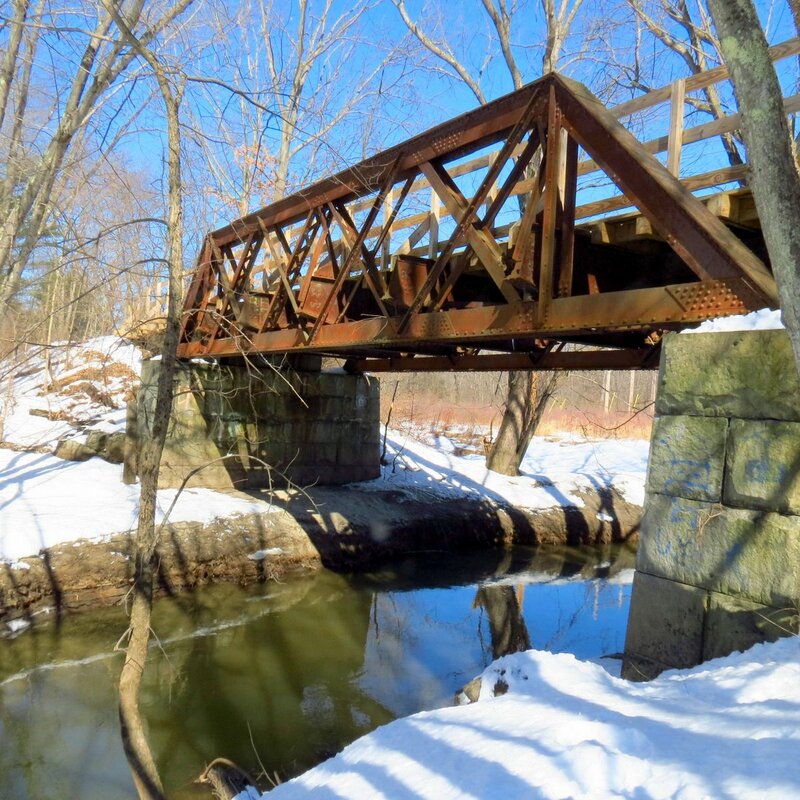 Leave it to the railroad to build something “just in case.” That’s why these railbeds are still here 150 years later with virtually no maintenance. 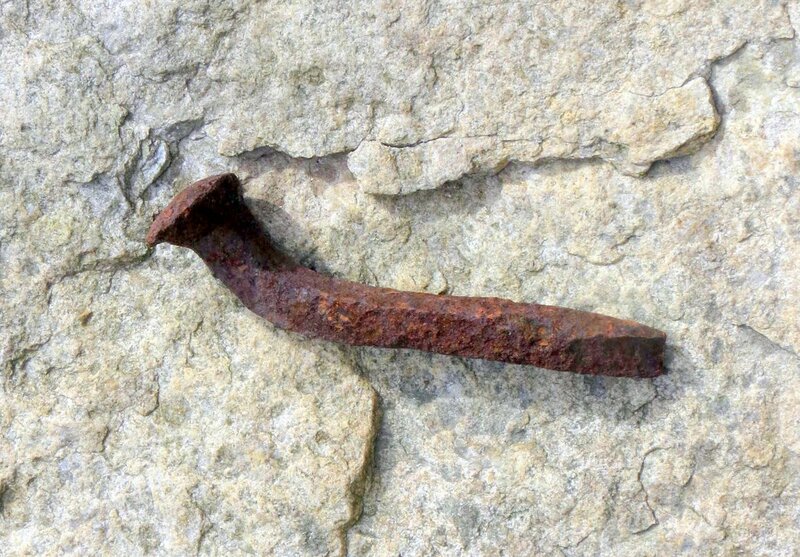 Someone found a bent rail spike and put it on a boulder. The stone walls out here are very unusual in that there isn’t hardly a round corner to be seen anywhere. 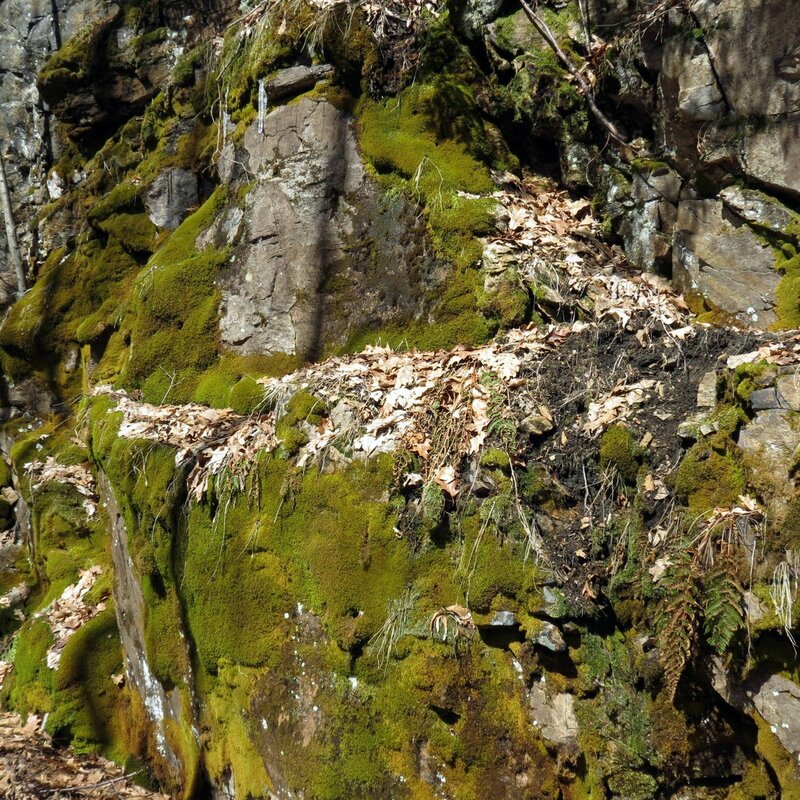 That’s because these are stones left over from when the railroad blasted their way through the ledges. They’ve never gone through the grinding action of a glacier. 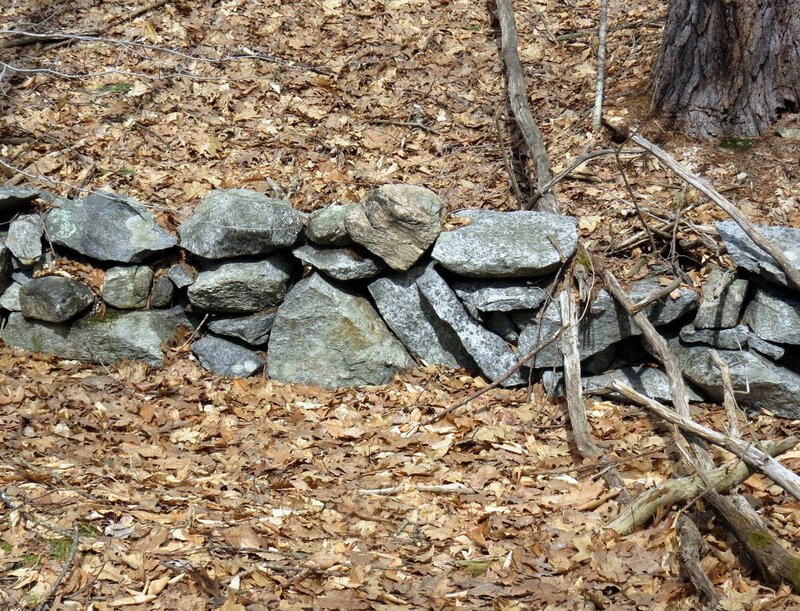 Rather than the usual stone walls built by farmers clearing their land, these walls are simple property markers. 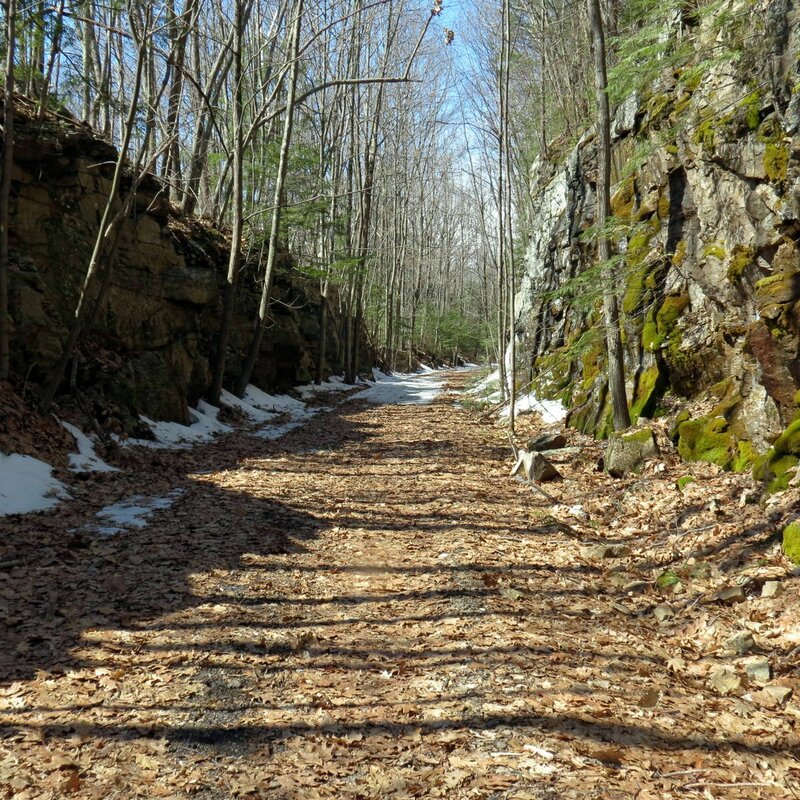 There must have been many thousands of tons of stone blasted out of the hillsides and that’s a good thing because this railbed had to be built high above the surrounding terrain and all of the blasted stone had to be used essentially to fill in a valley between hills. When you build a road bed through a hilly area you take everything you’ve cut from the hills and use it to fill in the valleys, and in that way you end up with a flat, level roadway, hopefully without having to bring in a lot of fill. This shot shows that I was almost in the tree tops where I was walking. 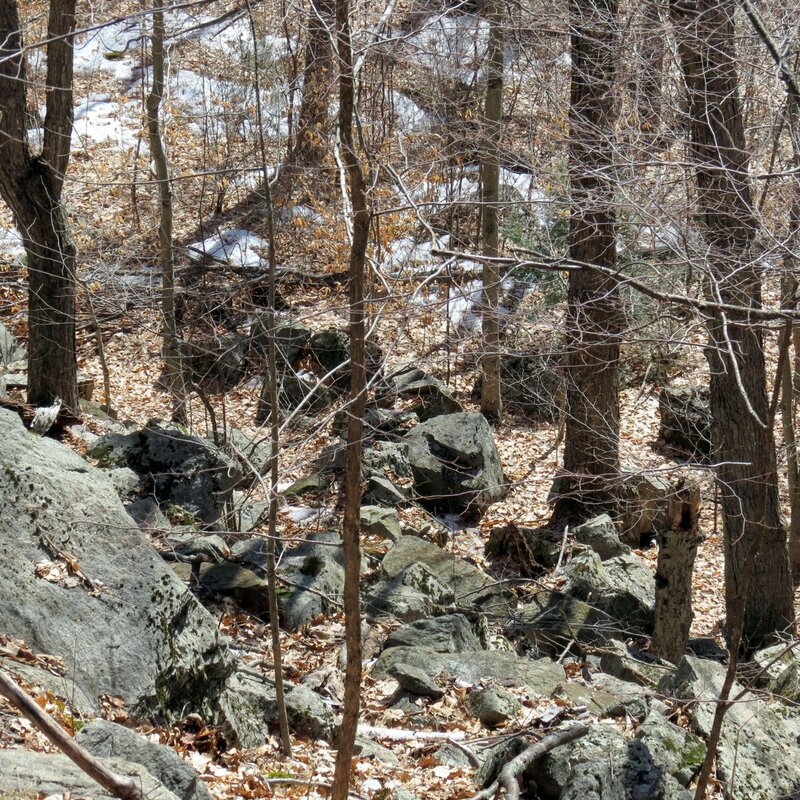 When you look down the side of the very high railbed you see large chunks of stone and realize that you’re walking on a huge, long pile of it. 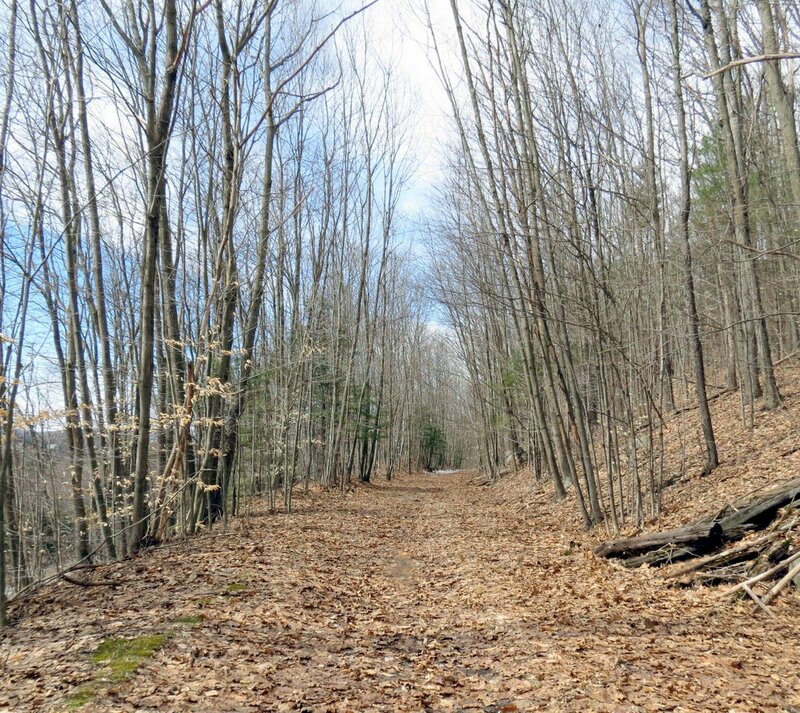 But you’d never know it from this view of a flat, level trail. 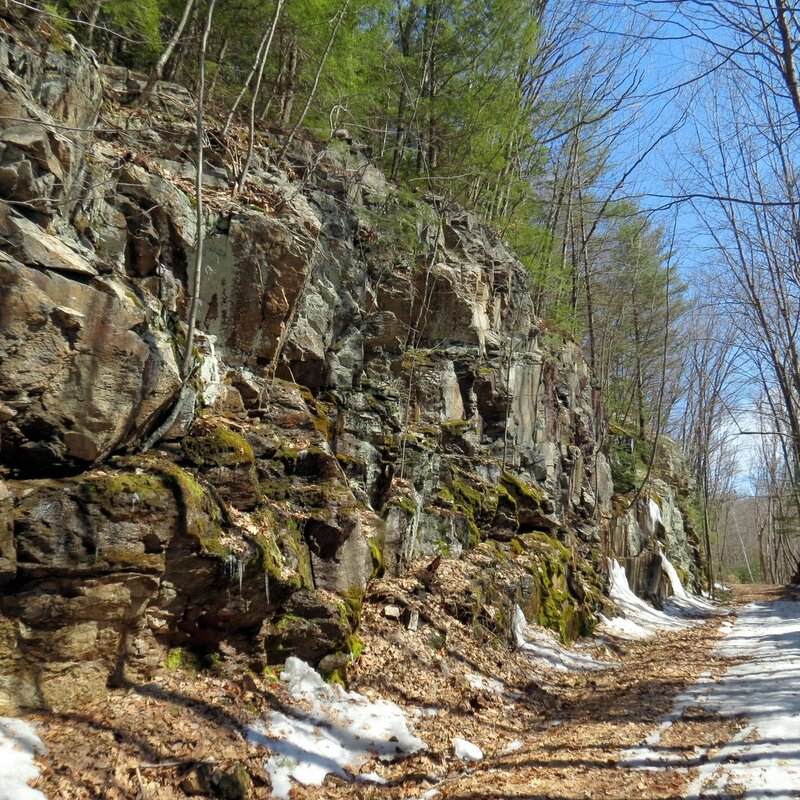 The railroad engineers were very good at what they did and the sheer amount of stone under this trail boggles the mind. 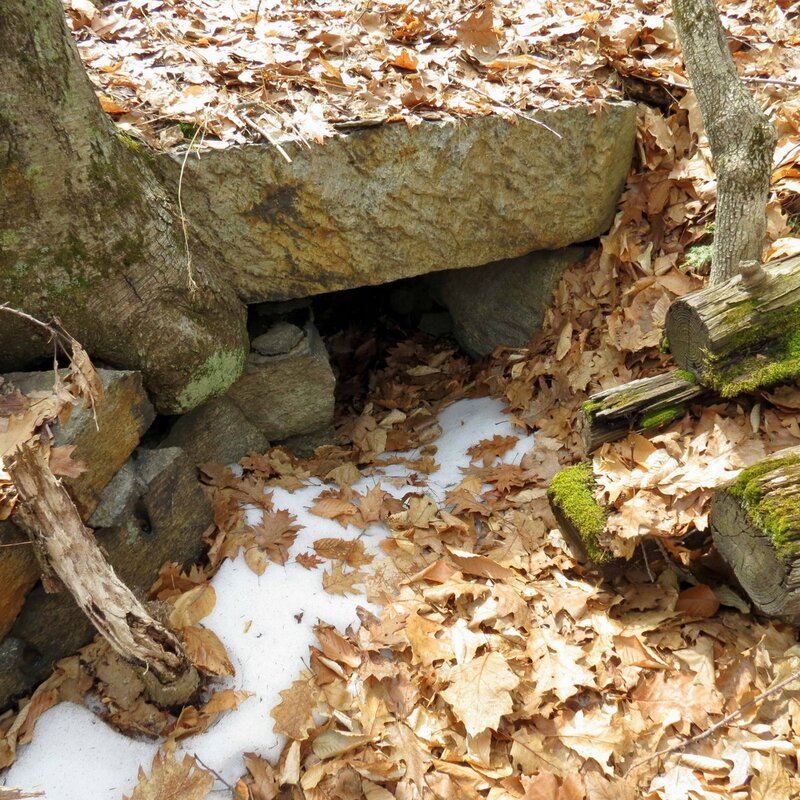 If you’re on a rail trail and see a stream going under it that almost always means a box culvert, and I always look for them if the hillside isn’t too steep. This one was bigger than the first I showed and it had water running through it. It was under the snow though, so you can’t see it. There is mortar on this culvert and that tells me that it has probably been repaired because I’ve never see railroad masons use mortar on anything they’ve built. 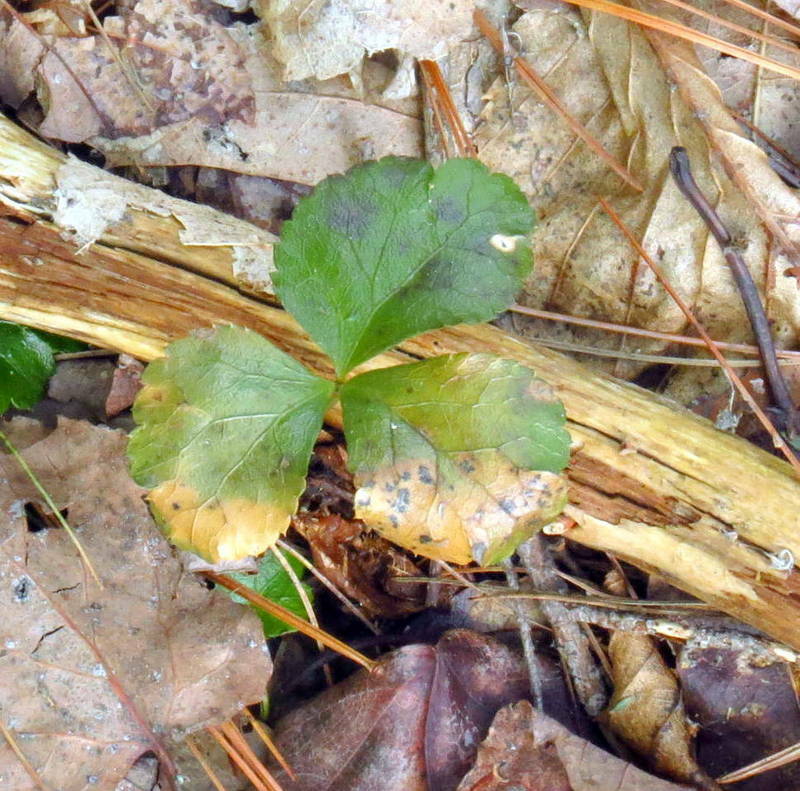 Before I knew it I was at the ledges where I found the cohosh. The question was, where exactly did I find it and could I find that spot again? There were a lot of leaves to poke around in. This is the spot where wild columbines (Aquilegia canadensis) also grow and this is the ledge most of them grow on. 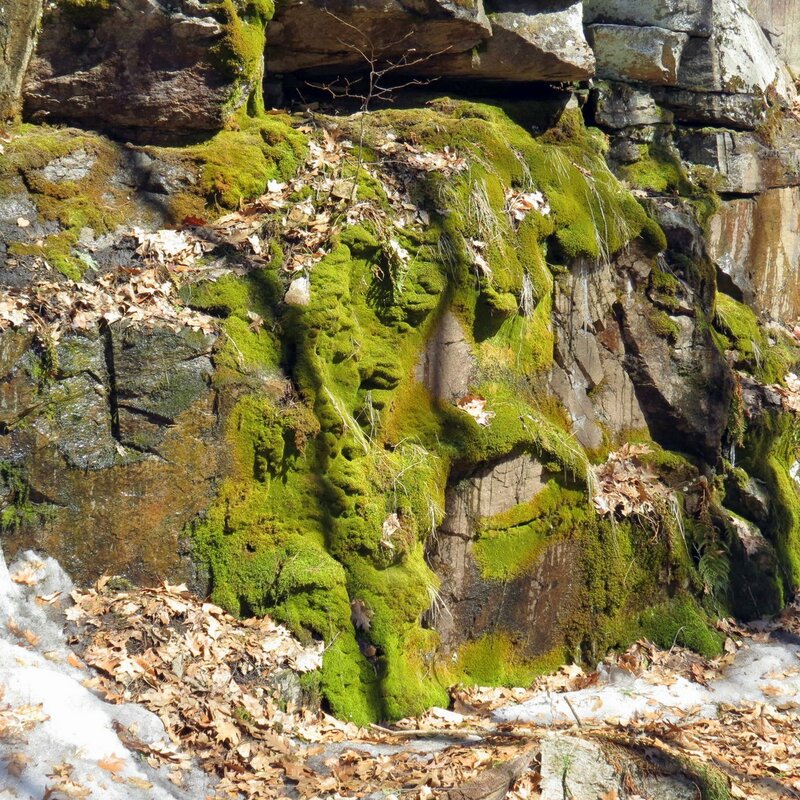 Both columbine and cohosh like limestone and that tells me that there must be a lot of lime in these ledges. There was a columbine leaf from last year, still hanging on. I never knew they were so hairy. The mosses were as beautifully green as I’ve ever seen them. I’m not sure what this one is but it’s a very pretty moss. And it was covered by ice. 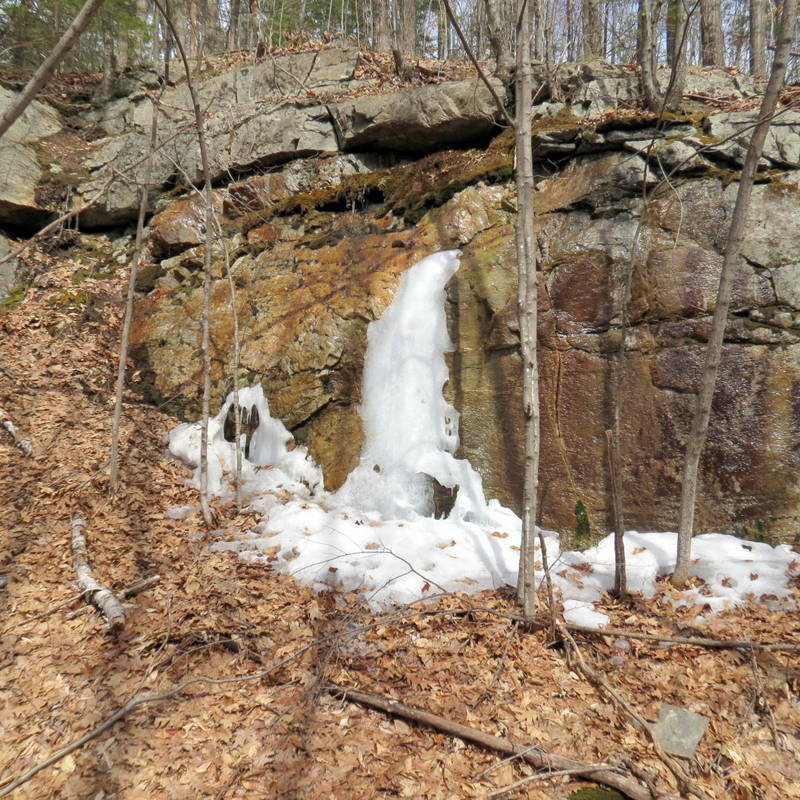 I tried to dig around in the leaves at the base of the ledges in several spots and found ice under them each time. 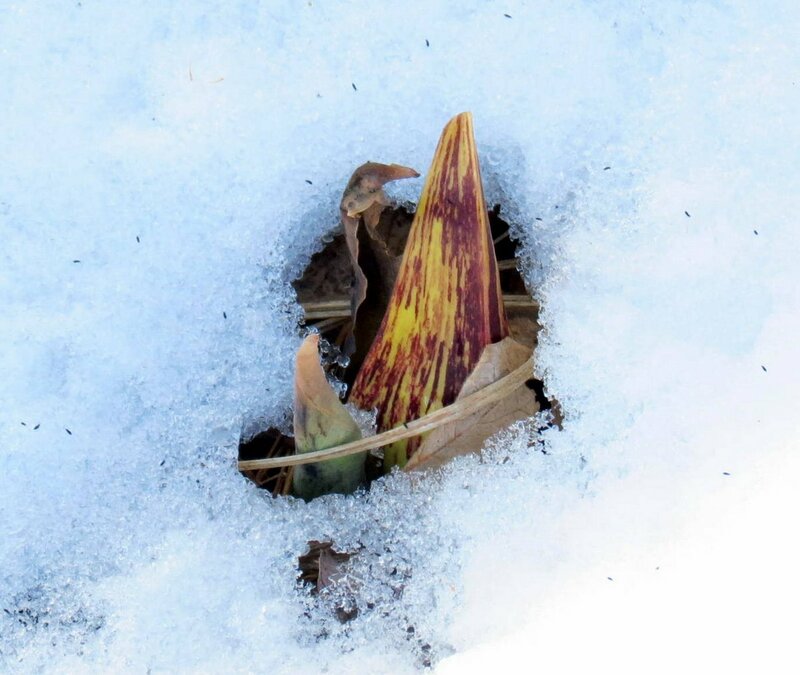 The only plant I know of that can melt its way through ice is skunk cabbage, so I knew I wouldn’t see blue cohosh shoots on this day. I’ll have to try again. In this place it was still a little too cold for emerging plants. 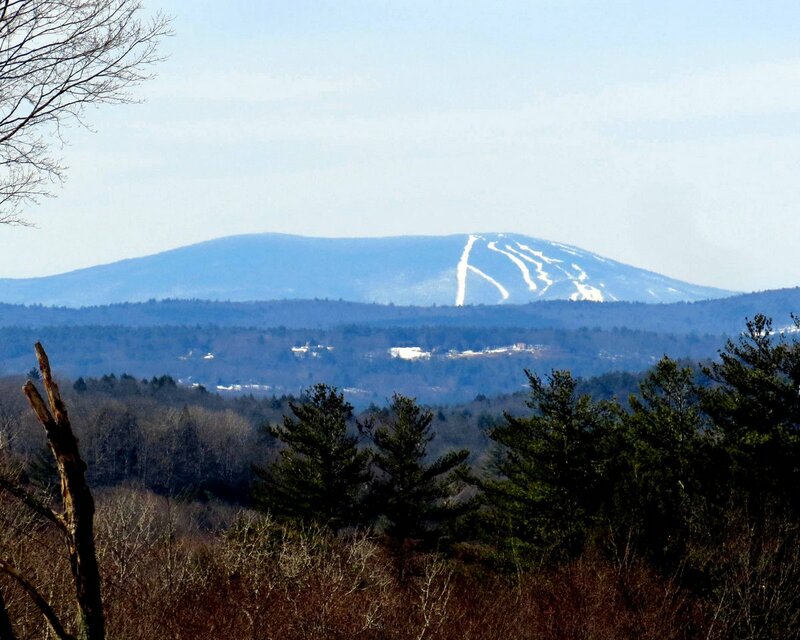 And the snow on the ski slopes of Stratton Mountain over in Vermont proved it. I’m sorry I couldn’t show you those blue cohosh shoots. 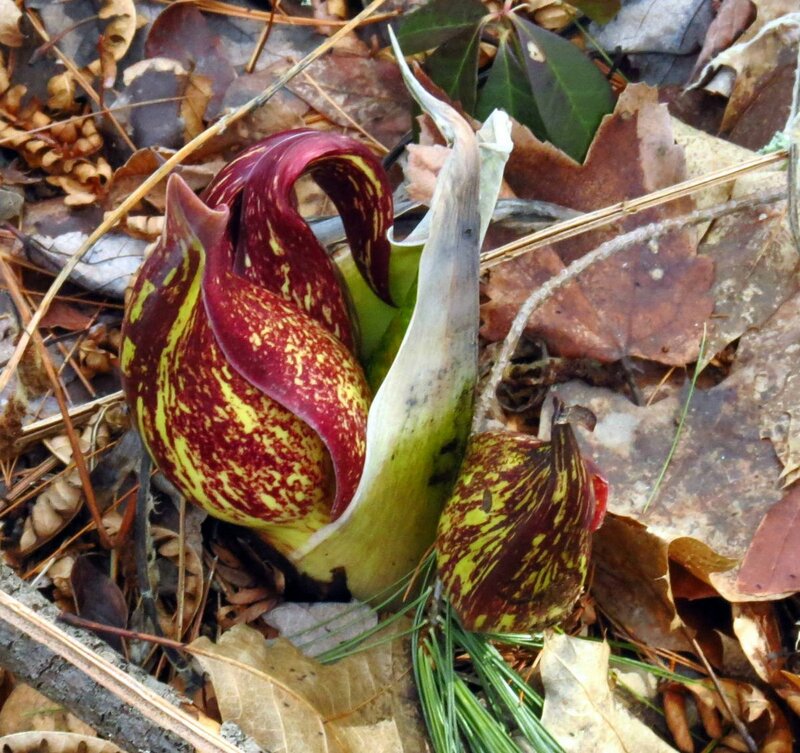 I’ll see what I can find this weekend; It will be worth the effort to see such a rare plant. If you’re interested just Google “Blue cohosh shoots” and you’ll see why I want to see them. 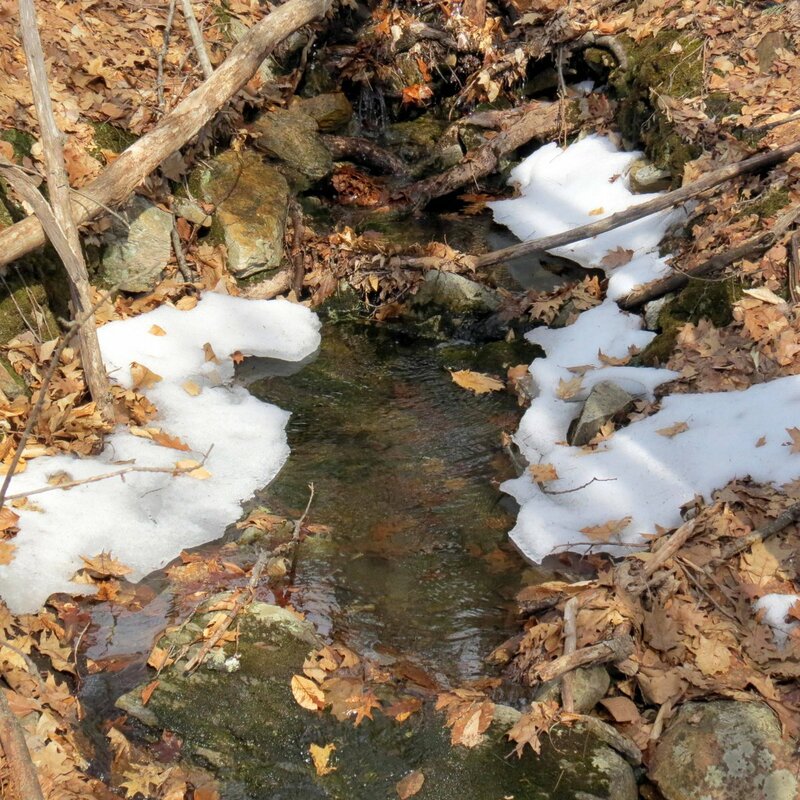 With daytime temperatures above freezing the snow is melting more each day. 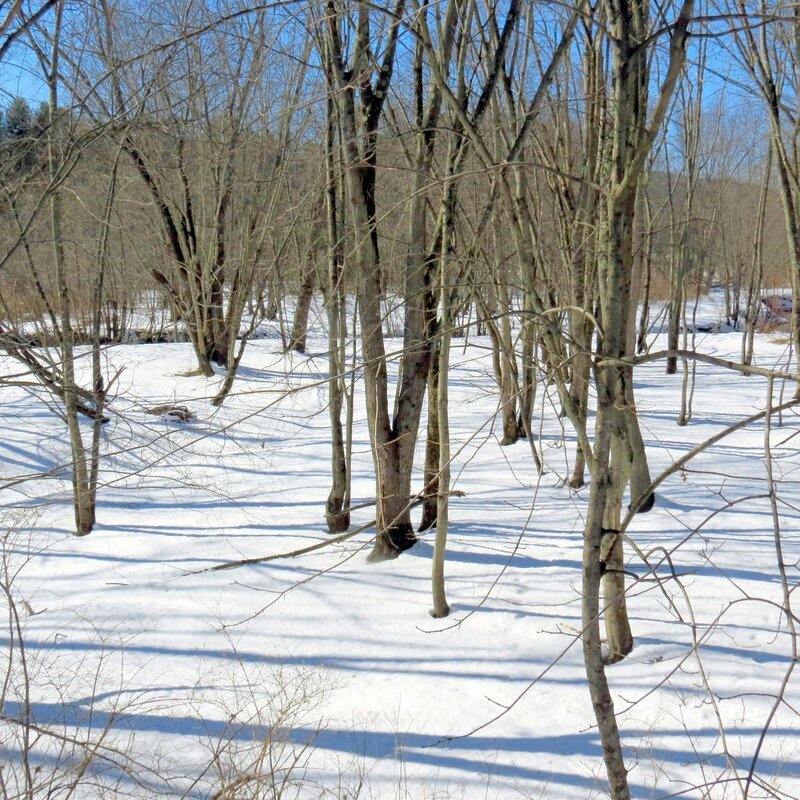 The woods in this photo have a southern exposure so the snow melts quickly. In fact I drove by them again yesterday and saw that all the snow had melted before I could even get this post posted. 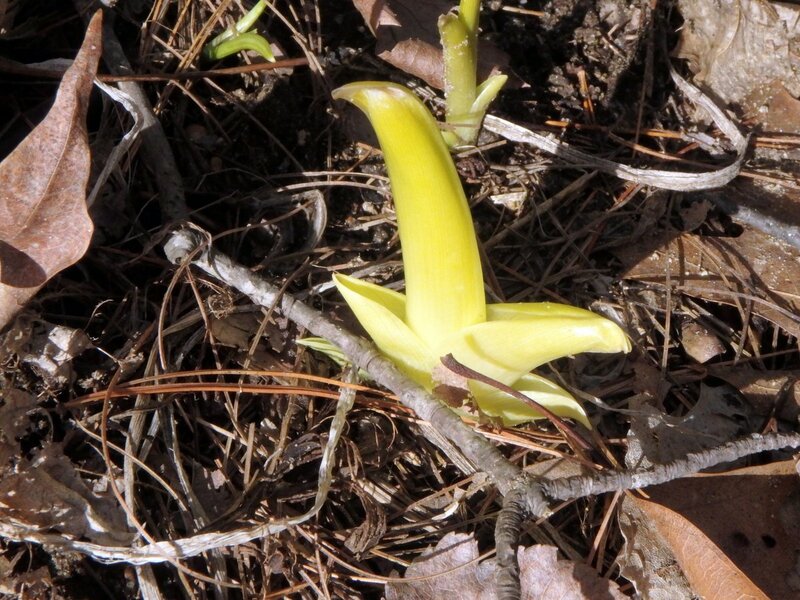 Soon there will be trout lilies blooming here. False hellebore, Pennsylvania sedges and ramps also grow here and this is one of my favorite places to visit each spring. 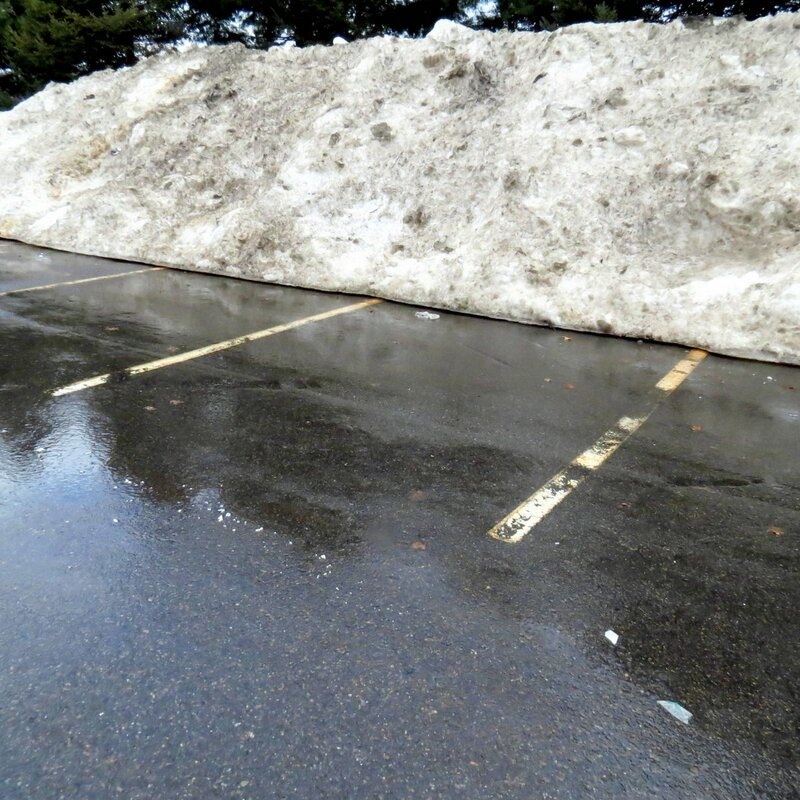 There is still a lot of snow left to melt in places though. This pile was about ten feet high and three times that long. It’s best for it to melt slowly so it doesn’t cause any flooding so daytime temperatures in the upper 40s F. and lower 50s are best, and that’s just what we’ve been getting. Of course all the melting makes mud and we have plenty of it this year. I’ve already come close to getting stuck in it two or three times. 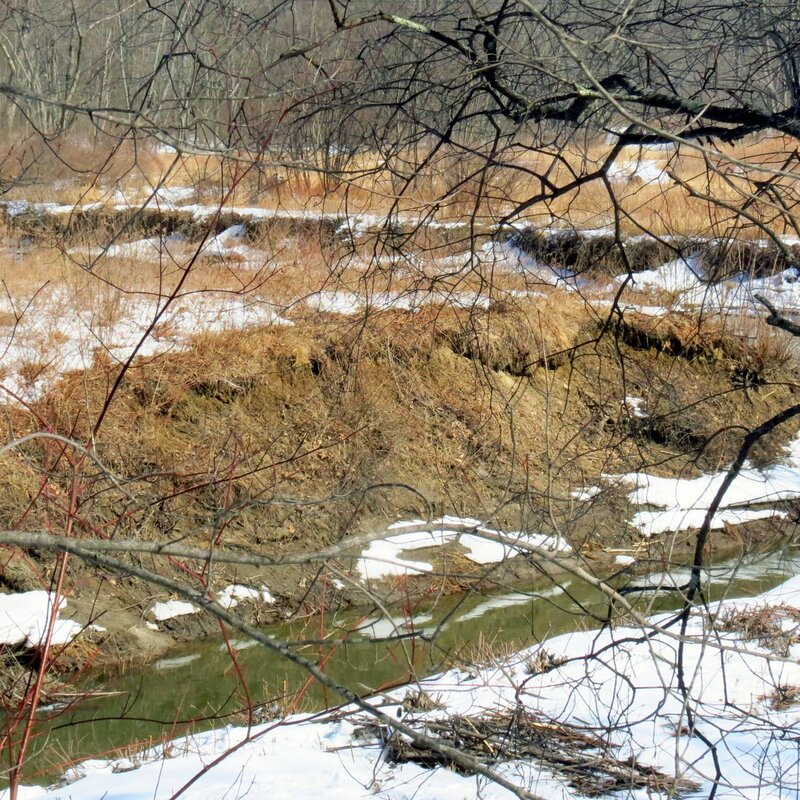 We call this time of year mud season, when the upper foot or two of soil thaws but anything under that stays frozen. 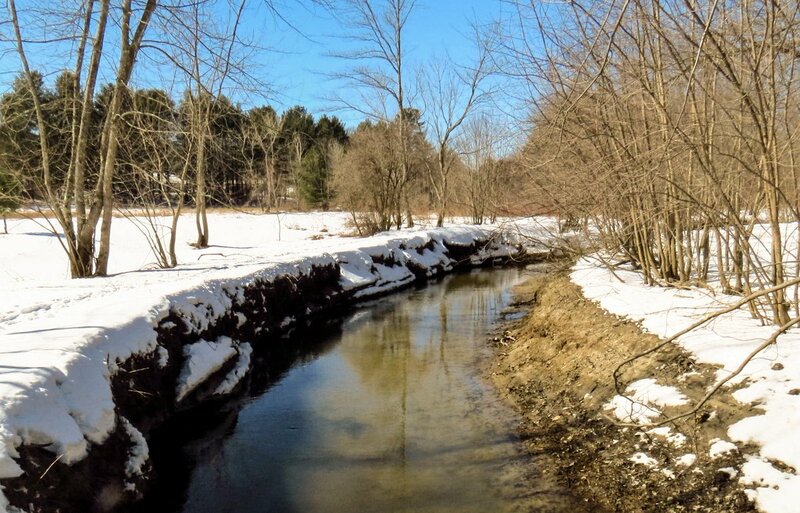 Water can’t penetrate the frozen soil so it sits on top of it, mixing with the thawed soil and making dirt roads a muddy quagmire. It’s like quicksand and it’s hellish trying to drive through it because you’re usually stuck in it before you realize how deep it is. 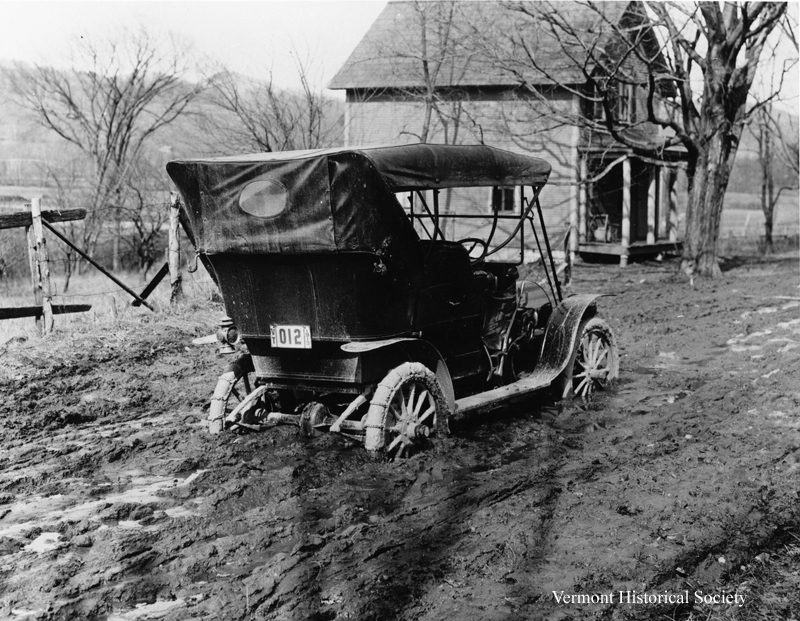 As this photo shows mud season has been with us for a long time. 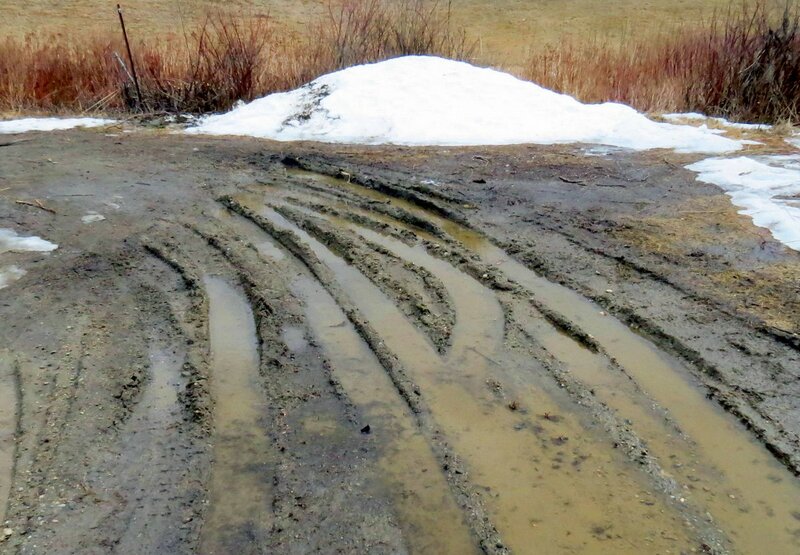 If you Google “Mud season” you’ll see cars, trucks, school buses and just about any other vehicle you can name stuck in the mud, just like this one. Some towns in the region have already closed roads because of it. This old tin Lizzie had chains on its wheels but it still got stuck. 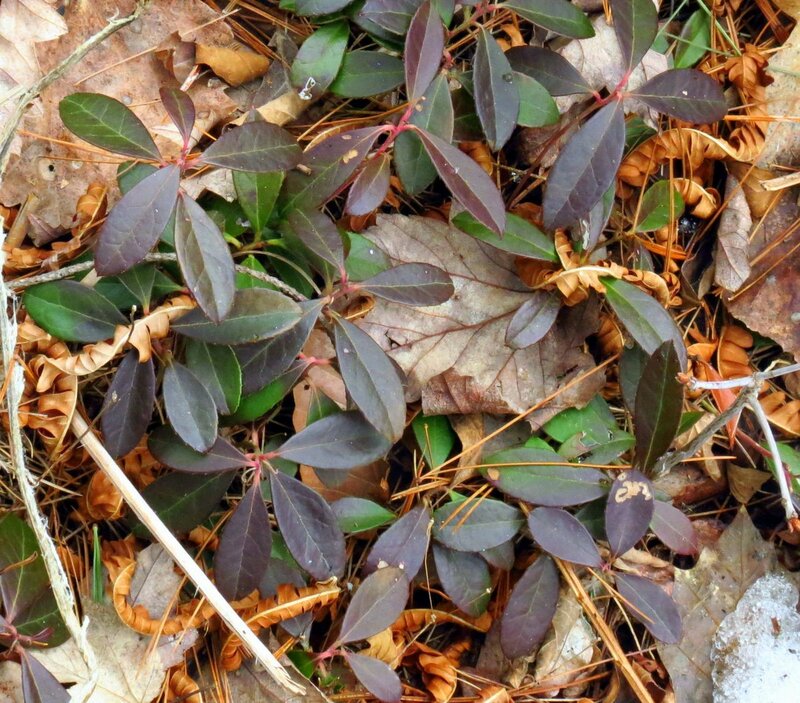 One of the things I enjoy most at this time of year is walking through the woods to see what the melting snow has uncovered, like the purple leaves of American wintergreen (Gaultheria procumbens) seen here. Though the plant is an evergreen it doesn’t photosynthesize in winter so it doesn’t need green leaves. 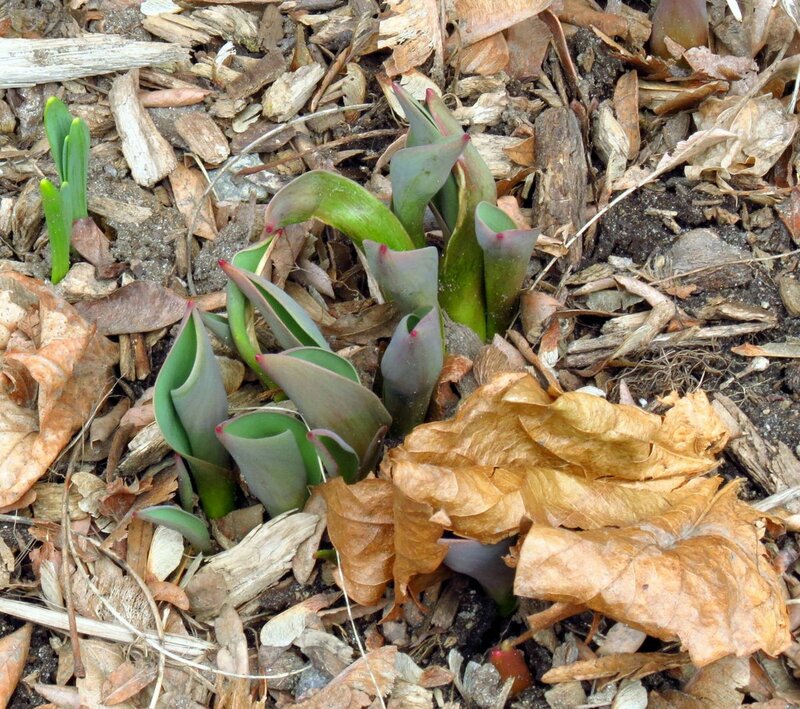 In fact many evergreen plants have purple leaves in winter but they’ll be greening up soon. This plant is also called teaberry and checkerberry because of its minty, bright red berries. 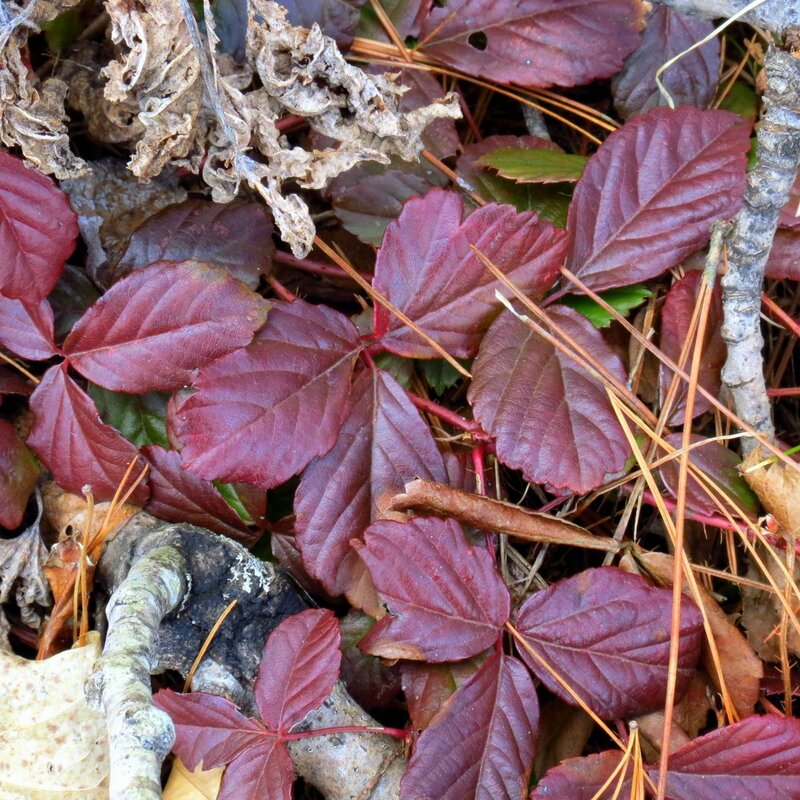 Swamp dewberry (Rubus hispidus) also has purple leaves in winter. This is a trailing vine with white flowers and black berries that look much like blackberries. Though it acts like a prickly vine botanically it is considered a shrub. It is also called bristly blackberry but I’ve heard that the blackberry like fruit is very sour. 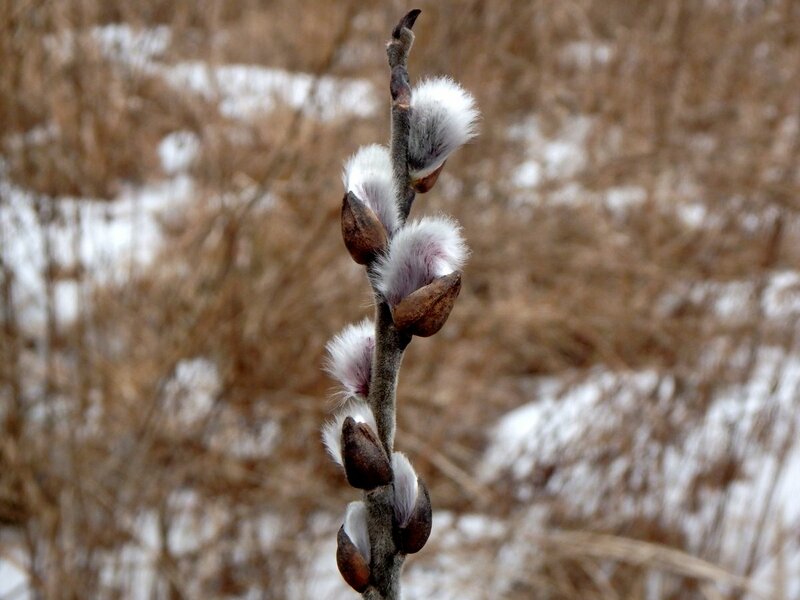 Native Americans used the roots of this plant medicinally to treat coughs and other ailments. 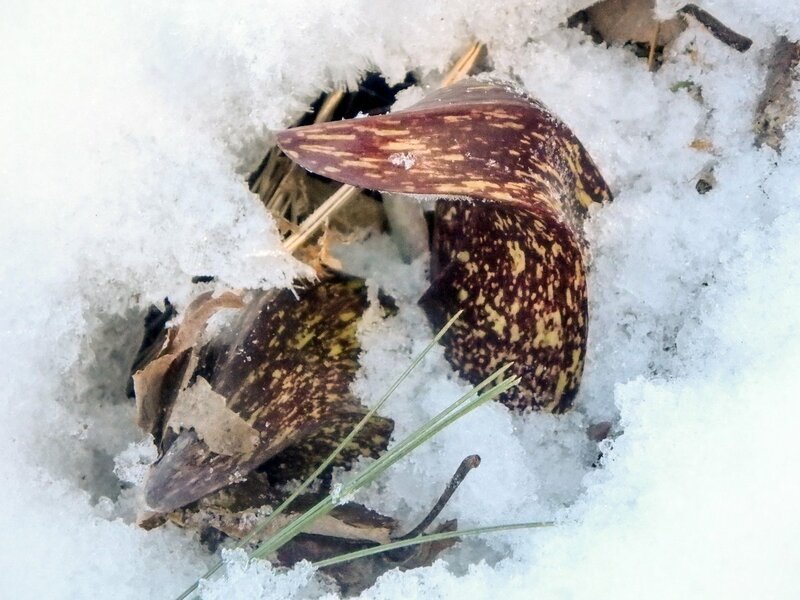 It isn’t always plants that appear from under the snow. I love seeing these curled fern leaves from last year. 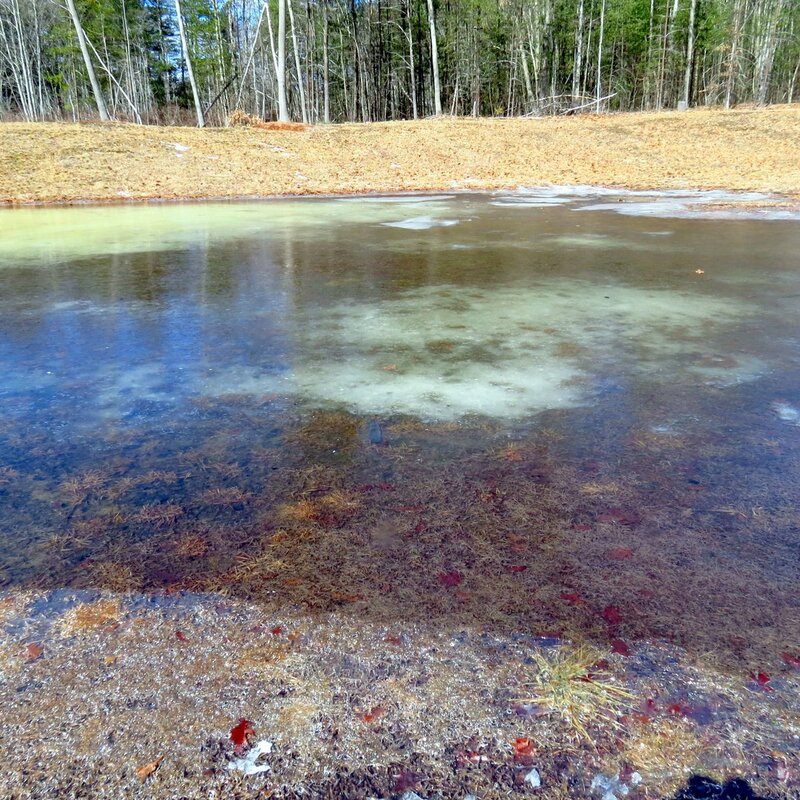 Puddles get very big at this time of year and some, like the one seen here on a mowed lawn, could almost be called small ponds. It had a thin layer of ice on it on this cold morning. 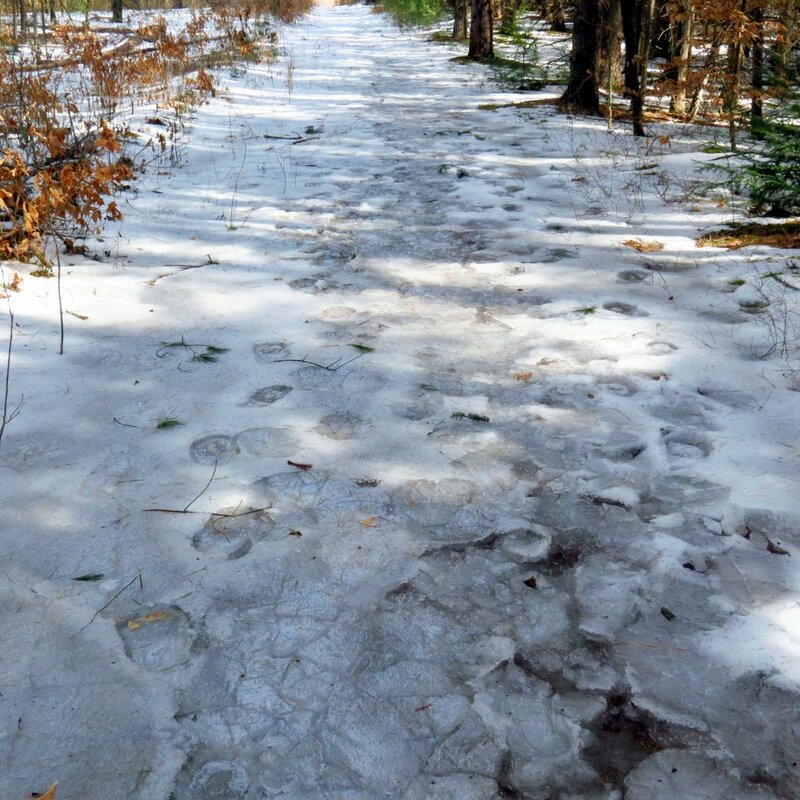 Trail ice unfortunately is some of the last to melt. I’m guessing it’s because it has been so packed down and has become dense. It’s very hard to walk on without ice spikes. 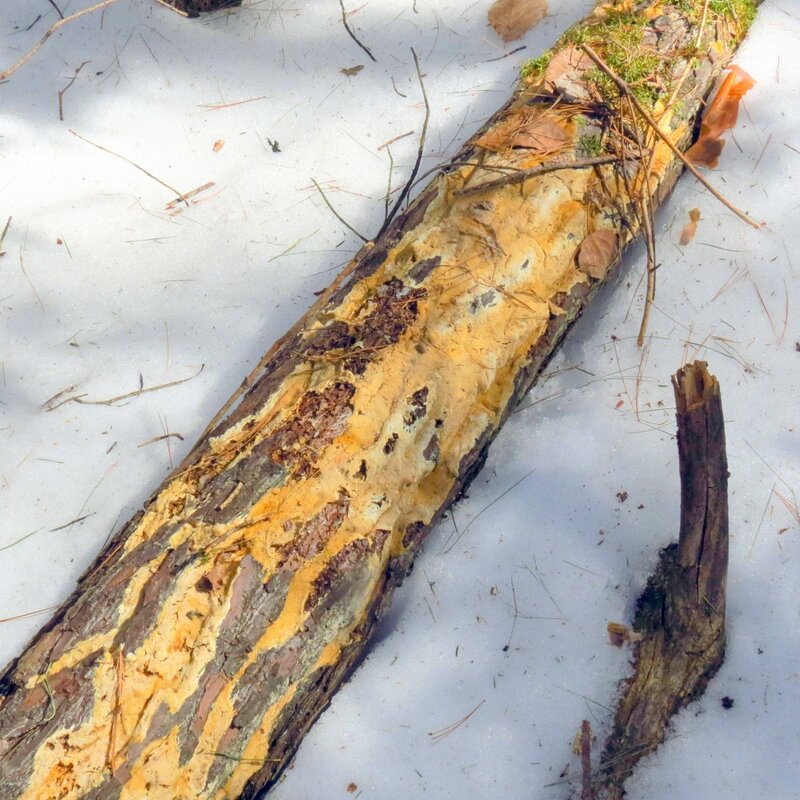 Did this tree look like that when it fell or has the yellow conifer parchment fungus been growing under the snow all winter? 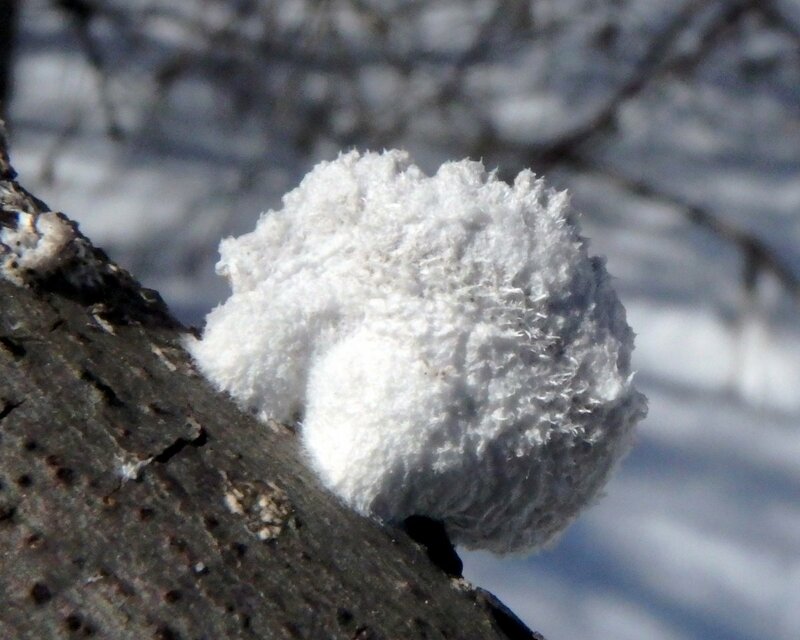 Whatever the answer, the tree was covered with it. 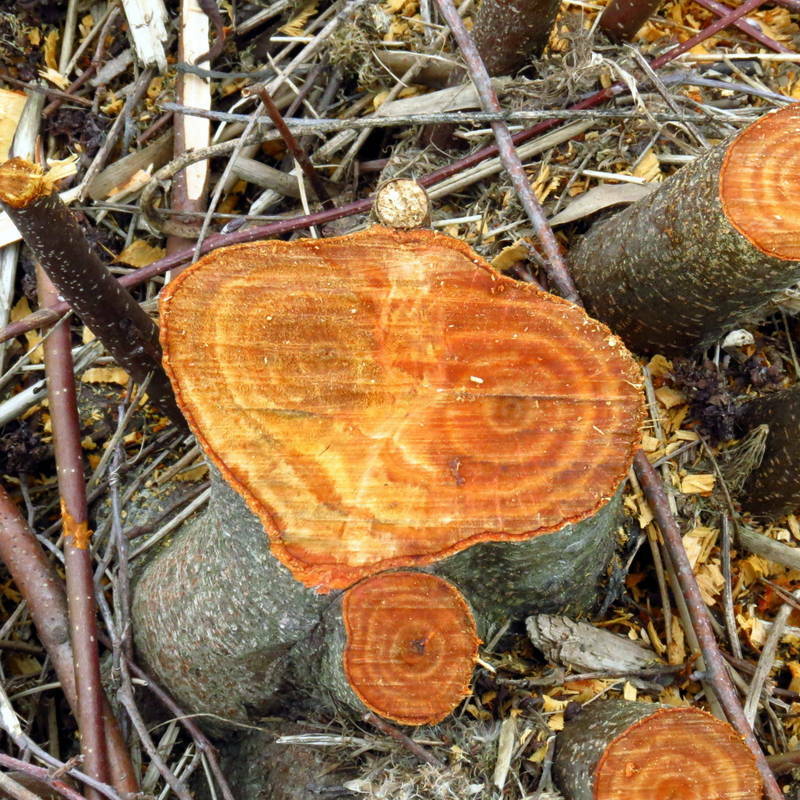 Conifer parchment fungus (Stereum sanguinolentum) causes brown heart rot in trees, which is a reddish brown discoloration in the wood of conifers. It is also called bleeding parchment fungus because of the red juice they exude when damaged, but so far all of the examples I’ve seen were very dry and hard, and fairly impossible to damage. Conifer parchment fungus is beginning to concern me because I’m seeing so much of it, virtually everywhere I go. If it’s on a standing tree like this one it means a death sentence for the tree. Nature will have to run its course and find a balance; I doubt there is very much we can do to stop it. 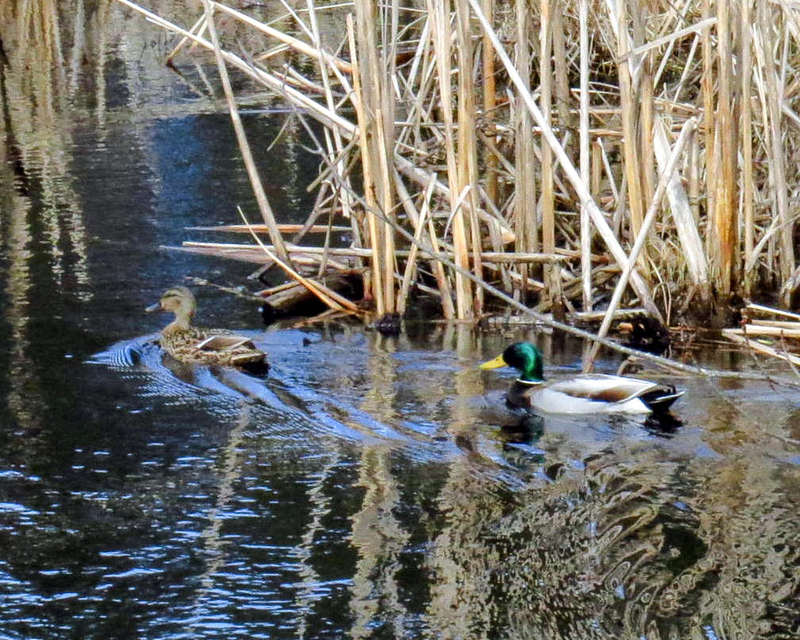 There were mallards on the Ashuelot River but the river wasn’t quite at bank full despite all the melting going on. Regular readers know that I like to try to catch cresting river waves with my camera, but the water level has to be just right for good waves. 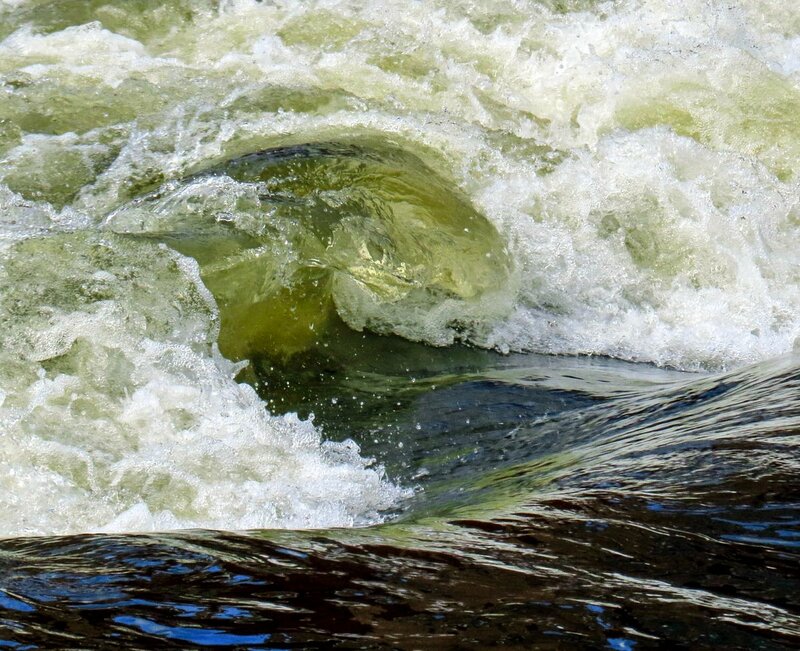 If the river is too high or too low the waves will be small or nonexistent. This one was small but I still wouldn’t want to be hit by it. 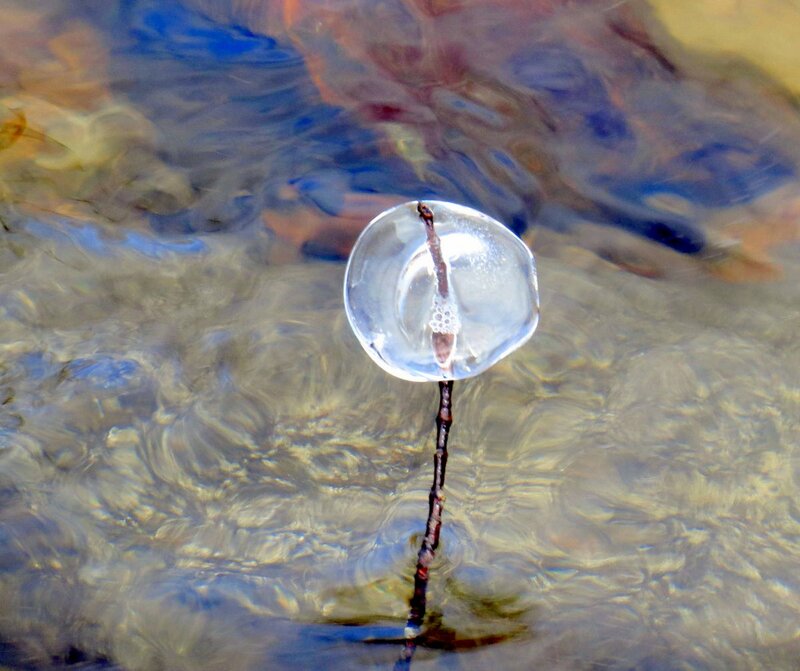 Instead of the usual teardrop shape ice baubles along the river took on more of a flattened disc shape this day. They look like coins on sticks in this photo. This one looked more like an orb but it was a disc. 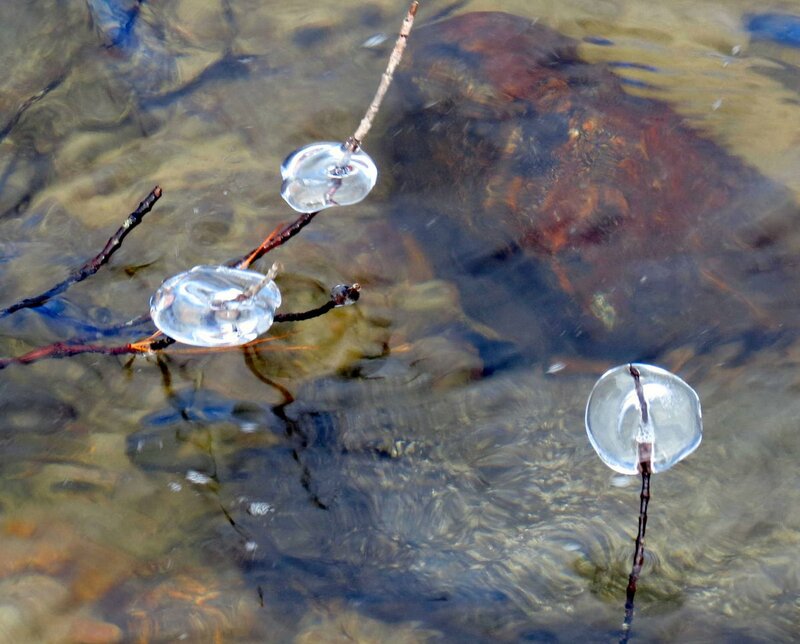 These may be the last ice baubles I get to see this year but that’s okay. They’ll be a happy memory and I’ll be warmer. 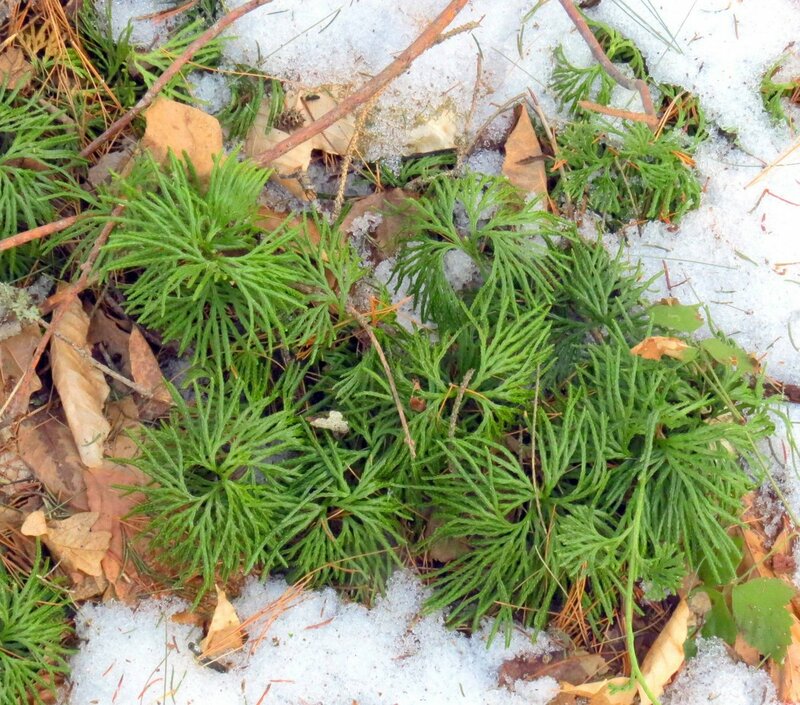 Fan clubmoss (Lycopodium digitatum) is one of my favorite clubmosses but I don’t see it too often because it has been so over collected for Christmas wreaths and other things. 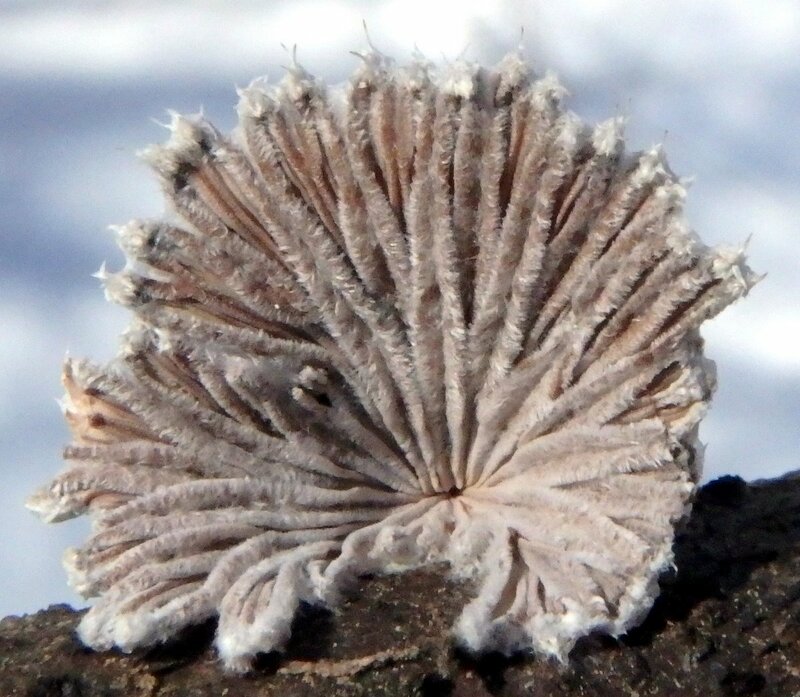 A single plant can take 20 years from spore to maturity so they shouldn’t ever be disturbed. 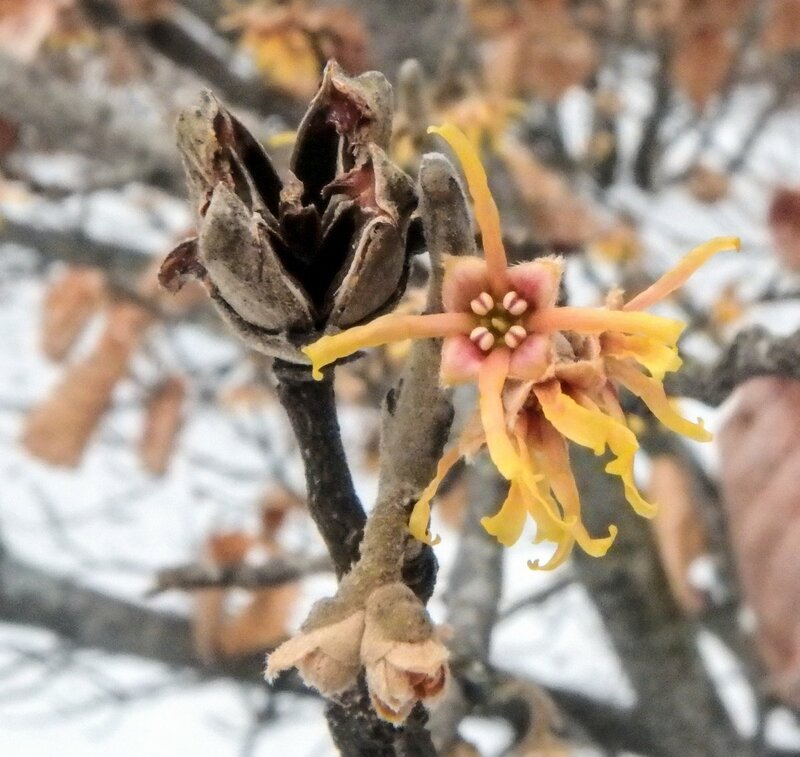 This plant gets its name from the way its branches fan out at the top of the stem. 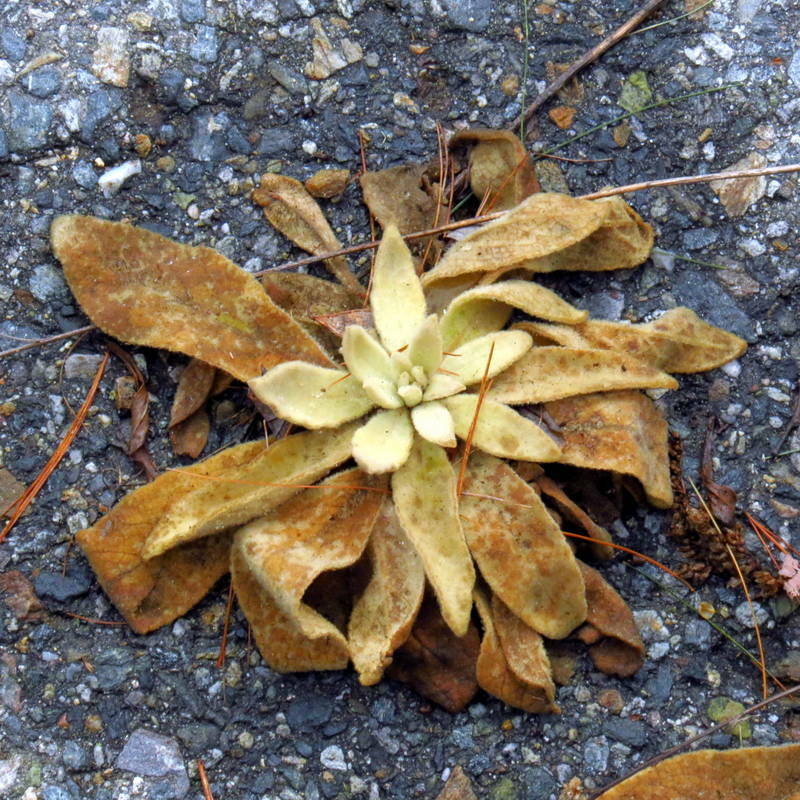 Trailing arbutus (Epigaea repens) has made it through the winter just fine. This plant is also called Mayflower because that’s when its small, very fragrant white or pink flowers appear. It was one of my grandmother’s favorites and seeing it always makes me think of her. Even ice won’t hurt its tough, leathery leaves. 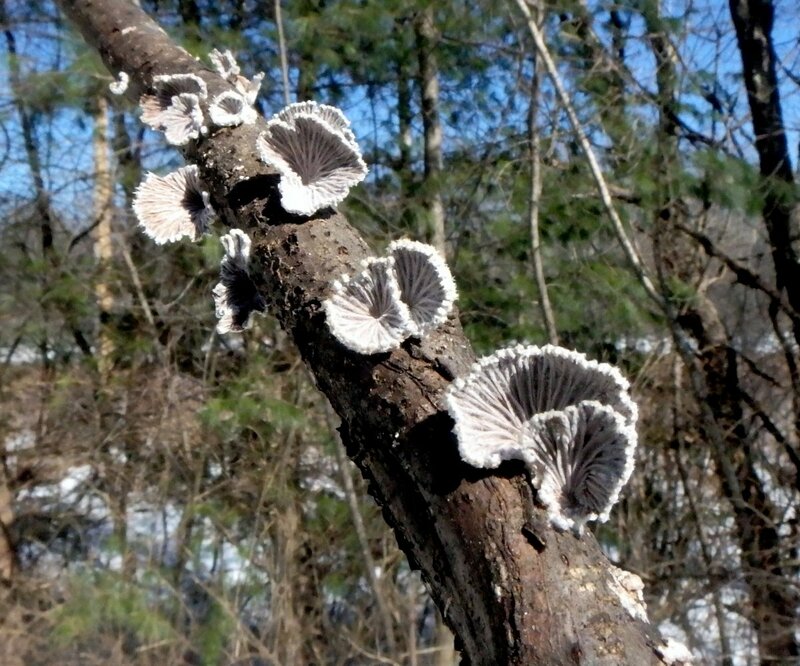 So what I hope I’ve shown in this post are all the beautiful and interesting things that are buried under the snow in winter; things like the turkey tail fungi (Trametes versicolor) above. This is the time, before plants start growing new leaves and hiding them, that is the best time to find things like this. 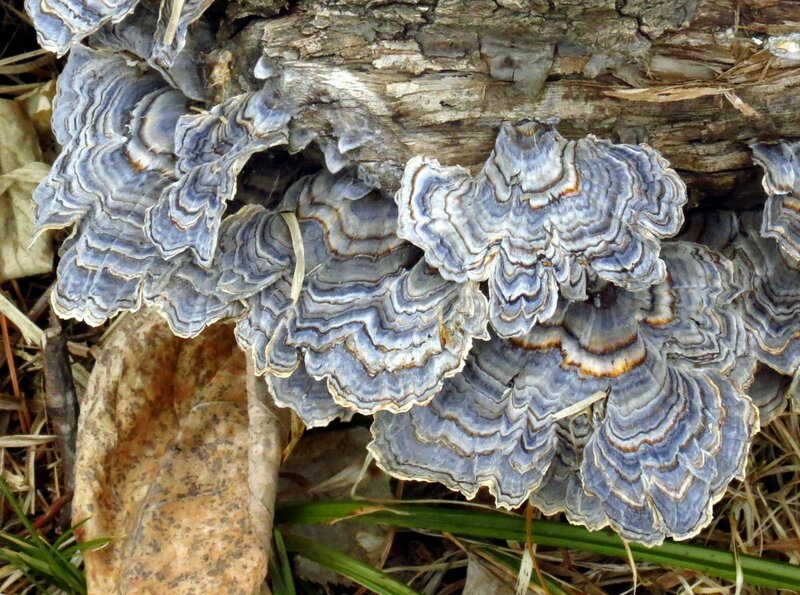 These are some of the most beautiful turkey tails I’ve seen and there they were, in a spot I’ve visited many times, but I’ve never seen them. I hope you’ll see something as beautiful when the snow melts where you are. 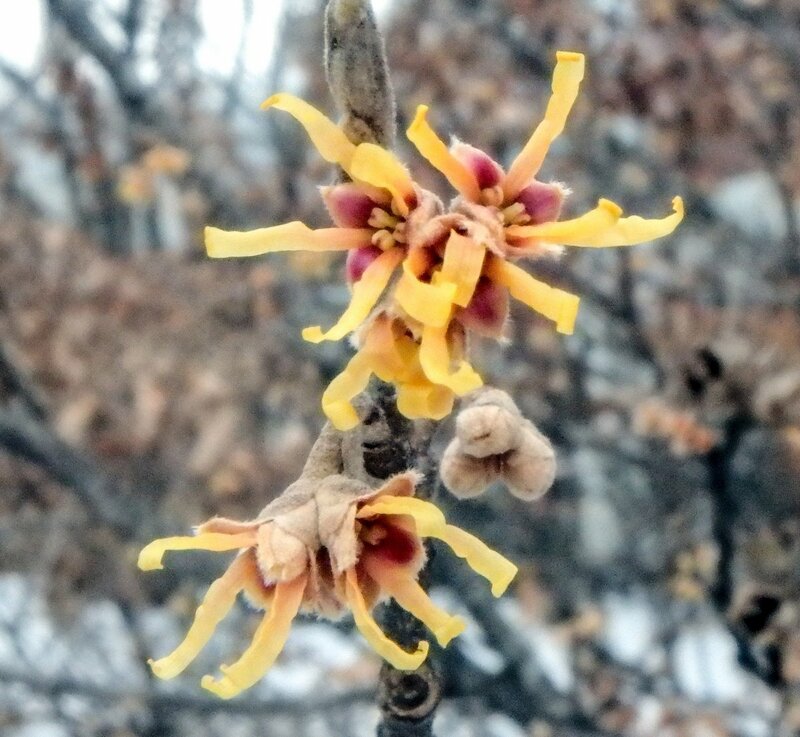 I was hoping I’d be able to show flowers on the first day of spring and, though they might not seem like much, these vernal witch hazel petals (Hamamelis vernalis) just coming out of the fuzzy buds were wonderful to see. Actually tomorrow is the first full day of spring but it does start today. 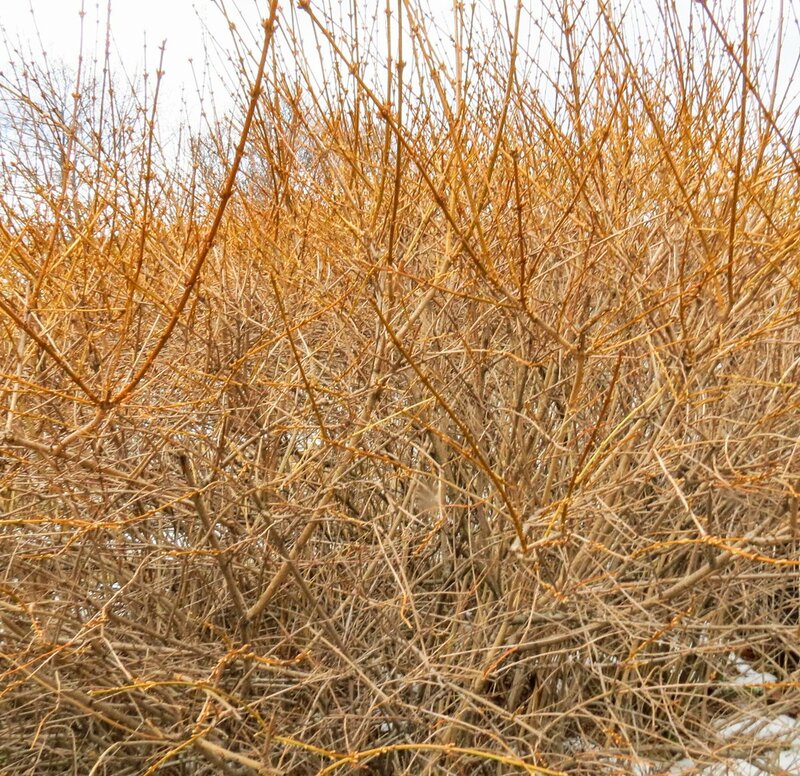 Forsythia is a shrub that takes on a kind of golden hue in spring and this year many are going for broke. 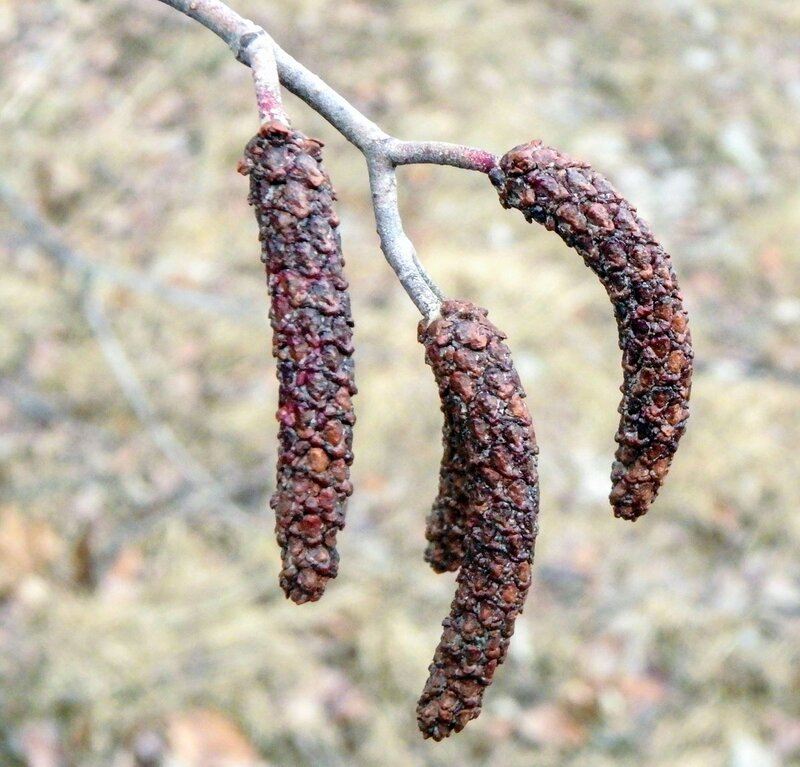 Alder (Alnus) catkins are also coloring up, preparing to open and release the pollen from the male flowers, hundreds of which are hidden behind the scales of the catkins shown here. 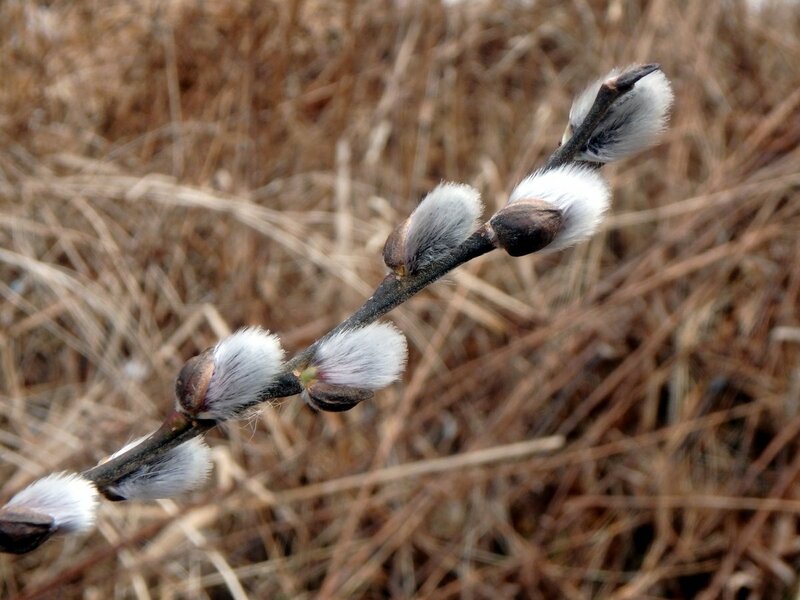 Willow catkins aren’t showing any color yet but I think that any day now yellow flowers will start to show among the gray fuzziness of the catkins. Crocuses are up and budded but I didn’t see any blossoms fully open yet. 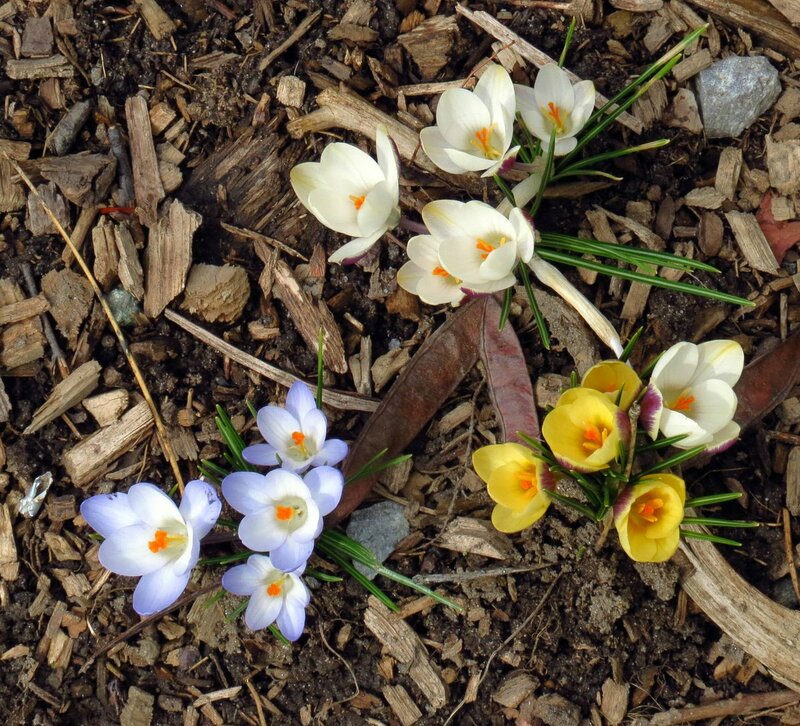 It’s great to see a crocus, blossoming or not. 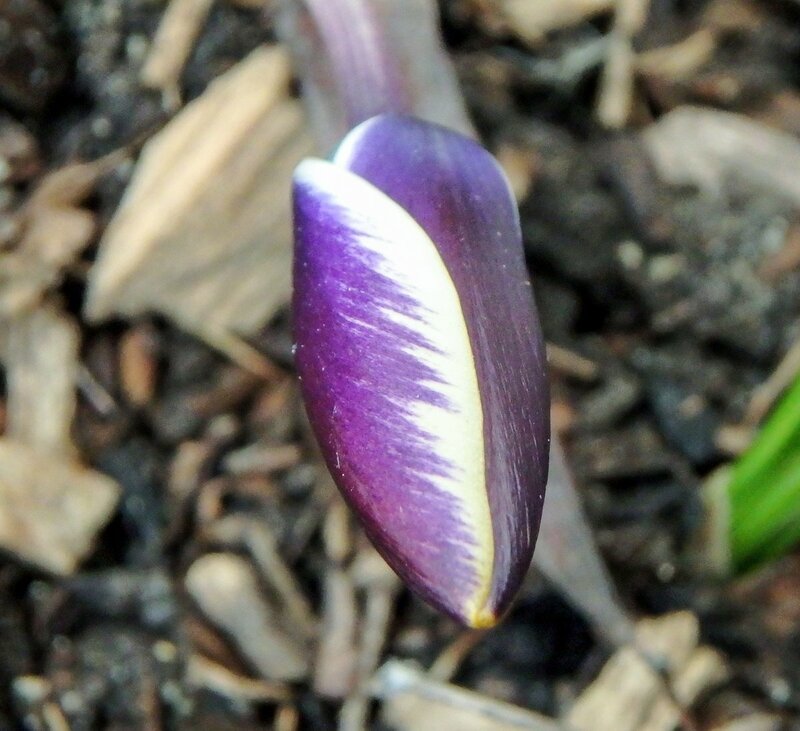 There are reticulated iris in the same bed as the crocuses and I think this might be one of them. 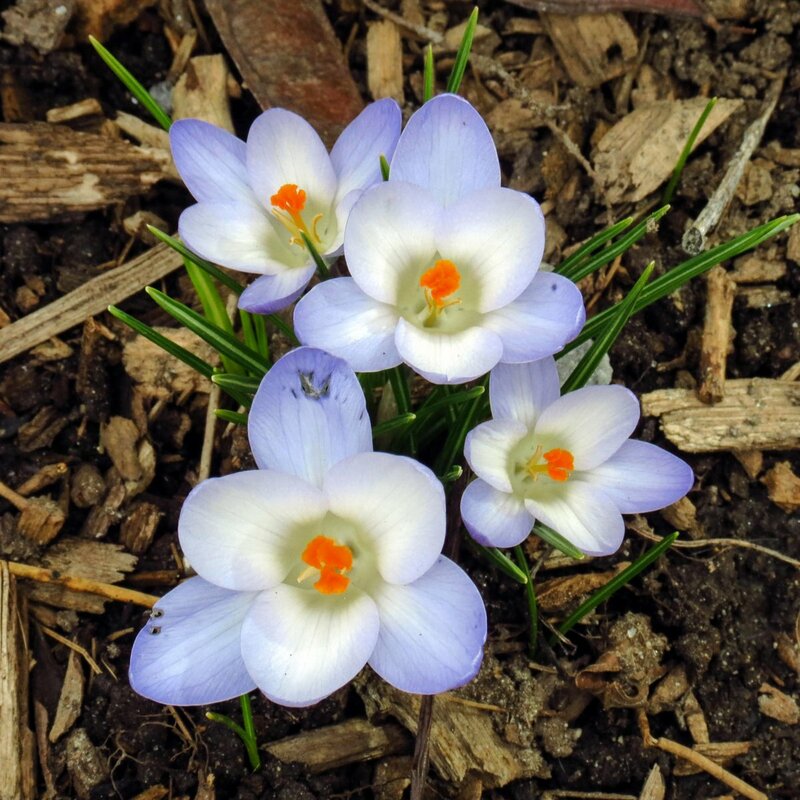 they’re very early and often are the first spring bulb to bloom. Daffodils are still thinking about things and can’t seem to make up their minds whether it is really spring or not. Who could blame them, with 60 degrees one day and 40 the next? I remembered that what I thought were tulips a post or two ago are actually hyacinths. They look a lot alike at this stage and I seem to make the same mistake every year. The daylilies at a friend’s house are up and about 3 inches tall, but they get warmth from the house’s foundation. They are an early plant but I haven’t seen any anywhere else yet. 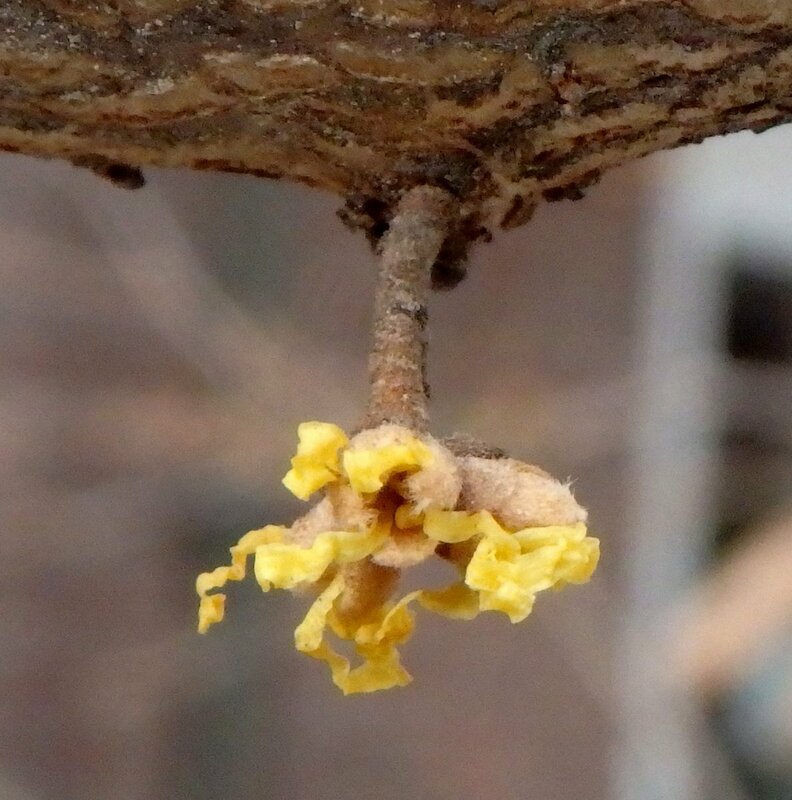 I can’t explain the feeling I got when I saw the yellow buds showing on this Cornelian cherry (Cornus mas) but it was a good one. It wasn’t because the flowers are spectacular but more because it is a sure sign of spring and my heart soared at the thought of it. Many people haven’t heard of this non-native, early blooming shrub but it hails from the Mediterranean regions and was well known to Ancient Greeks and Romans. Archeological digs show that it’s small, tart, cherry red fruits have been eaten by man for thousands of years. 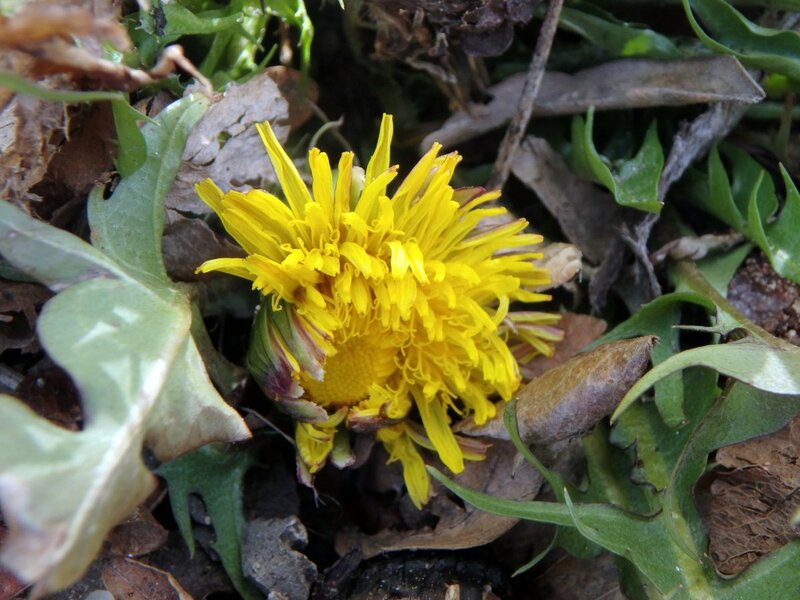 It has quite small bright yellow, four petaled flowers that bees absolutely love. 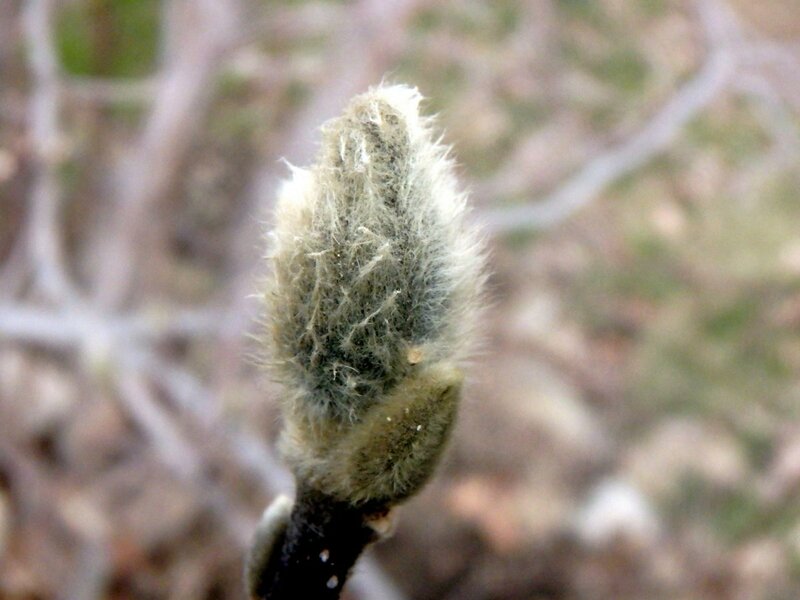 I haven’t seen anything happening with the magnolias yet but soon their fuzzy caps will come off to reveal the buds within. 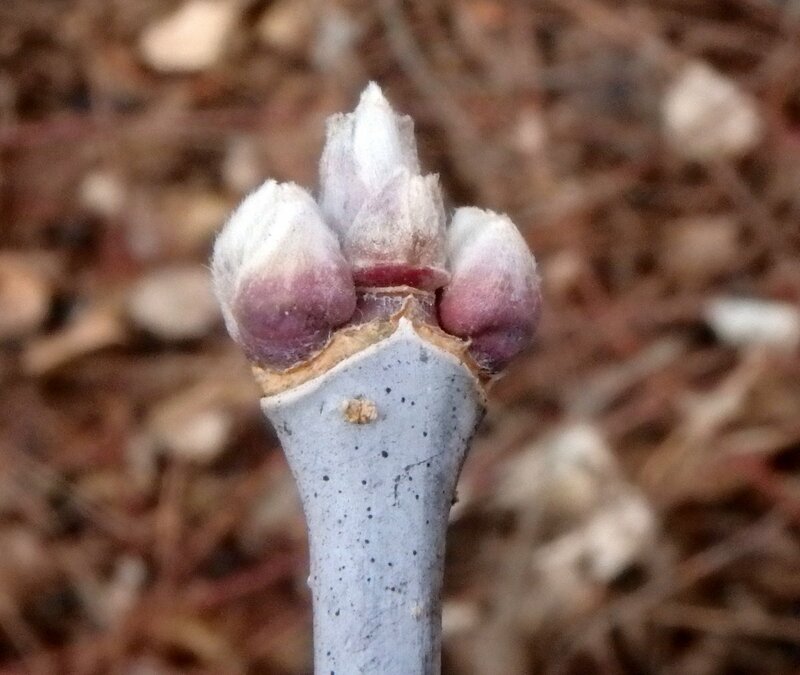 Lilac buds on the other hand, have started to open. 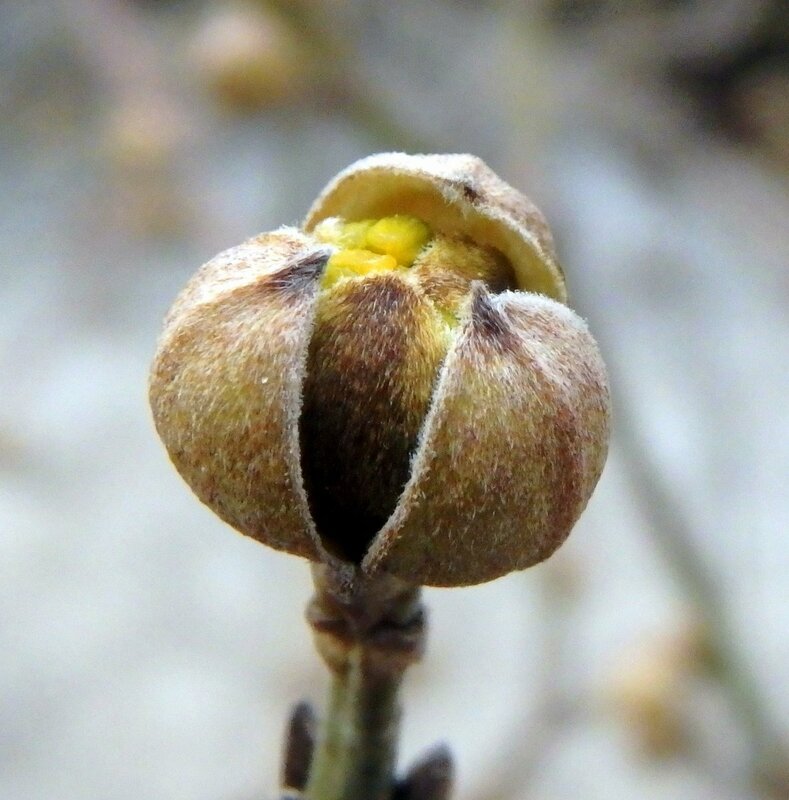 You can see how the bud scales, which are very tight and shingle-like in winter, have started to pull away from each other. By mid-May they’ll be in full bloom and their wonderful fragrance will be on the breeze no matter where you go in this area. 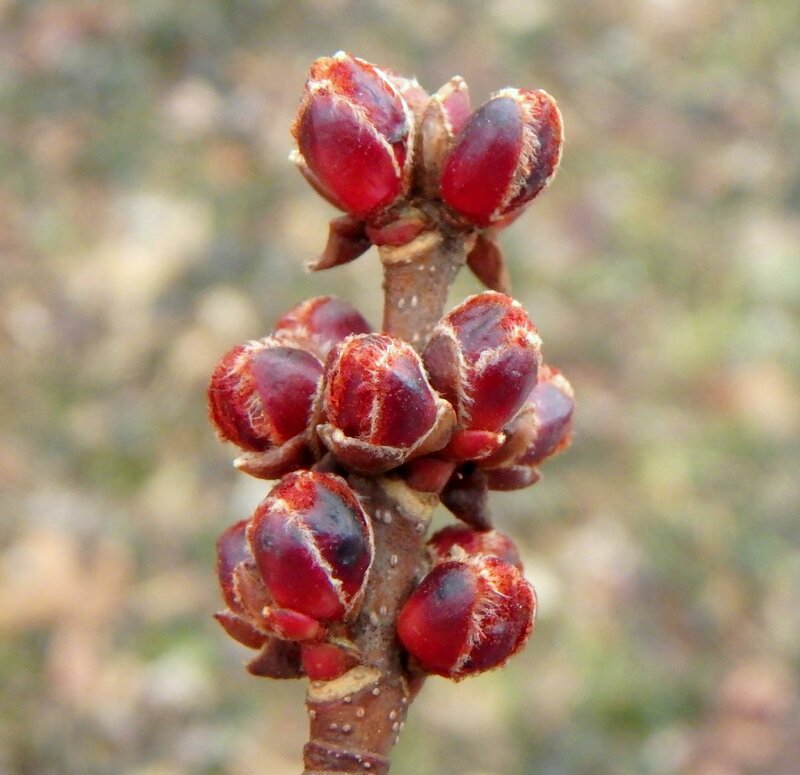 Last year I saw red maple flowers (Acer rubrum) on March 25th. 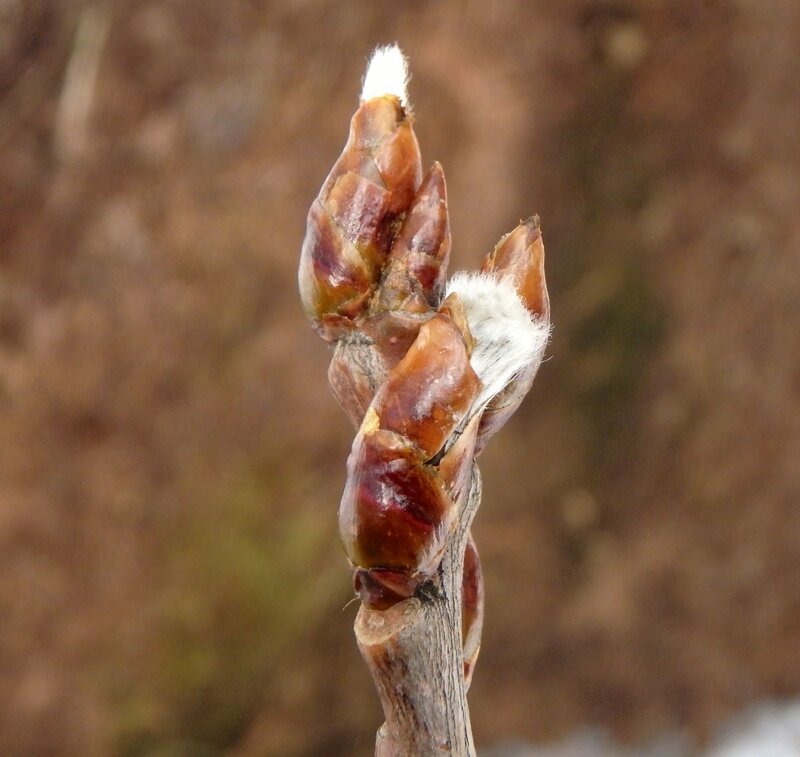 This means that these buds have about a week to fully open if they want to do that again and I think that they probably will because we’re supposed to have a week of above freezing temperatures. 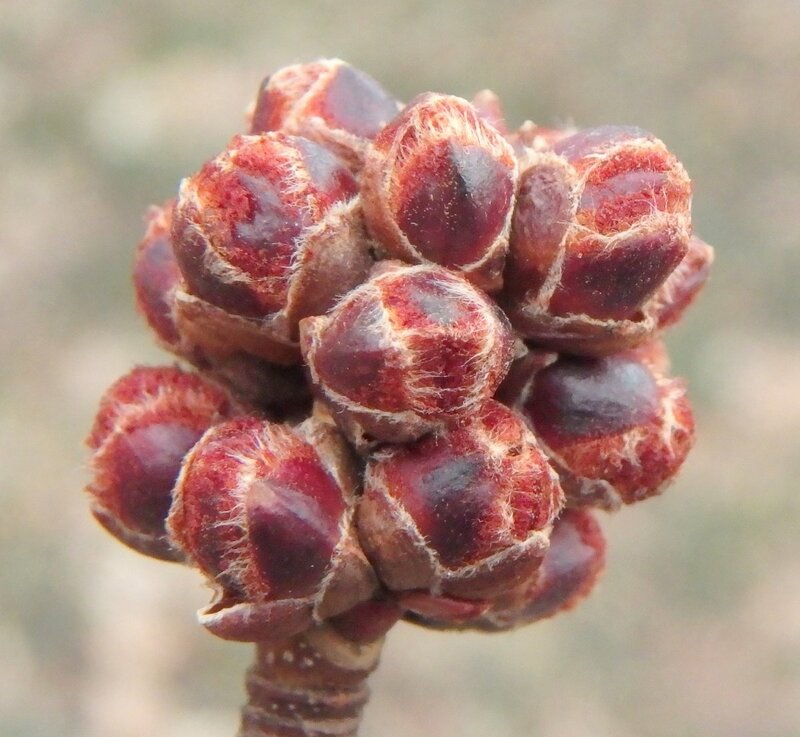 But I’ve also seen red maple buds open too early, and the flowers have been badly frost bitten. Luckily the blossoming time of red maples is staggered from tree to tree and since not all flowers have opened there are always some that don’t get damaged by frost. 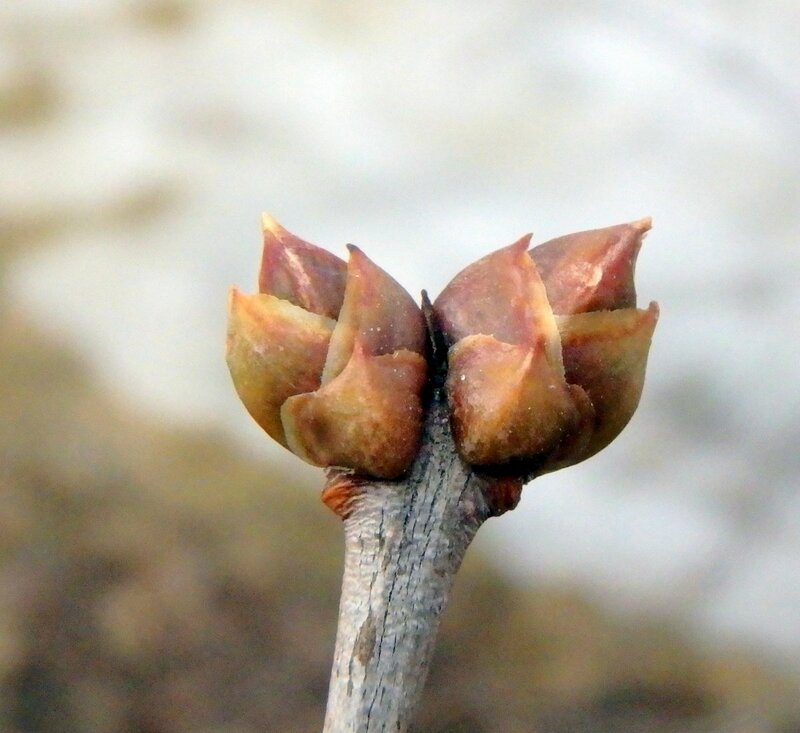 In this shot the uppermost buds on the right and left look to be about ready to open. I went to the forest where the spring beauties bloom. I didn’t expect to see any flowers but I wondered if I might see a leaf or two. I didn’t see any but they’ll be along soon. 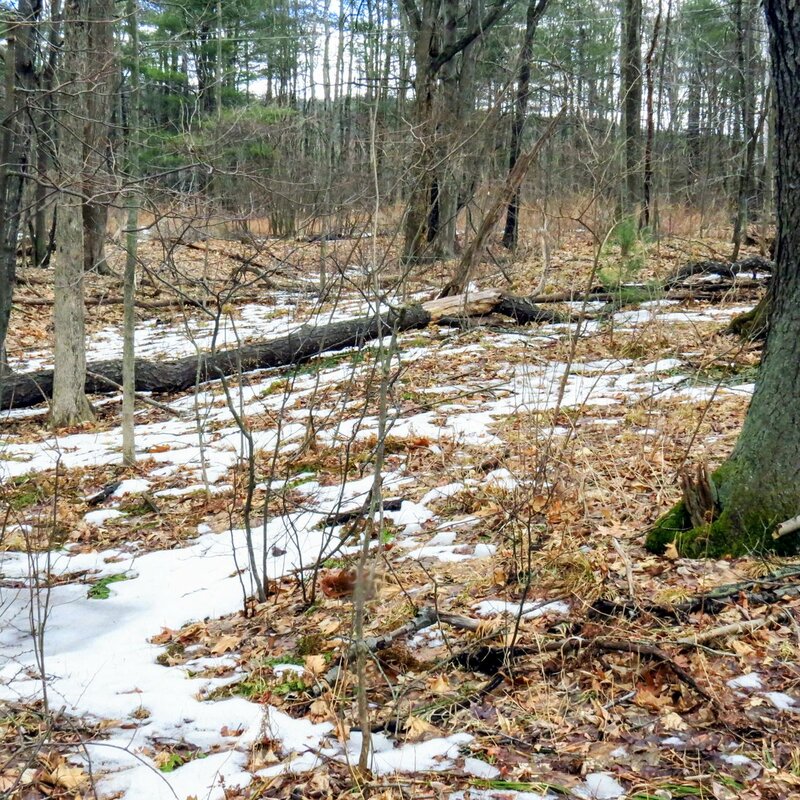 Many thousands of beautiful little spring beauties should carpet the floor of this piece of forest sometime in mid-April. I didn’t see flowers but I saw that the beavers sure had been busy. And so had the woodpeckers. The mottled yellow and maroon spathes of skunk cabbages (Symplocarpus foetidus) are up and so thick you have to be careful not to step on them. If you do step on one you know it; the smell of skunk can be very strong sometimes. It’s too wet where they grow right now to kneel and get a shot of the flowers inside the spathe but I hope to be able to do so soon. 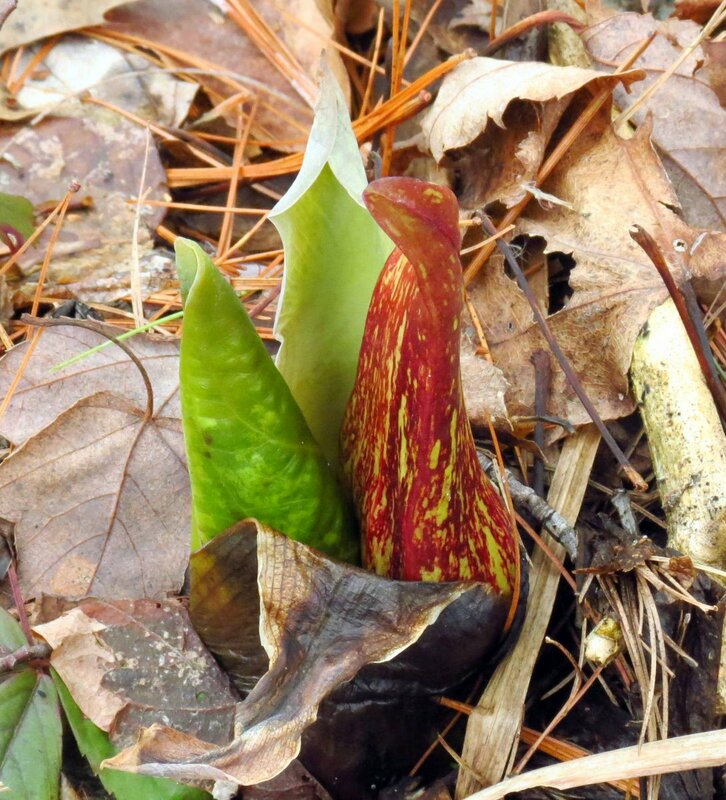 That’s a leaf shoot on the left of this skunk cabbage spathe, and that’s very unusual. The leaves don’t usually appear until after the plants have bloomed. 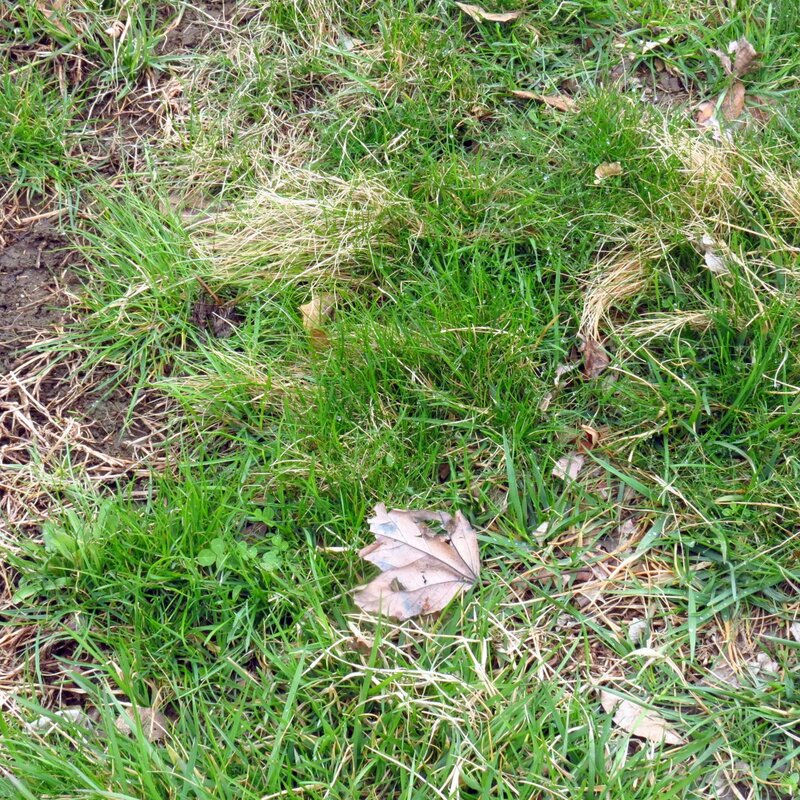 Young leaves can resemble cabbage leaves, but only for a very short time. 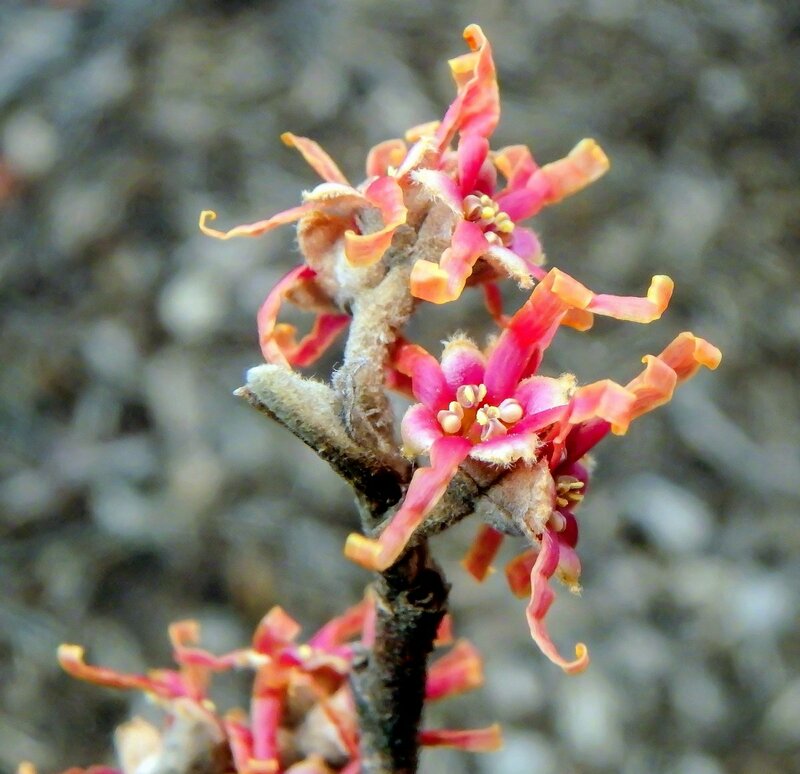 Here’s another beautiful vernal witch hazel that I found blooming by following the scent. I know a place where several large shrubs grow. When I visited them I couldn’t see any blossoms but I could smell them so I knew they were there somewhere. And they were; way in the back was a single branch loaded with these blossoms. Their wonderful clean scent has been compared to a load of laundry just taken in from the line, and that’s as good a description as I’ve heard. Maybe a tiny bit spicy as well for this variety. Thanks for coming by. Happy first day of spring! We’re still on the weather roller coaster but it is slowly warming up and the snow is melting, as the melt ring around this pinecone shows. I was happy when I found this because it answered a question that I’ve had for a long time: why do melt rings form around tree trunks? 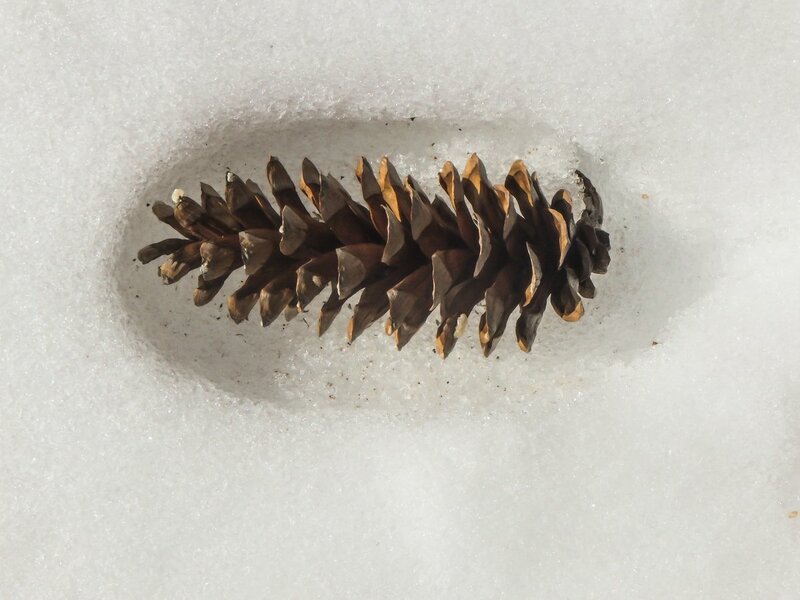 As the pinecone shows it has to be the sun warming it up, and as the pinecone releases that warmth the snow around it melts. Or maybe it’s simply heat radiating from the pinecone during the day when the sun is shining. The dark cone would absorb more sunlight than the white snow would. 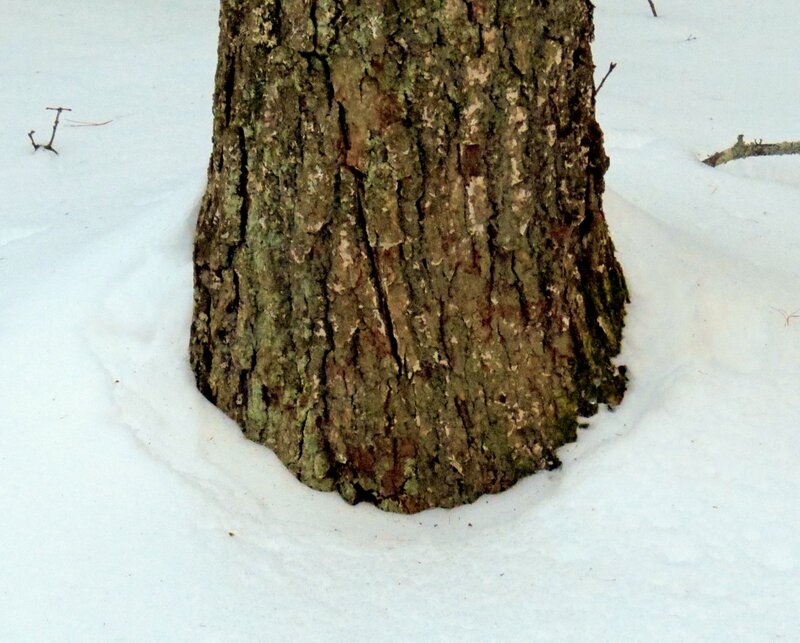 Here is a melt ring just getting started around this tree. 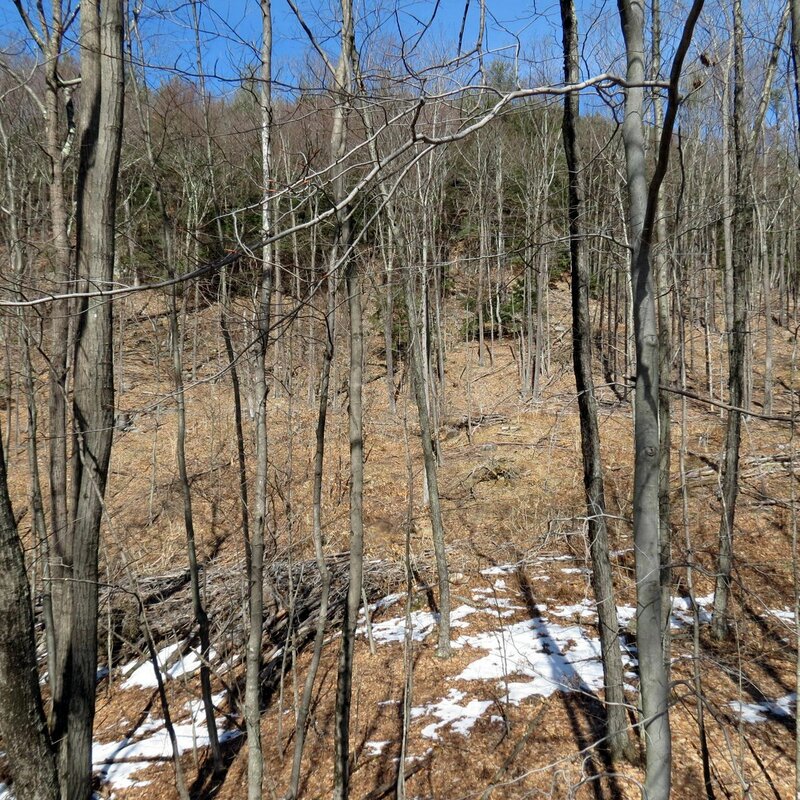 A study done by Emeritus Professor of Botany Lawrence J. Winship of Hampshire College, where he used an infrared thermometer to measure heat radiated by tree trunks, found that the sunny side of a red oak was 54 degrees F. while the shaded side was just 29 degrees F. And the ground temperature was also 29 degrees, which means it was frozen. 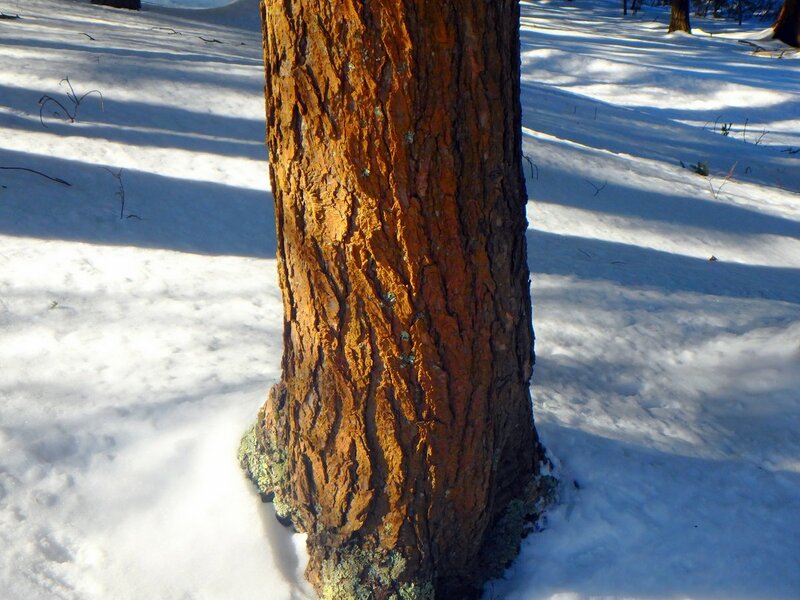 This shows that trees really absorb a lot of heat from the sun and it must be that when the heat is radiated back into the surroundings it melts the snow. 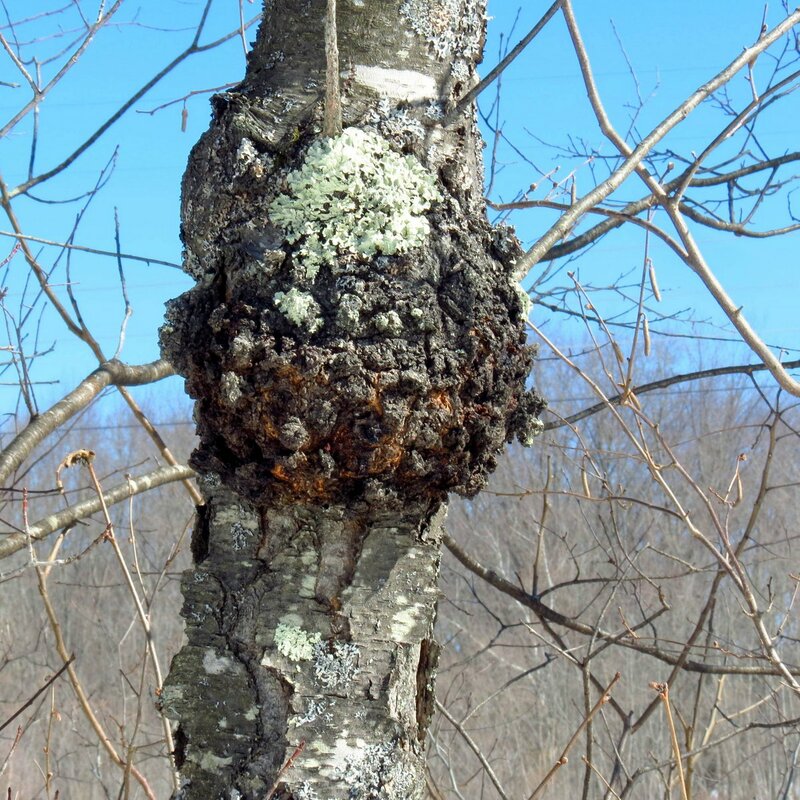 The professor found that the same was true on fence posts and stumps so the subject being alive had nothing to do with it, even though a living tree should have much more heat absorbing water in it. 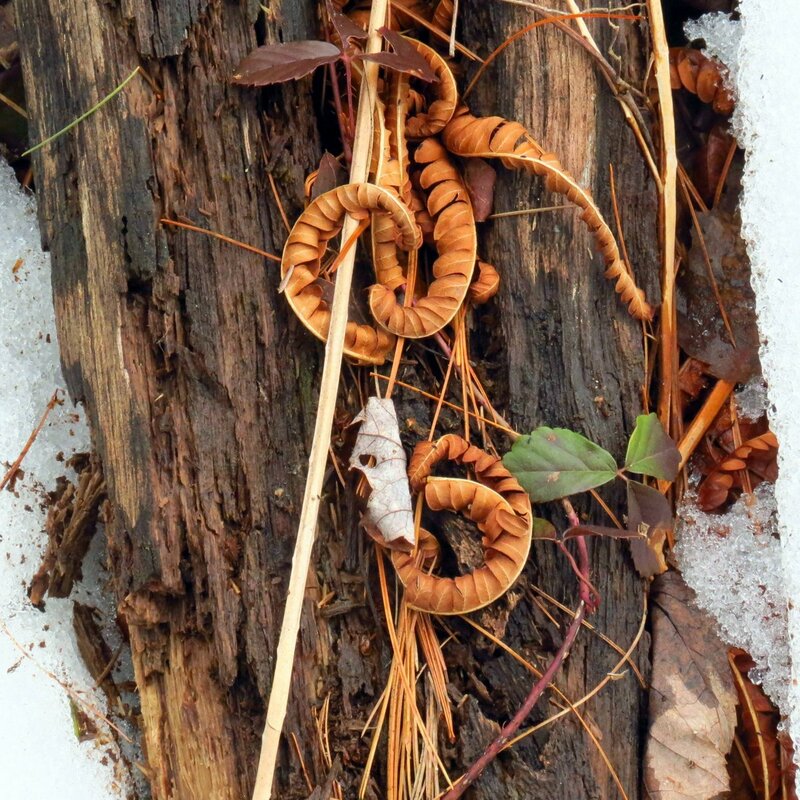 In my mind, the pinecone in the previous photo answers the question of melt rings. But I didn’t have long to wonder about melt rings on trees because on Monday March 4th we got about 6 inches of new snow. This shows part of my drive to work that day. 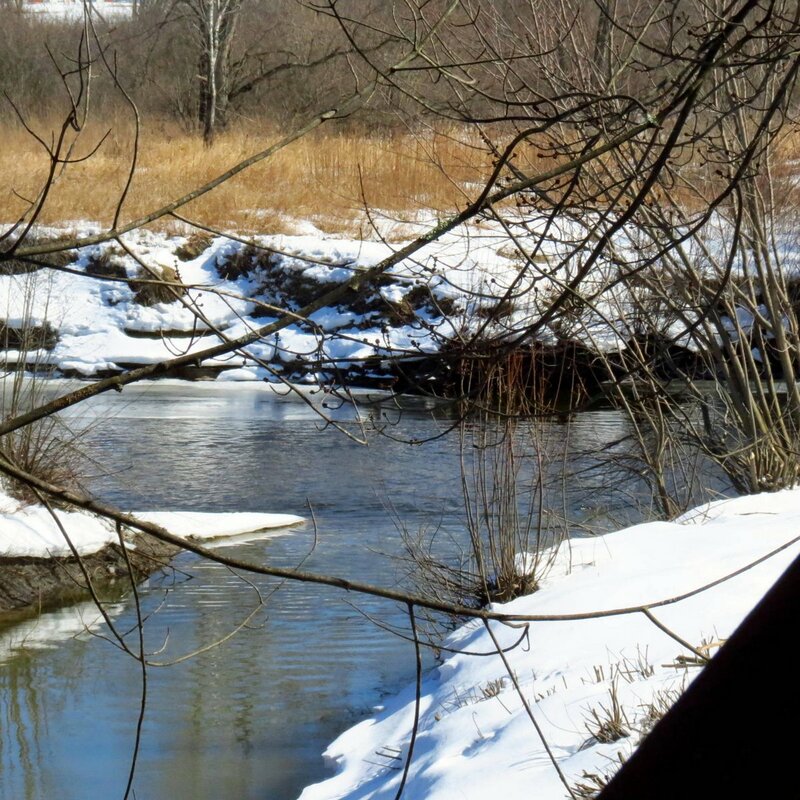 I pass this scene almost every day so I can see if the ice is melting. It was and then it wasn’t. 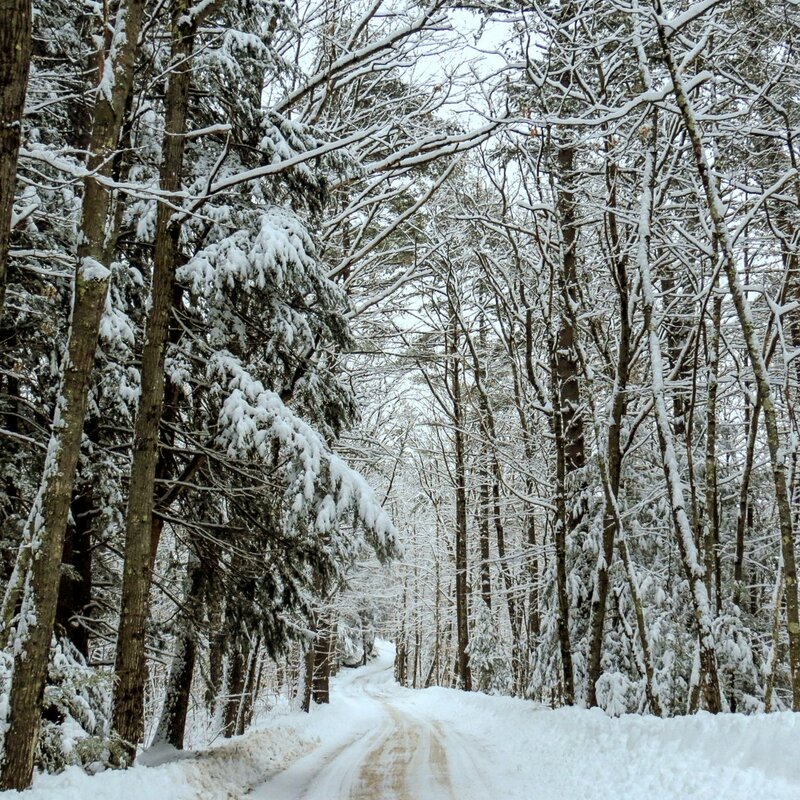 Winter can be very beautiful but the pull of spring fever can be terribly strong. 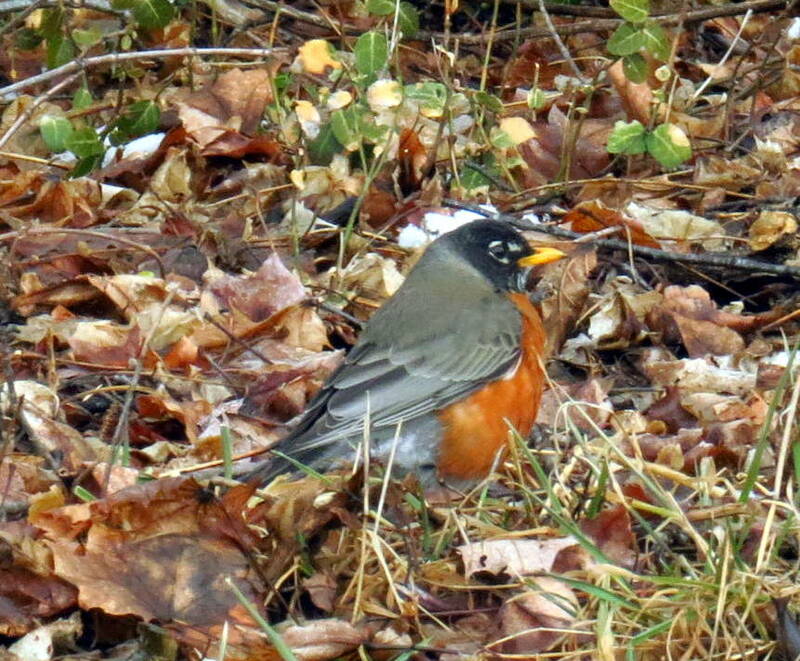 By this time of year almost everybody but is ready for spring and waiting impatiently. It’s hard these days to follow a trail that hasn’t been broken. It never used to be but things change. 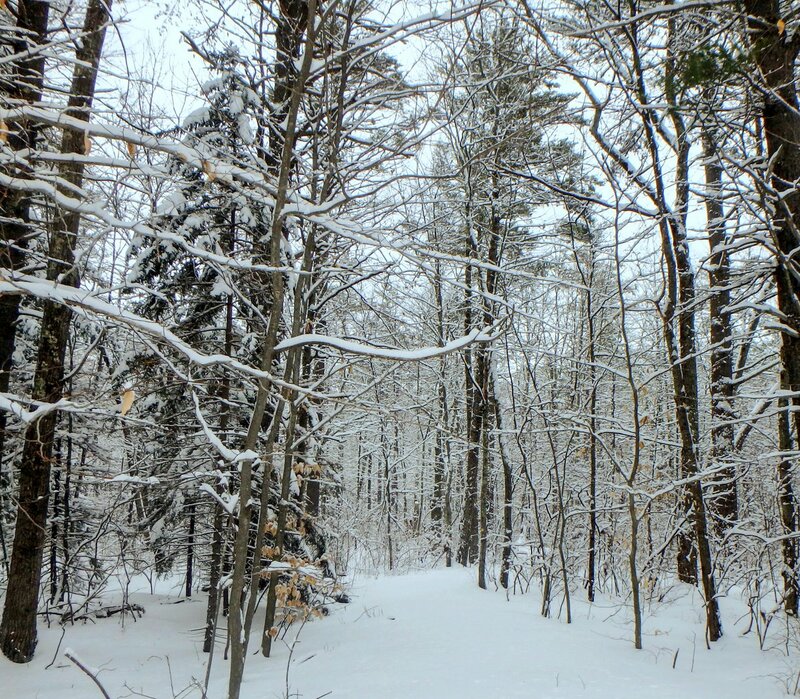 I’ve never been a real fan of snowshoes so I used to just trudge through it, even if it was up to my knees, but going any real distance through snow much deeper than your knees is a struggle at any age and in any condition, and these days I avoid it. But as I said it can be beautiful enough to stop you in your tracks. 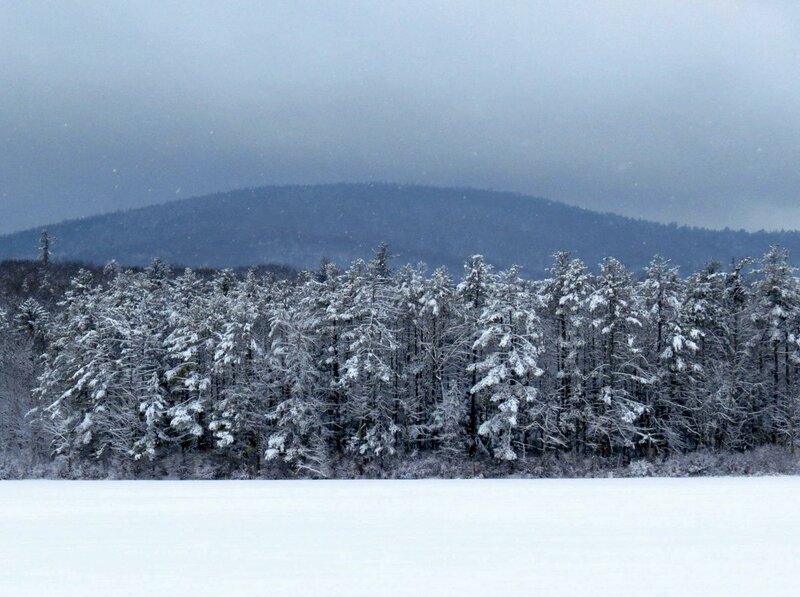 Every season has its own beauty, as this early morning view of Half Moon Pond in Hancock shows. No matter what the sun always appears again and it was very beautiful on this eastern hemlock tree, I thought. I think algae colored its trunk and the sun came along and lit it up. You can walk just about anywhere in nature and find beauty like this any day of the week, and if that isn’t a gift I don’t know what is. It’s amazing how a little sunlight can transform the simple into something beautiful, as it did with these deer tongue grass leaves. 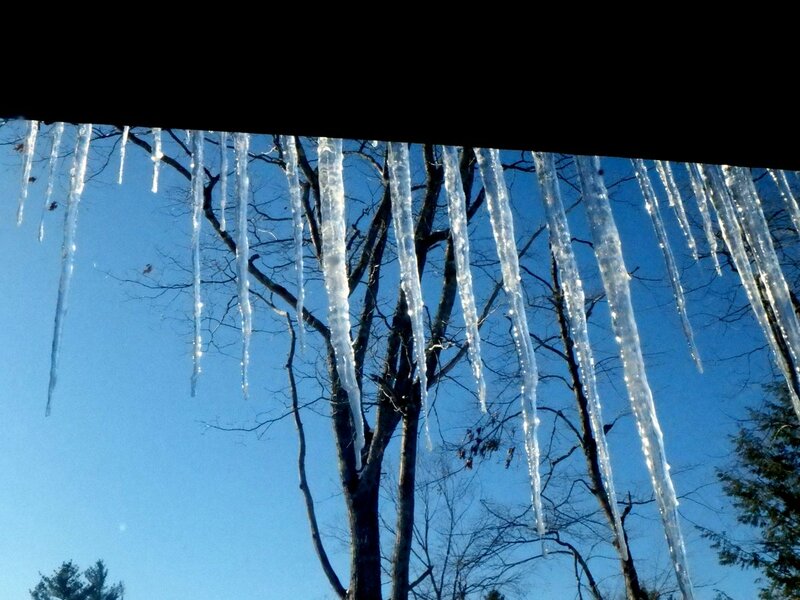 I don’t think I’ve ever shown icicles hanging from the eaves on this blog before, but that might be because they are so common. 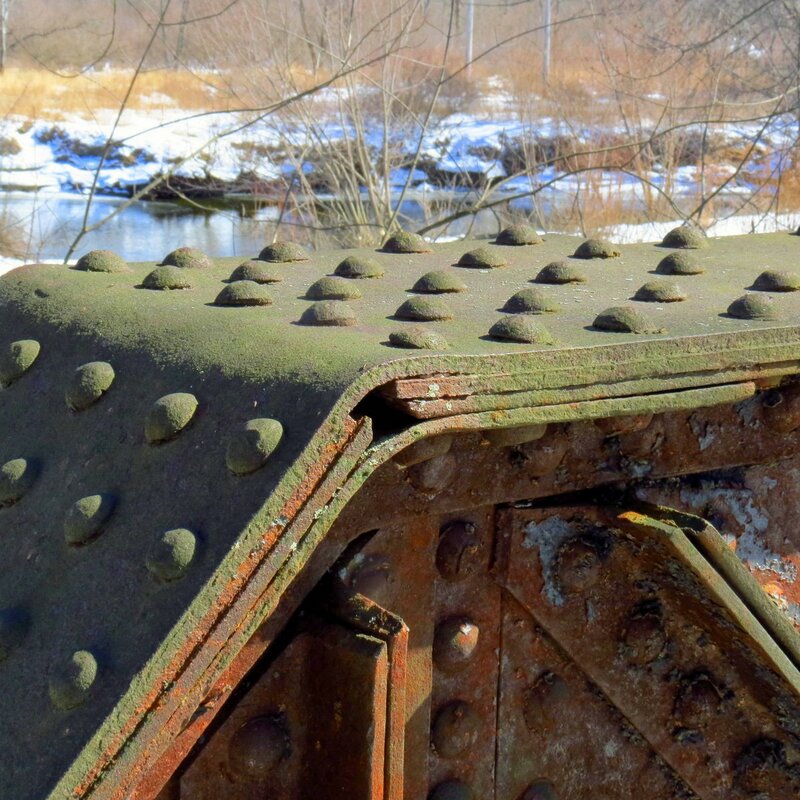 You see them on just about every structure in winter. 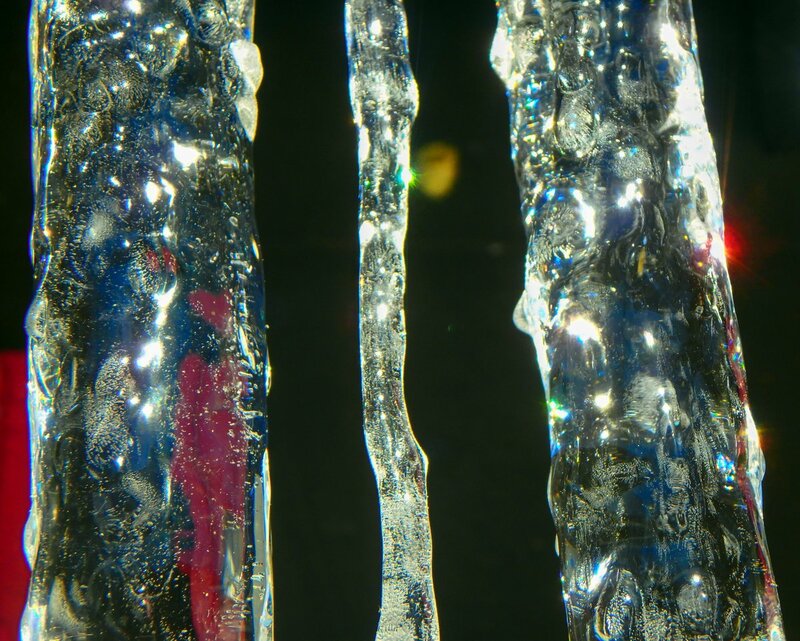 I love the way icicles sparkle with color in the sun like prisms. This shot doesn’t quite catch it but there was a lot more color in them. One cold morning frost flowers bloomed on the ice of mud puddles. 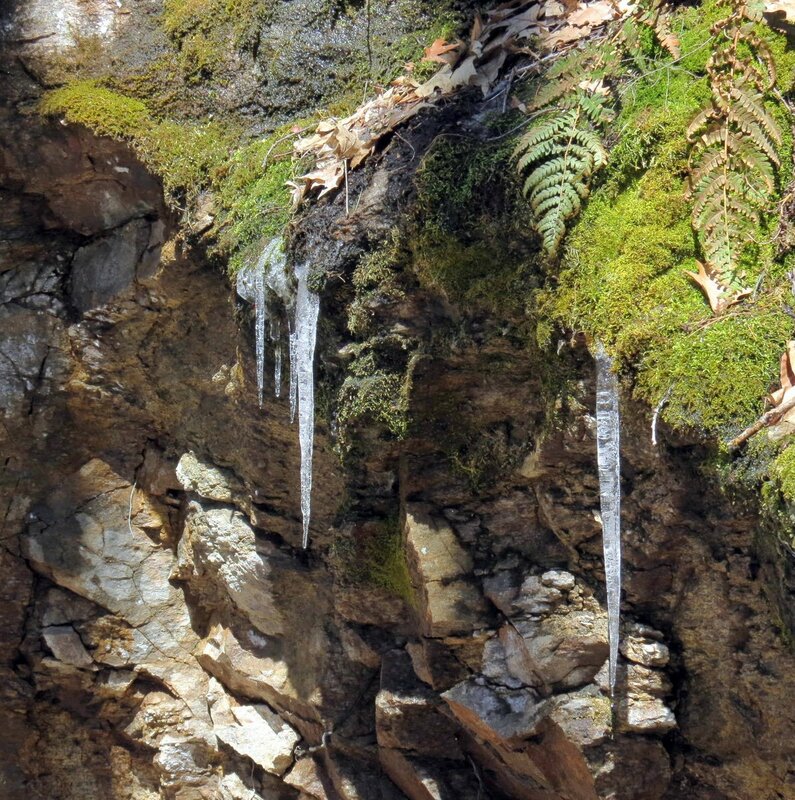 They form when the frost point in the air is reached and water vapor condenses into ice. 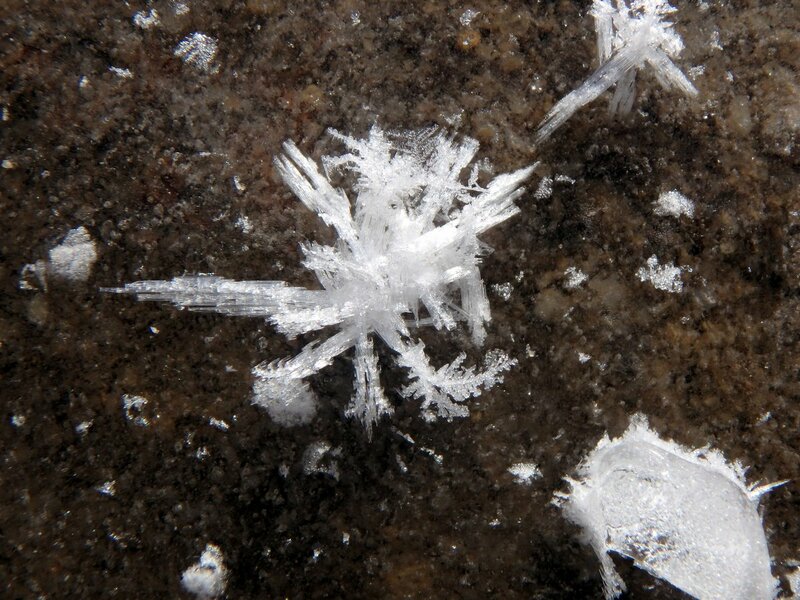 They are a form of hoarfrost, so delicate that a touch of a finger or a warm breath will destroy them. 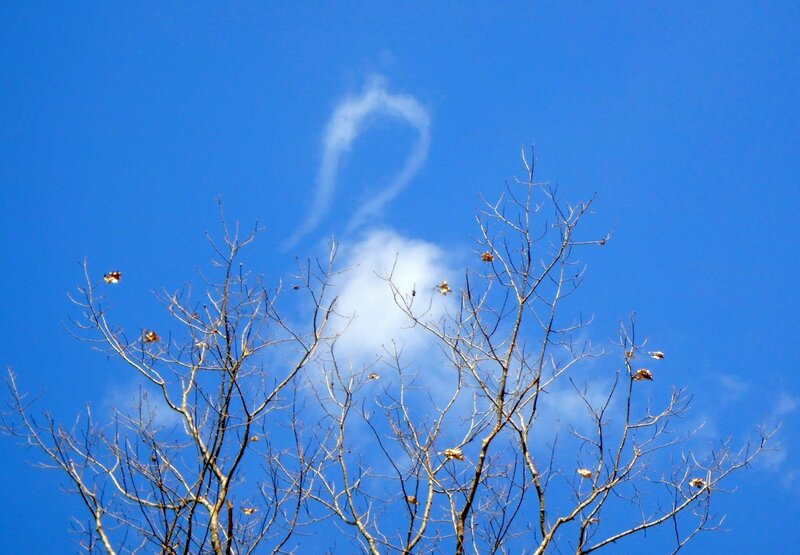 In my experience it has to be very cold for them to form, but there also has to be plenty of water vapor in the air. 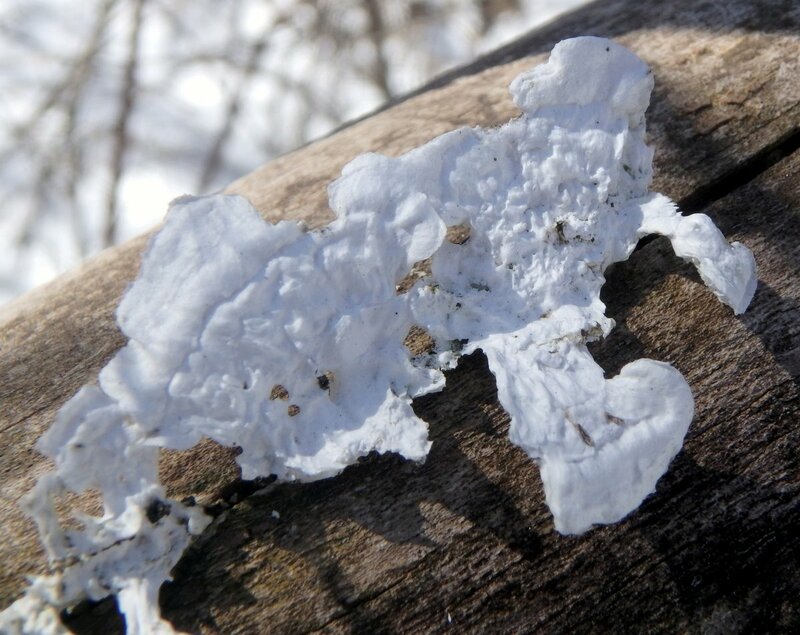 That’s why hoarfrost is often found near streams and ponds. 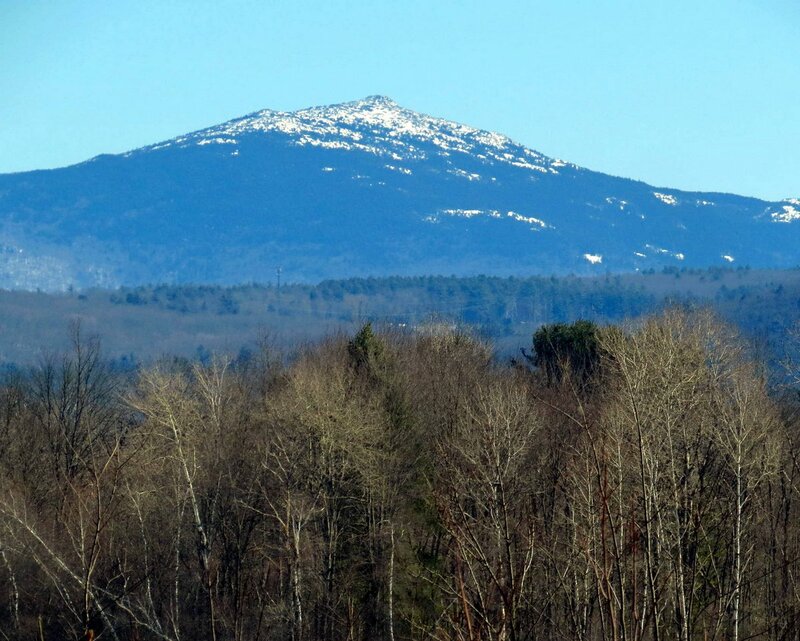 Mount Monadnock is an old friend, there in my earliest memories, and it is always at its most beautiful when snow frosts its peak. I would guess the snow must be at least 5 feet deep near the summit. I was up there with a friend of mine on April 19th one year and it was about chest deep in places. We had to climb over it and kind of swim through it rather than trying to break a trail through it. The air was warm and the snow was melting, and the fog generated by the cold snow and warm air mixing together was so dense you could barely see your hand at the end of an outstretched arm. I don’t think I’ve ever been as wet as I was that day. 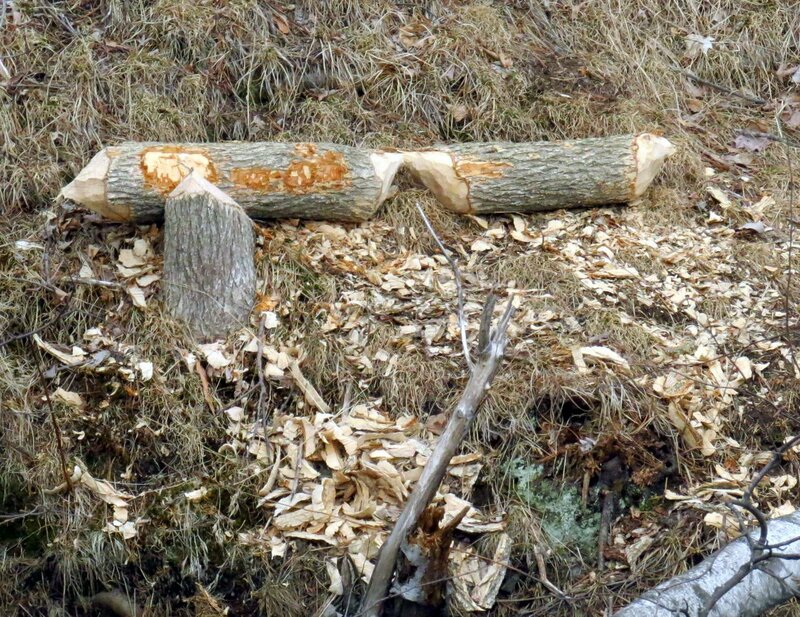 Tramp art was done by chipping and whittling a piece of wood with a pocket knife. Often pieces of wood from cigar boxes and orange crates were turned into picture frames and other household items which were sold for meager amounts of money. 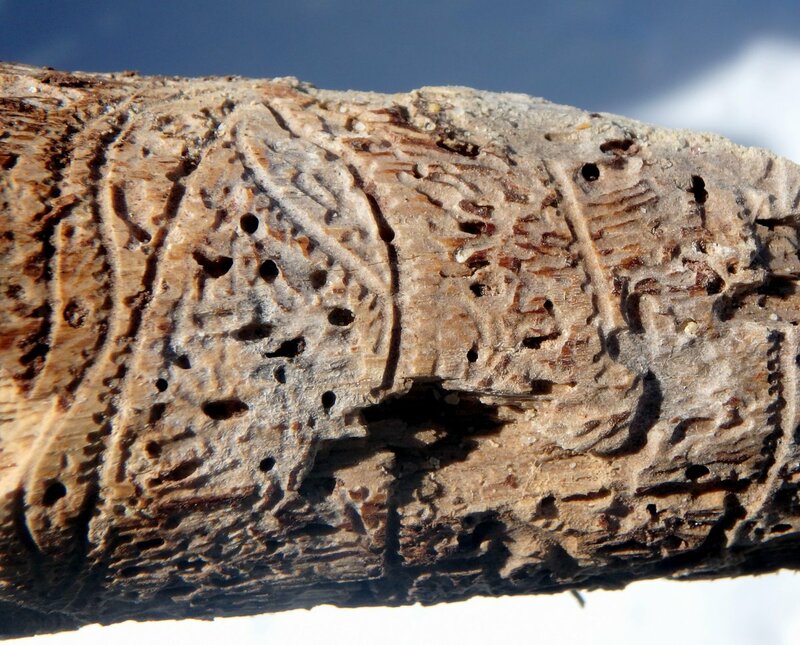 That’s what this piece of branch reminded me of when I saw it but the hand of man played no part in this art; it was made entirely by engraver beetles and was very beautiful, I thought. I wish I had kept it and brought it home but then if I had the next hiker to come along couldn’t have marveled at its insect carved hieroglyphics as I did. I’ve taken many photos of frullania liverworts throughout the winter but never posted any of them because it’s a tough plant to get a good shot of. It’s a leafy liverwort but each leaf is smaller than a house fly so it isn’t an easy subject. 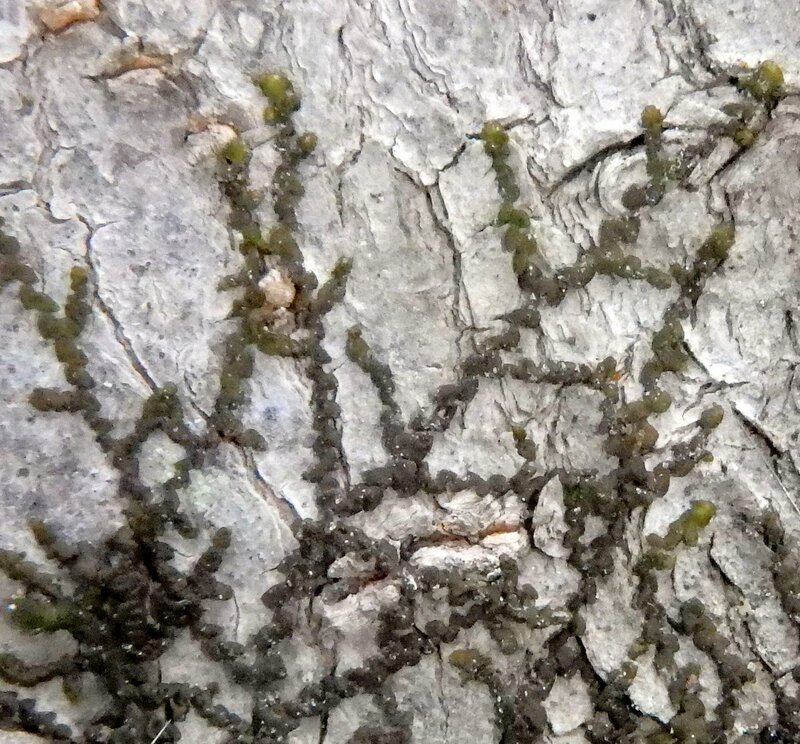 There are about 800 species of frullania liverworts and many grow as epiphytes on the bark of trees where the humidity is high. Epiphytic plants take nothing from the host plants they grow on; instead they simply perch there like birds. Mosses and lichens are also epiphytes. 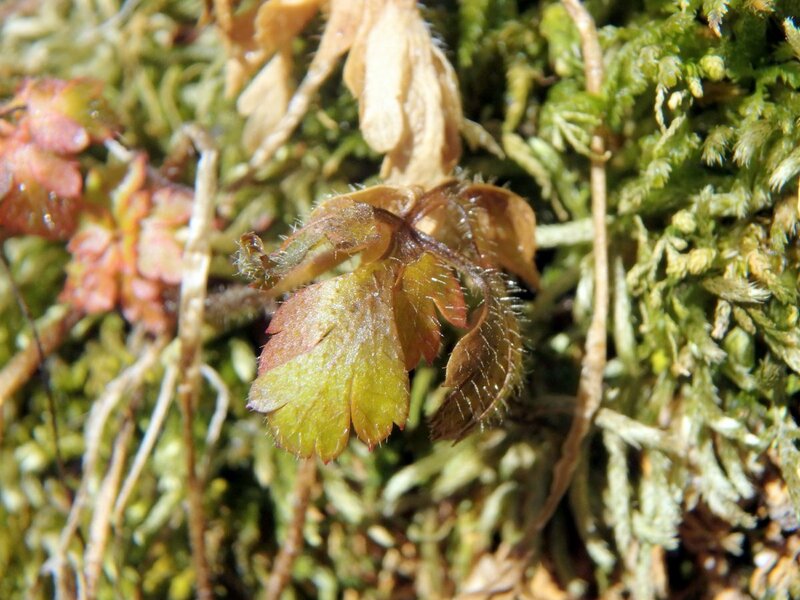 The liverwort’s tiny leaves are strung together like beads, and change from green to deep purple in cold weather. 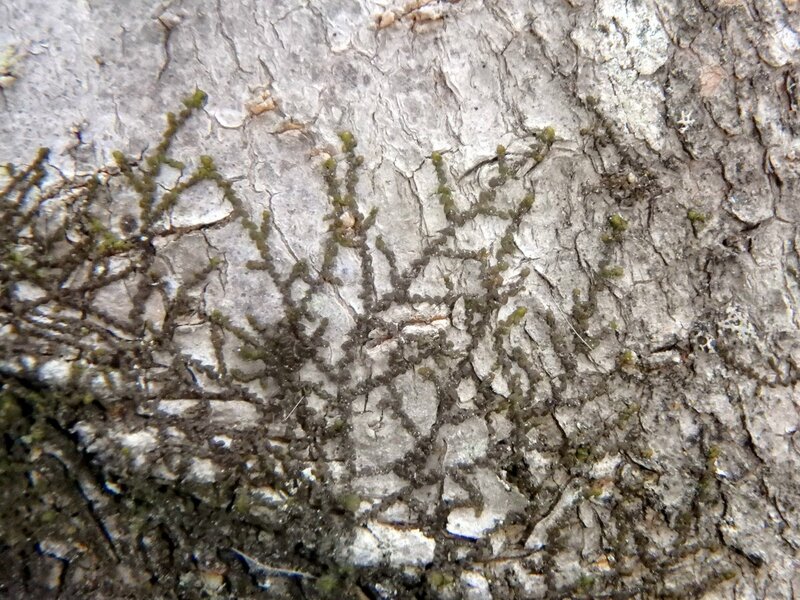 Frullania liverworts can cause a rash called woodcutter’s eczema in some people. It’s an annoying, itchy rash but doesn’t cause any real harm, and it disappears in a week or two if you stop handling logs with liverworts on them. 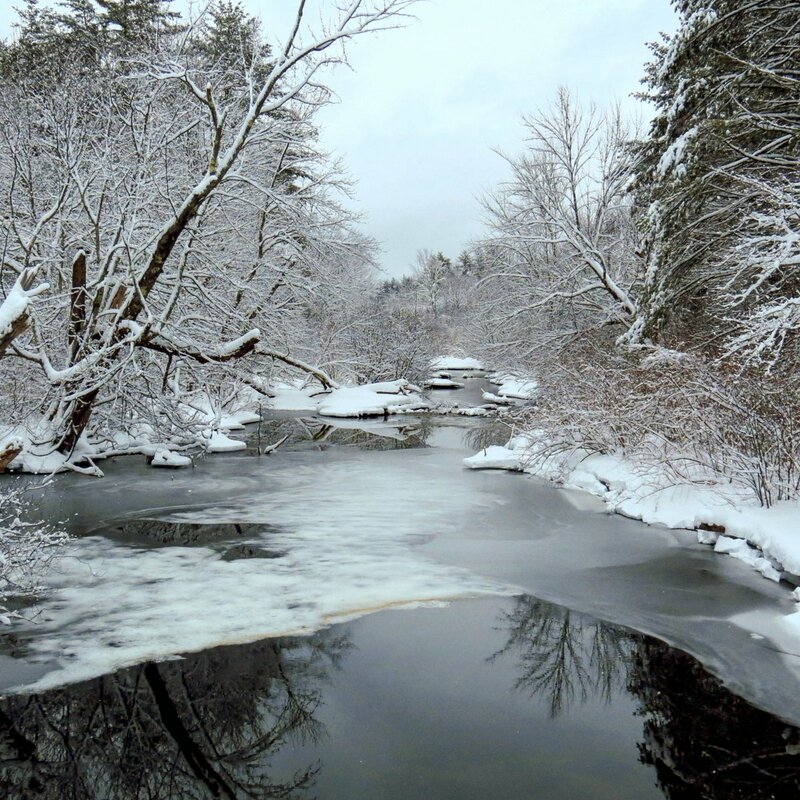 This post started with winter but it will end with spring, and that illustrates how quickly one season can change into another here in the northeast. Sometimes it’s as if someone flipped a switch, and it’s what inspired Mark Twain’s “If you don’t like the weather in New England just wait a few minutes” quote. 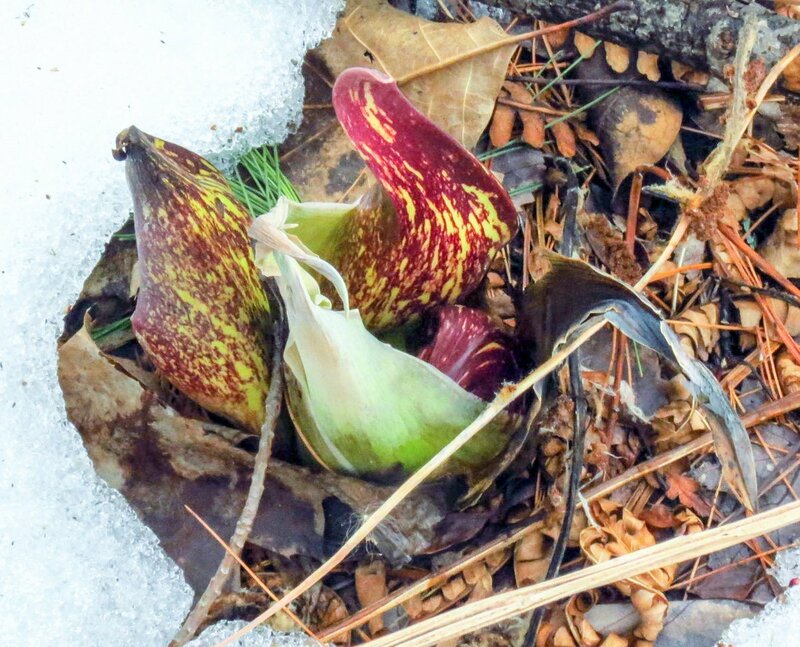 Here our earliest flowering plant, the skunk cabbage (Symplocarpus foetidus,) has finally shown its mottled yellow and maroon flower spathes. Some are yellow with maroon spots and some are maroon with yellow spots. It’s good to finally see them no matter what colors they choose to wear. 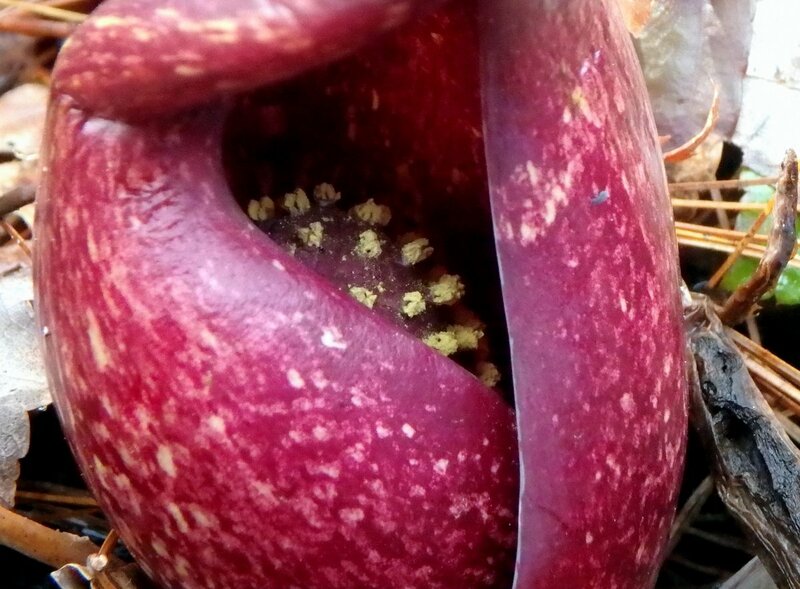 The spathes shown here appear first and multiple flowers grow inside the spathe on a spadix. Soon the spathes will begin to open so insects can enter and pollinate the tiny flowers, and so a photographer or two might get some photos of them. 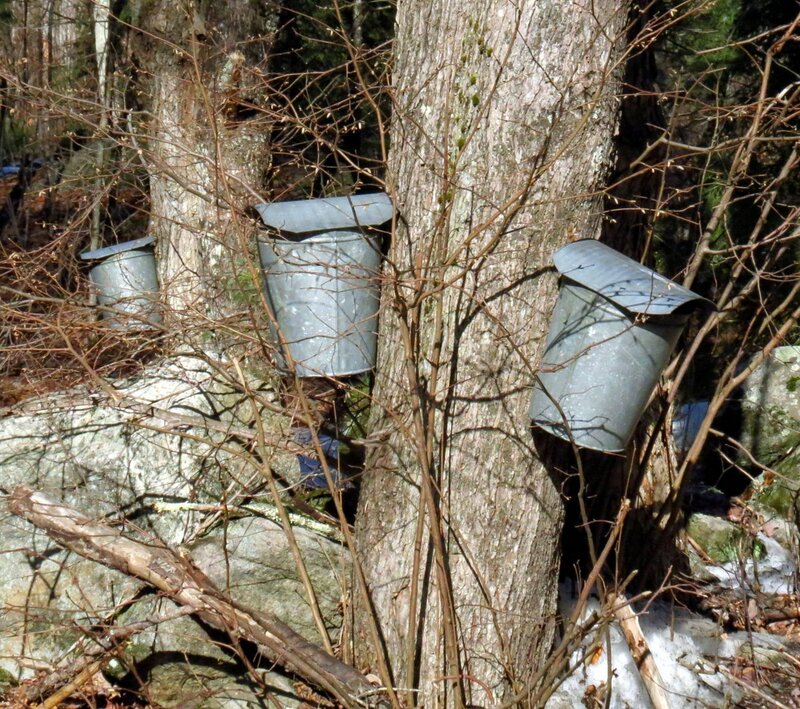 Sap collecting has begun but you’d hardly know it these days. 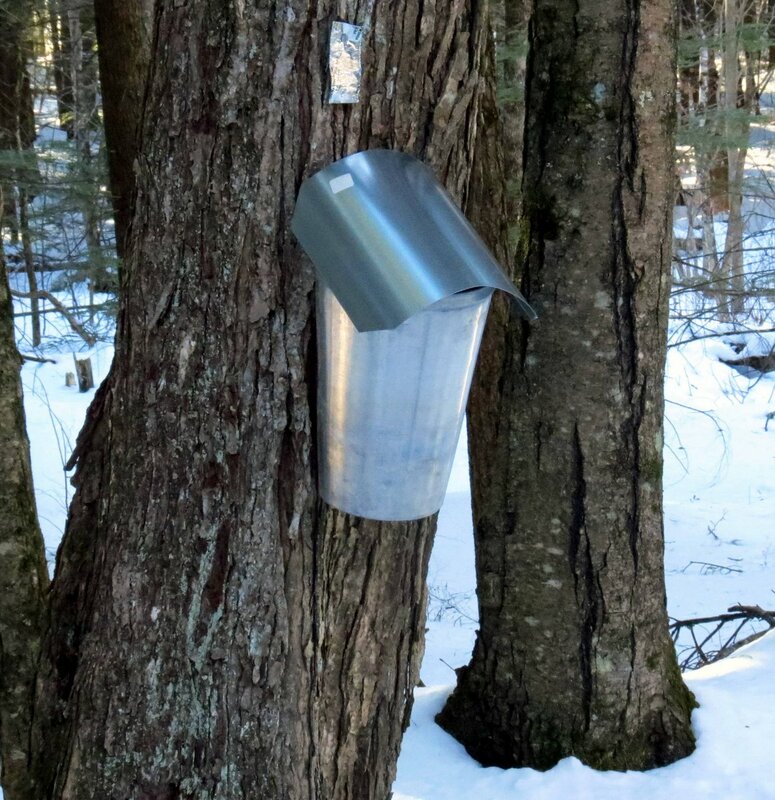 When I was a boy it seemed like every yard had trees with sap buckets hanging from them in spring but I had to search long and hard to find just a few this year, and I fear family sap gathering a dying art. Nobody knows when or where sap gathering started but most agree that it was learned from Native Americans. 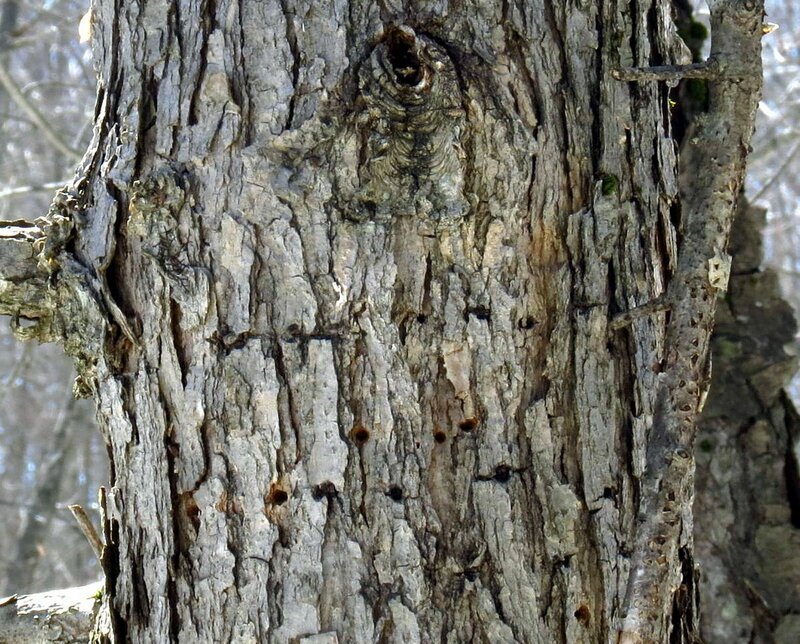 They used to cut a V notch into the bark of a tree and then put a wedge at the bottom of the cut. 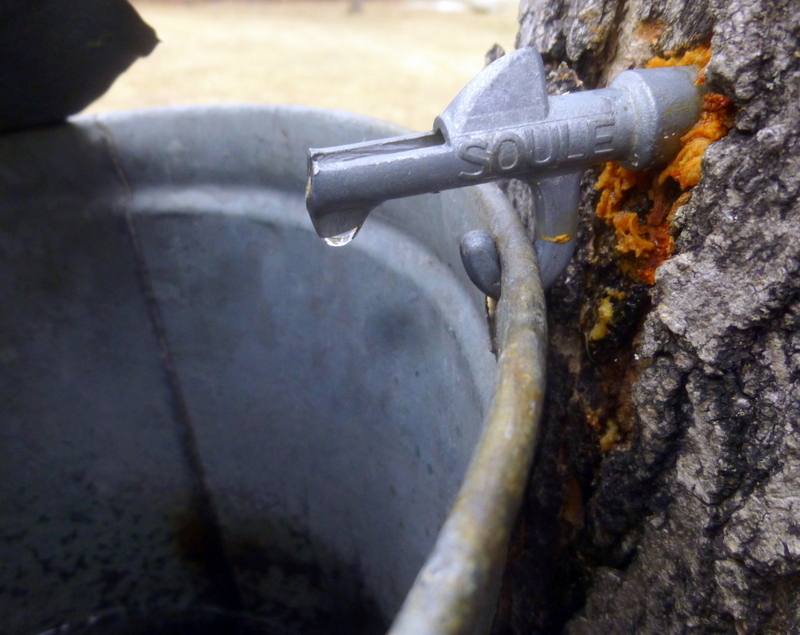 The sap would drip from the wedge into buckets made of bark or woven reeds, or sometimes into wooden bowls. They would then boil it down until it thickened and became syrup. 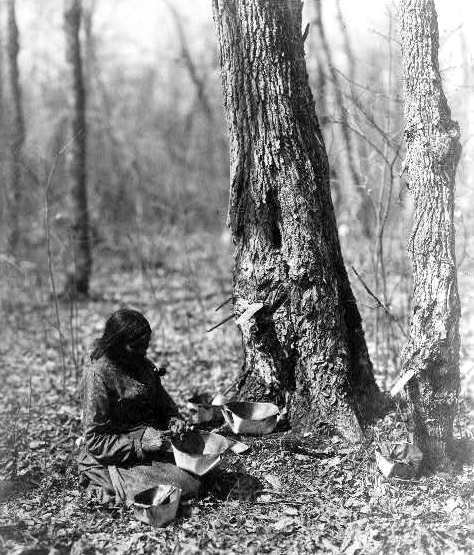 This Library of Congress photo from the early 1900s shows a Native American woman tapping trees and gathering the sap in what appears to be bark buckets, which it looks like she is making. Birch bark buckets are entirely plausible since they made canoes from the same bark. 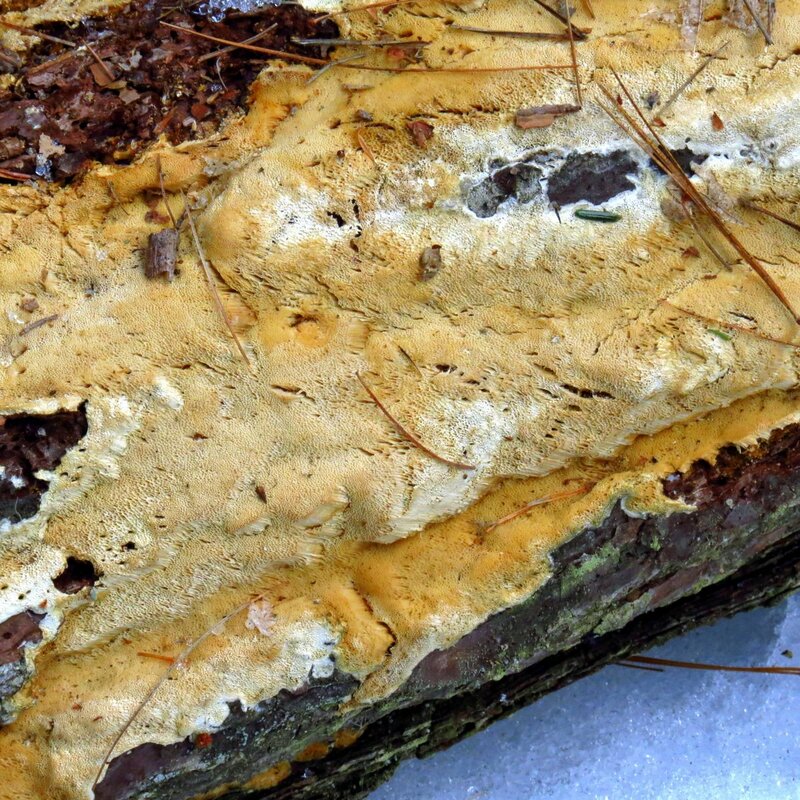 Sticky pine or spruce sap on the seams made their canoes leak proof. Since it takes about 40 gallons of sap to make one gallon of syrup sap gathering was a lot of work, and it was almost always done by the women of the tribe. There are many legends about how Natives discovered the process but nobody really knows for sure. Red and silver maples as well as sugar maples were tapped. 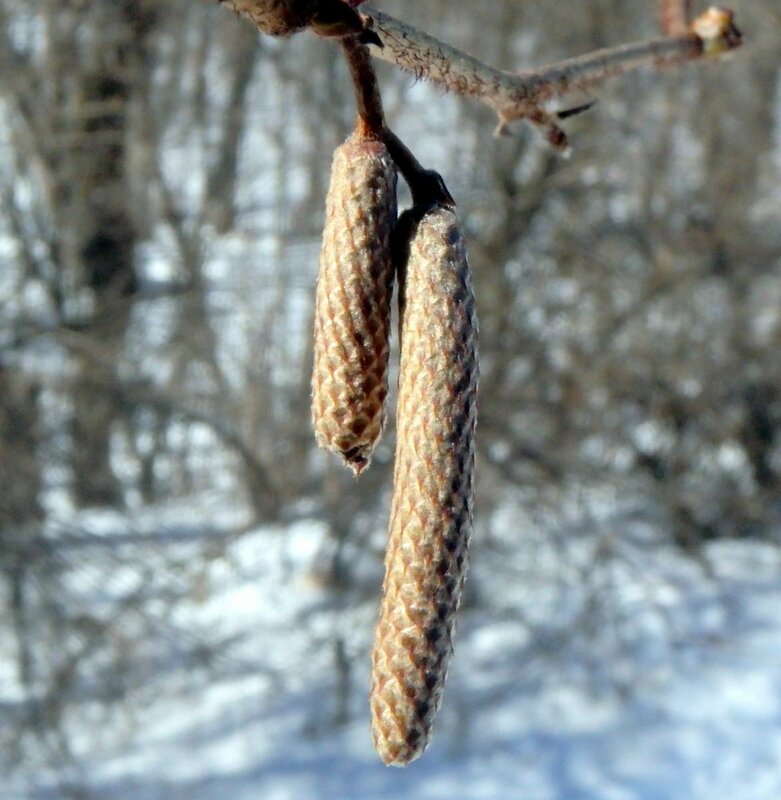 So were hickory, box elder and birch, though in those trees the sap was less sweet. 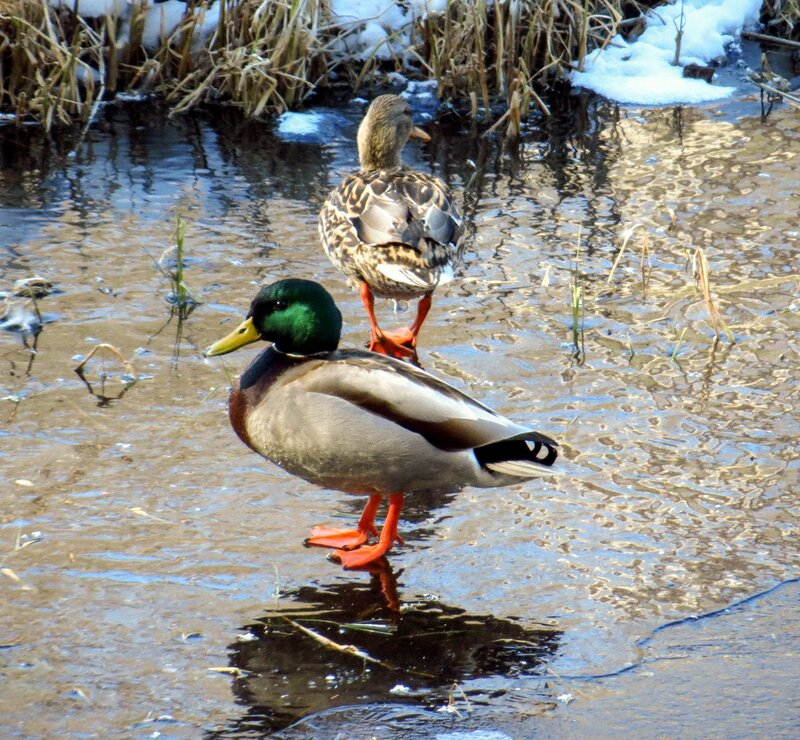 I’ve read about mallards migrating and some articles say they do and others say they don’t, so I’m not sure if this photo is a true sign of spring but I saw these two dancing on the ice at a local swamp, most likely hoping for it to hurry up and melt like the rest of us. I thought it was a pretty, spring like scene.